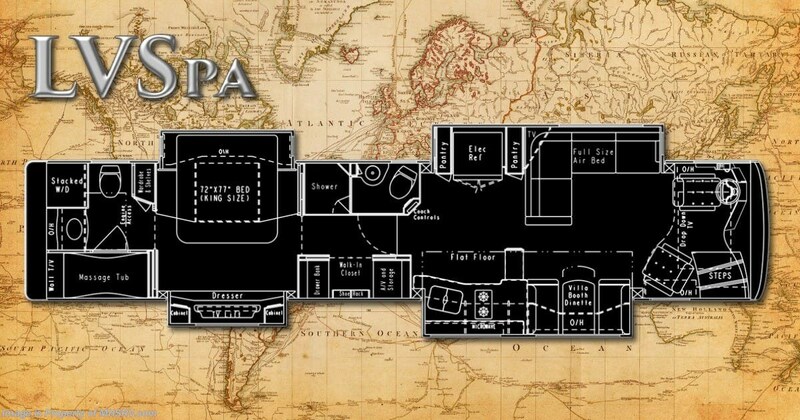 M.S.R.P. 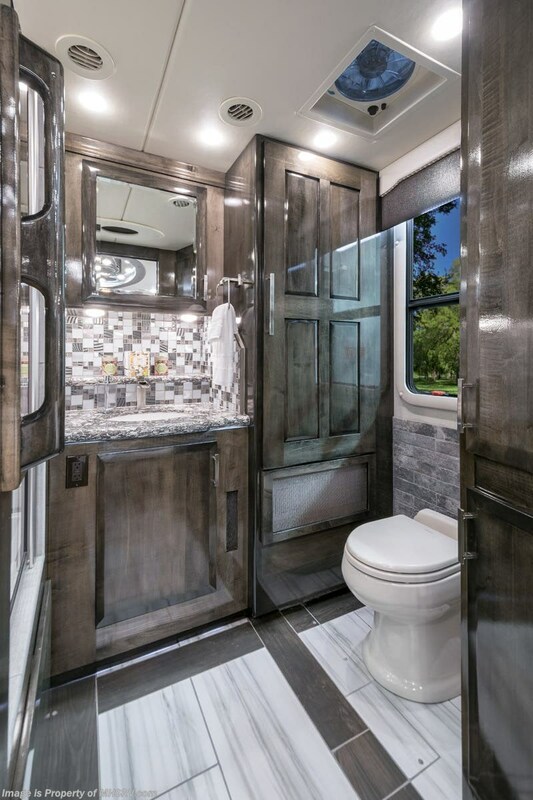 $1,231,810. 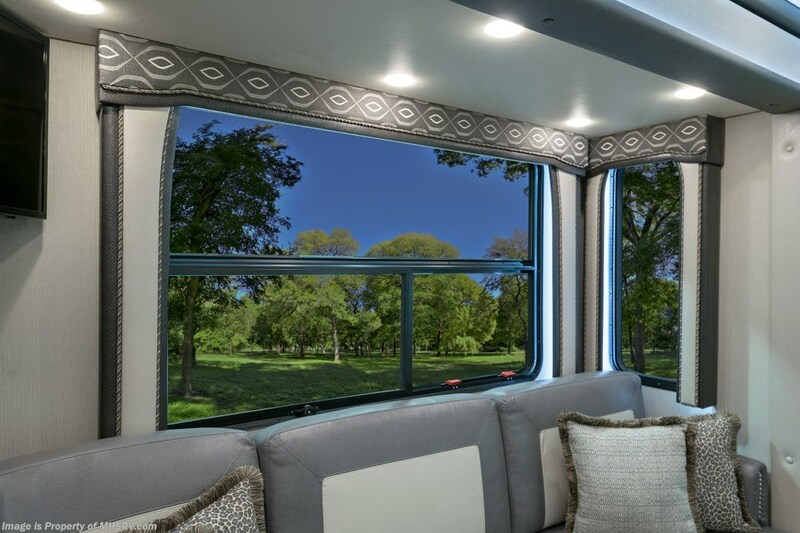 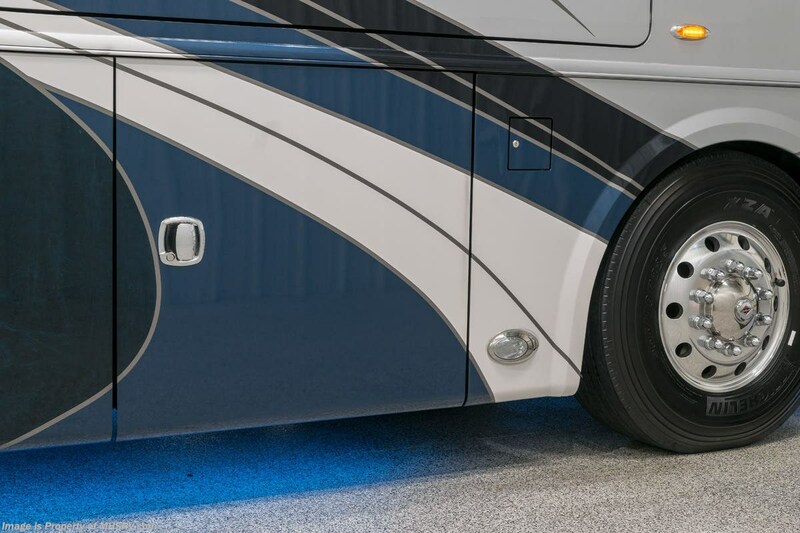 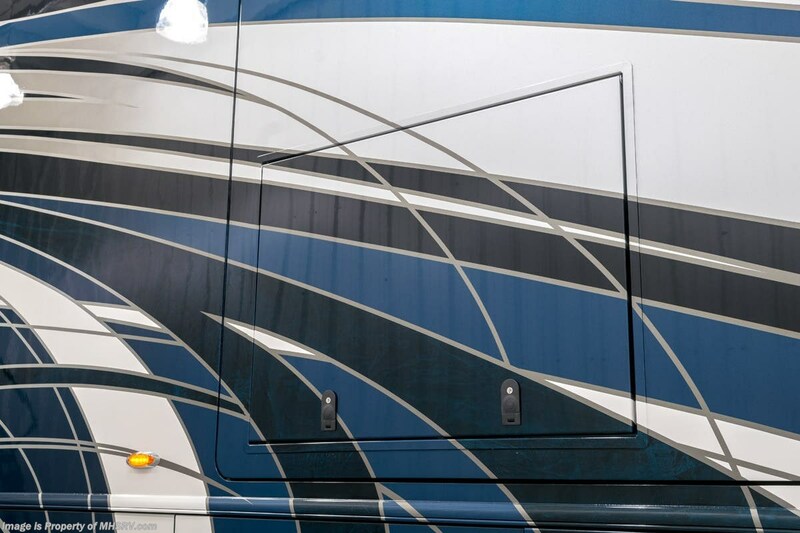 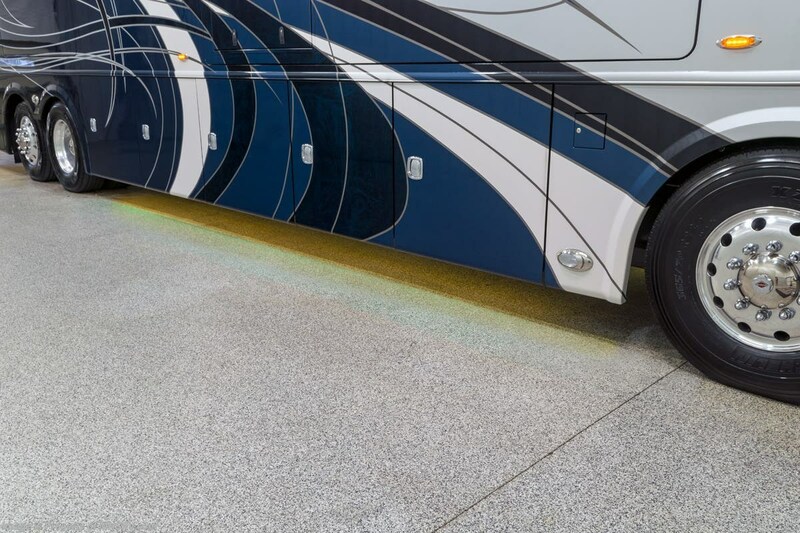 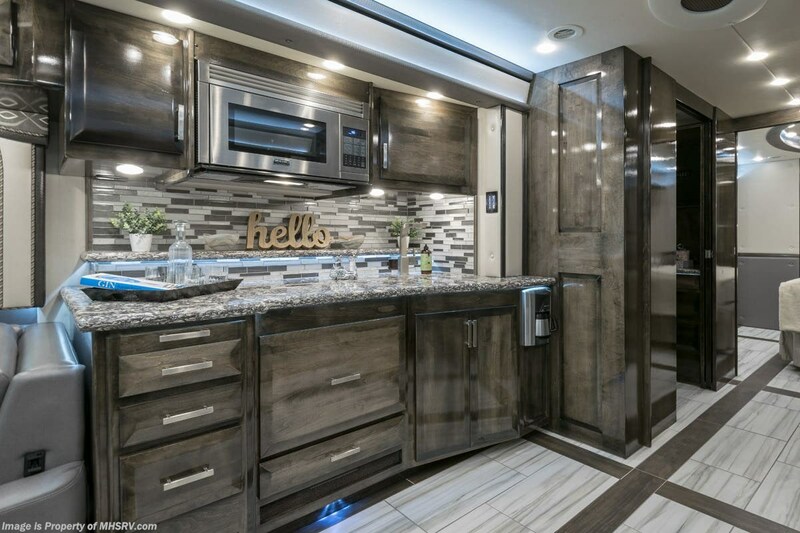 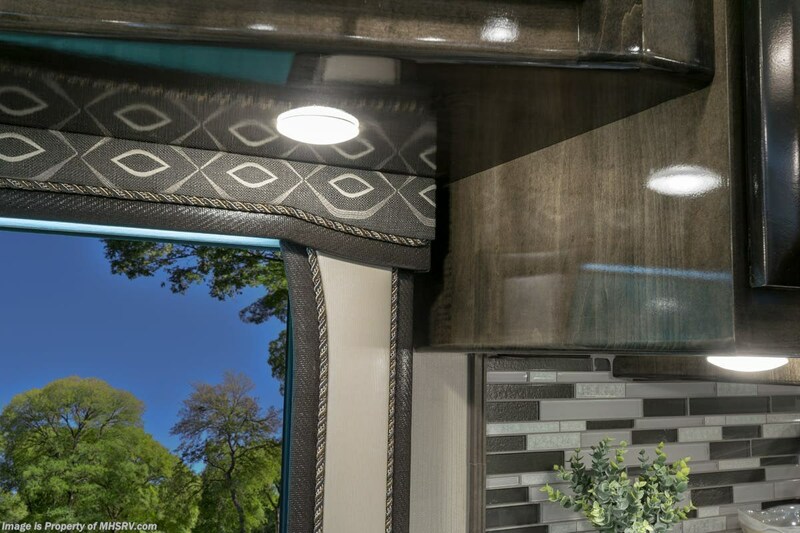 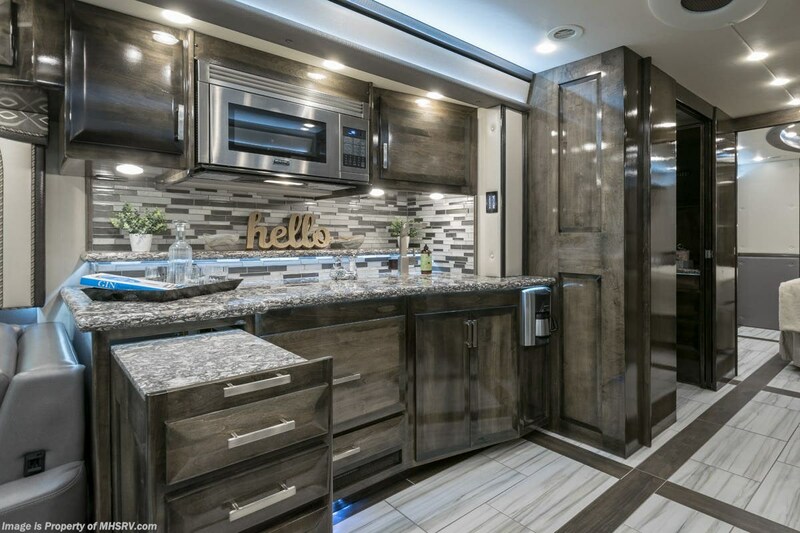 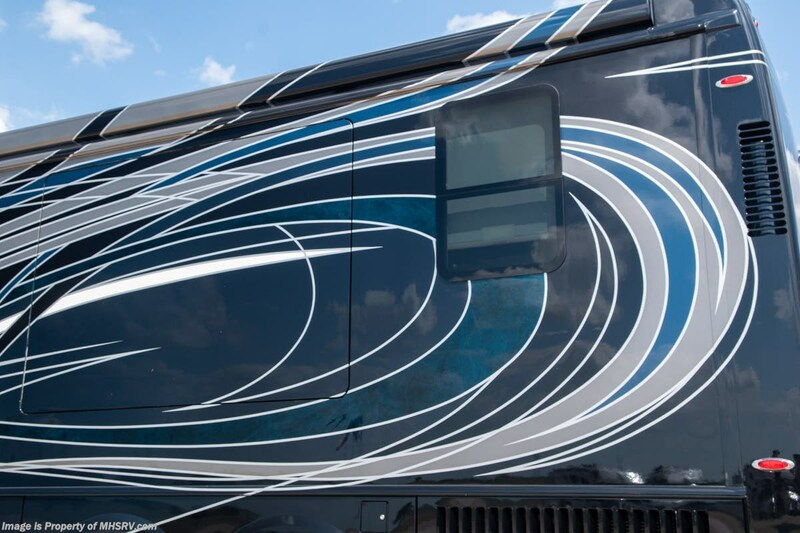 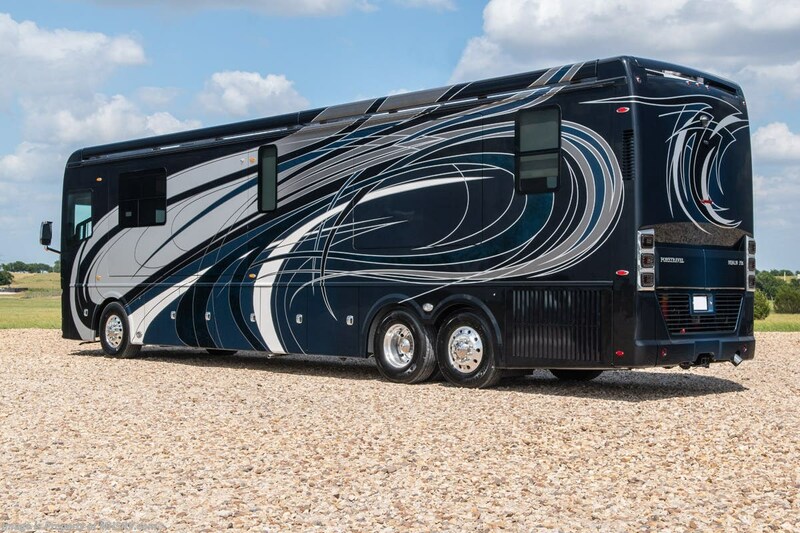 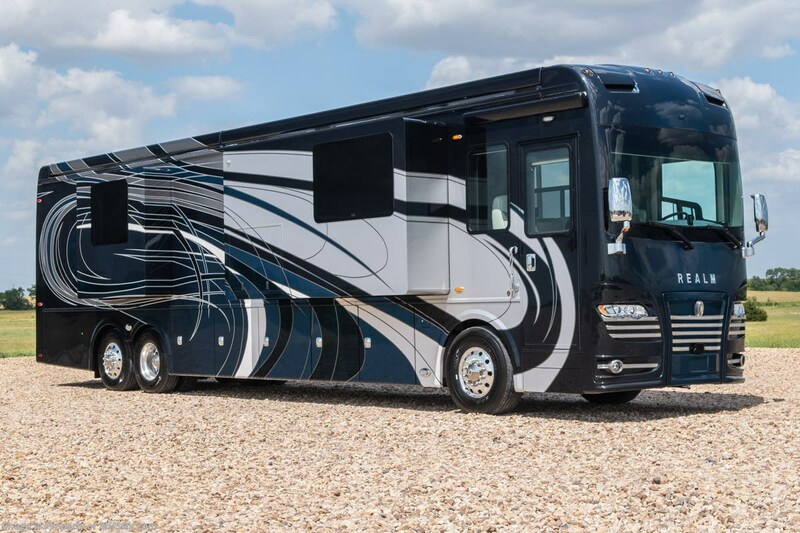 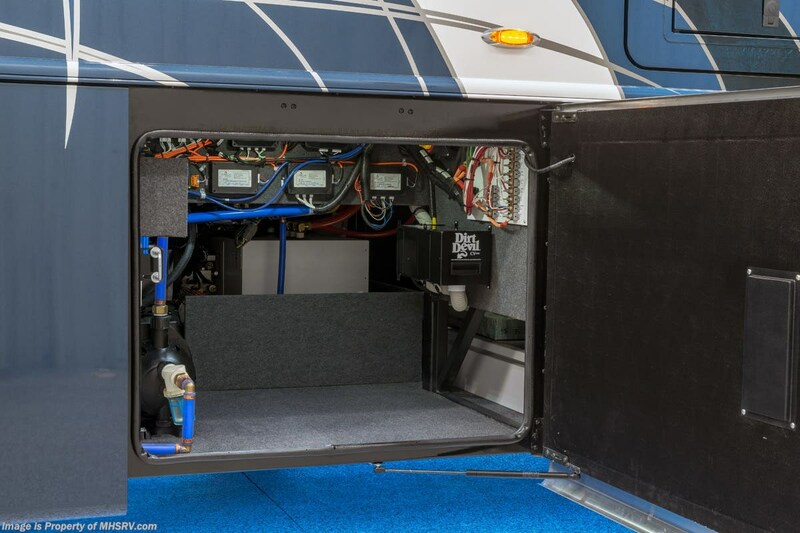 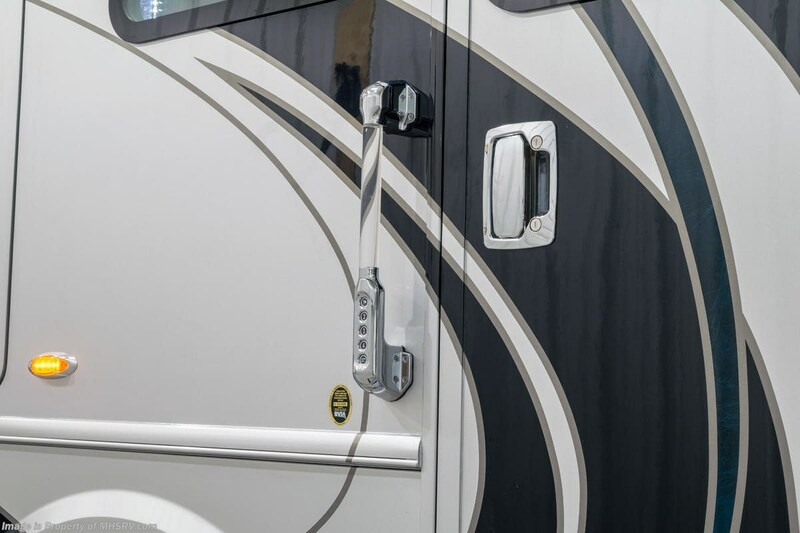 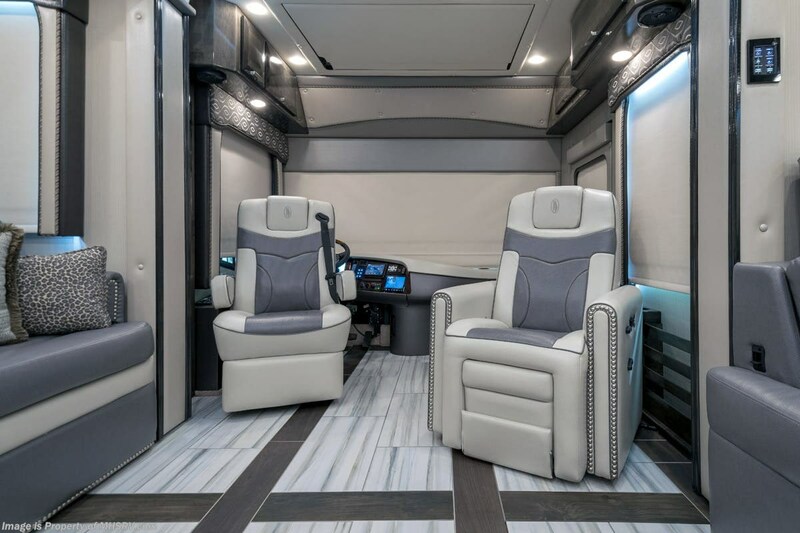 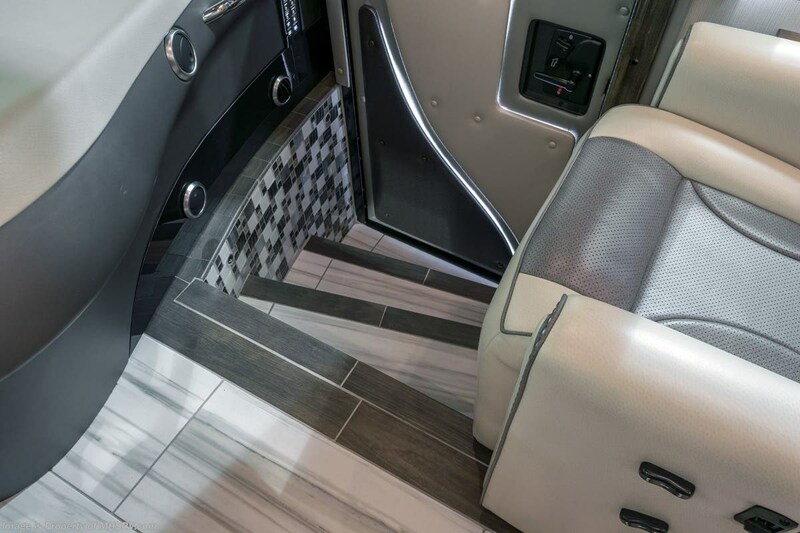 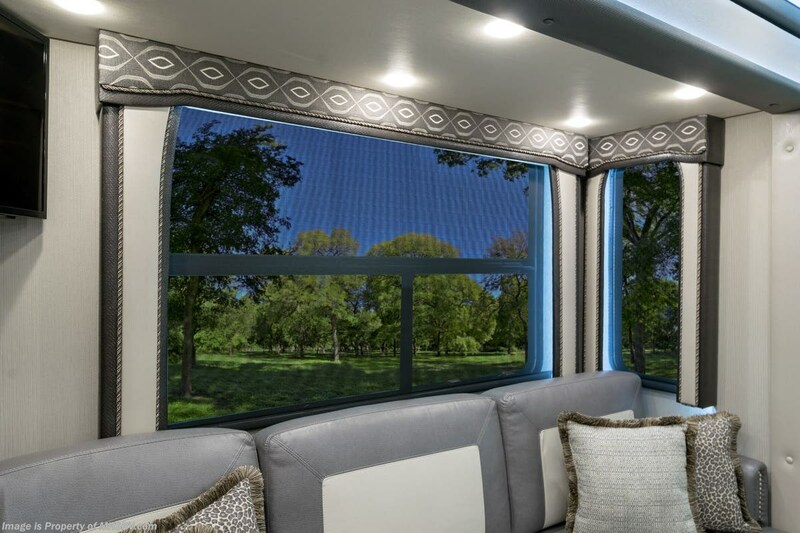 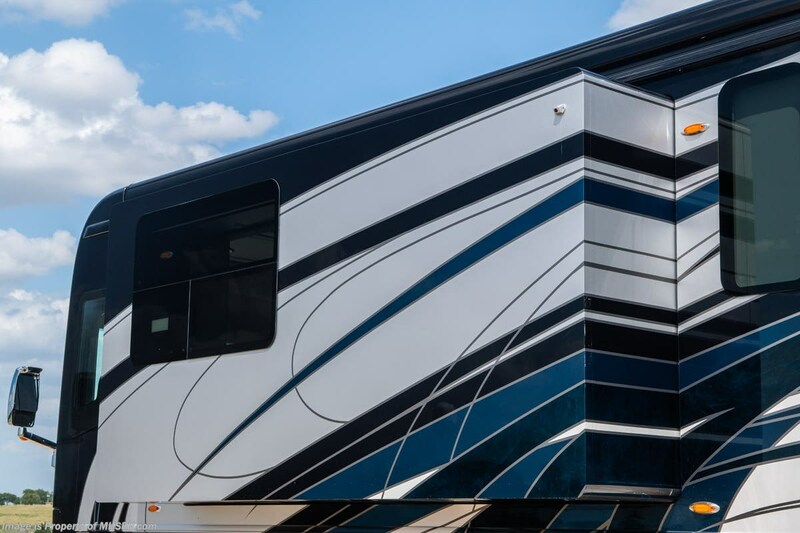 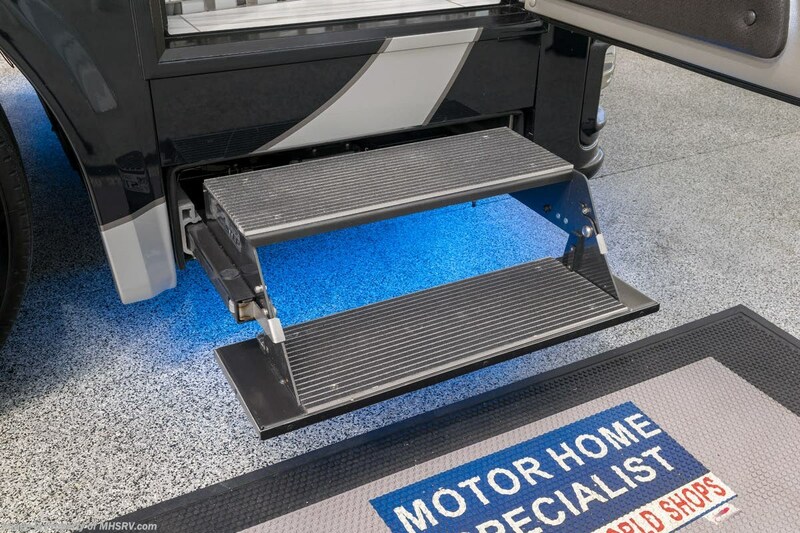 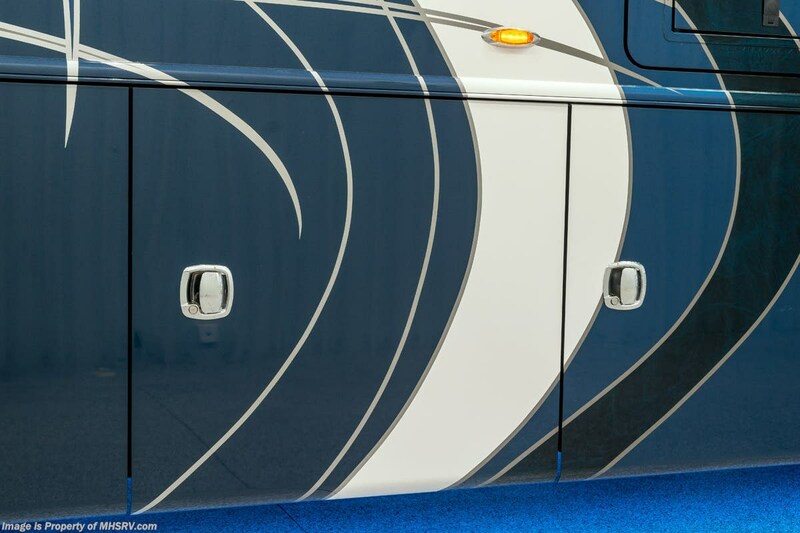 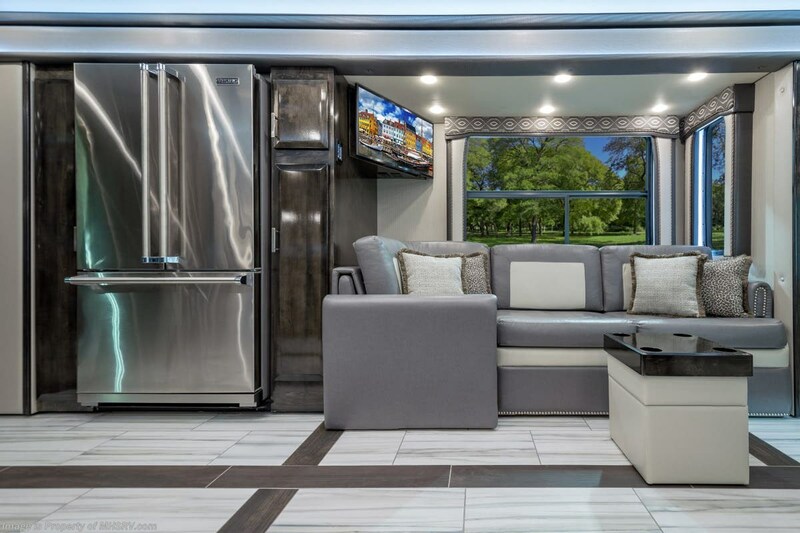 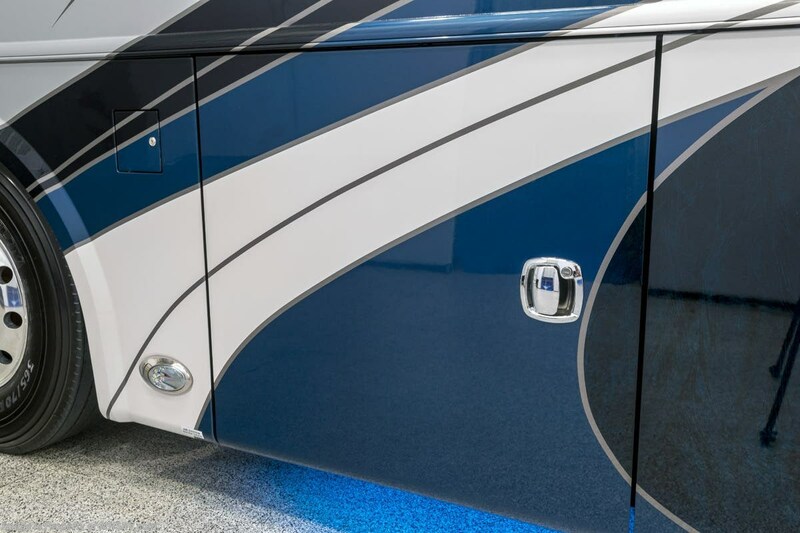 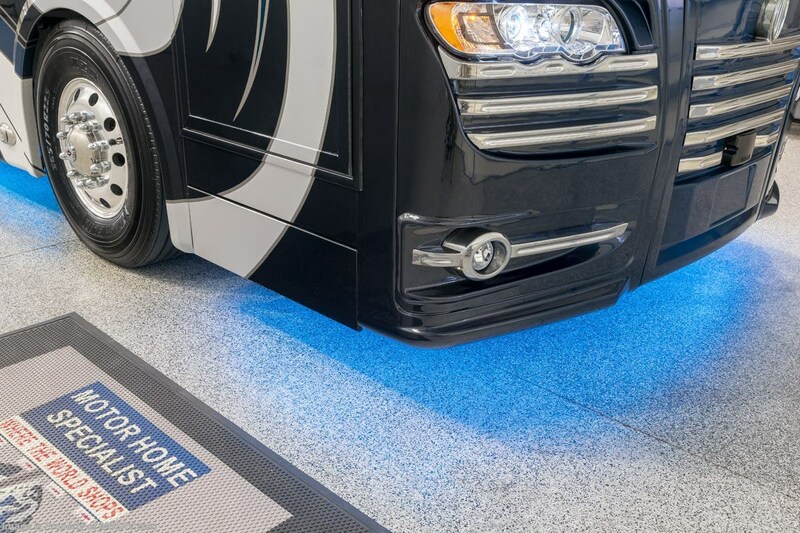 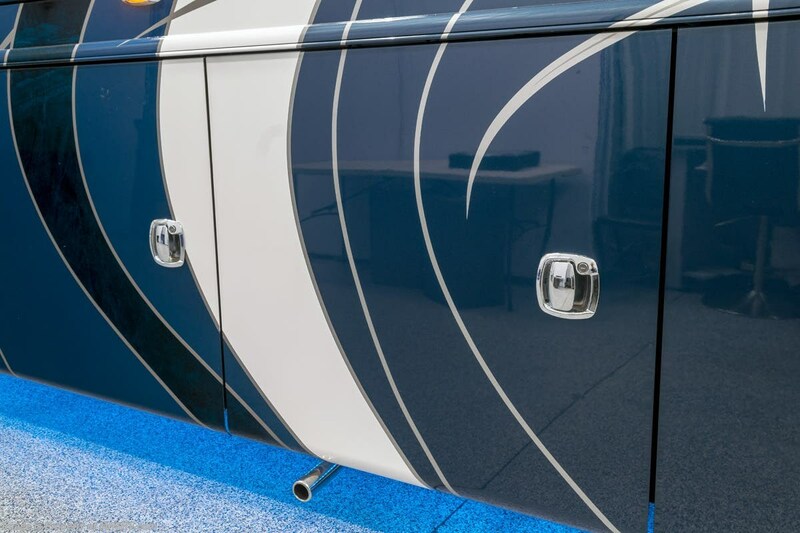 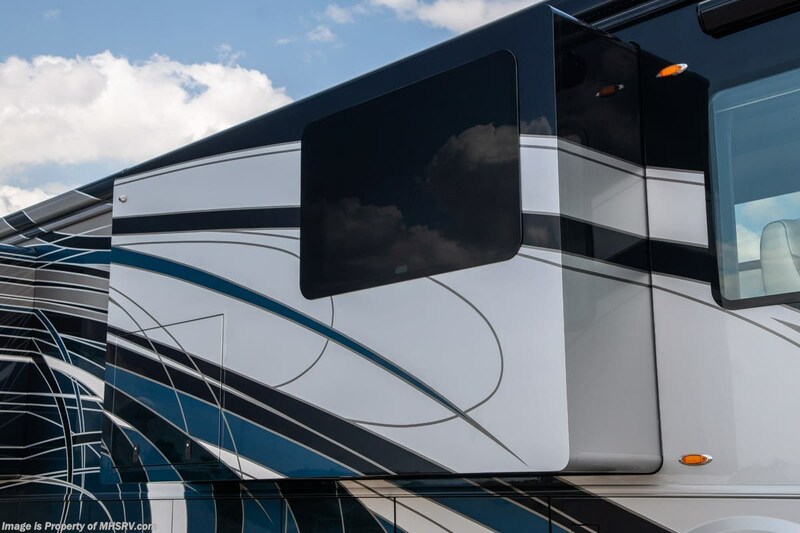 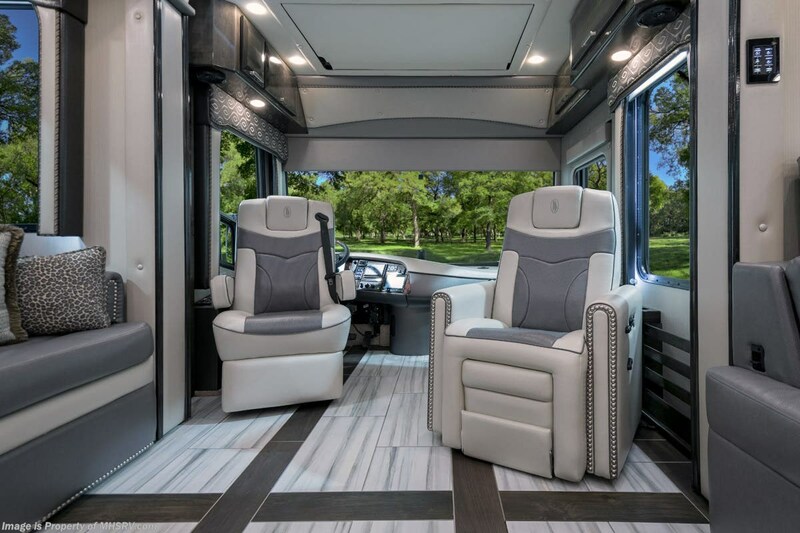 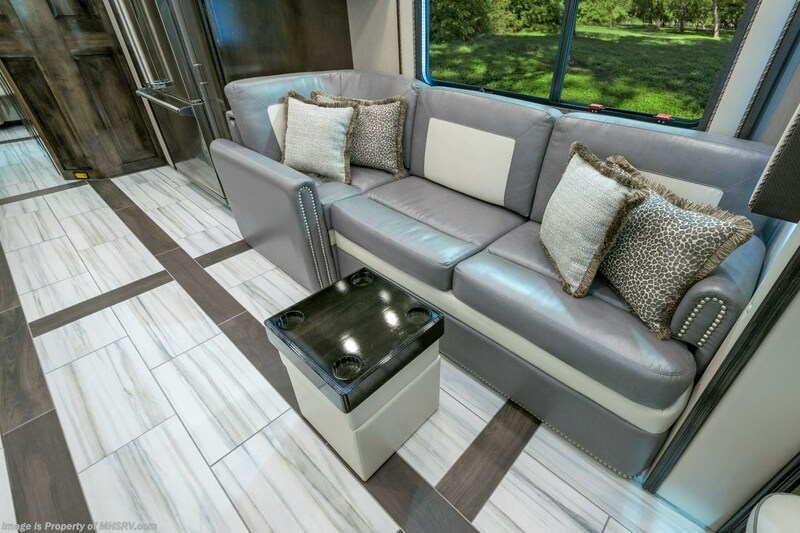 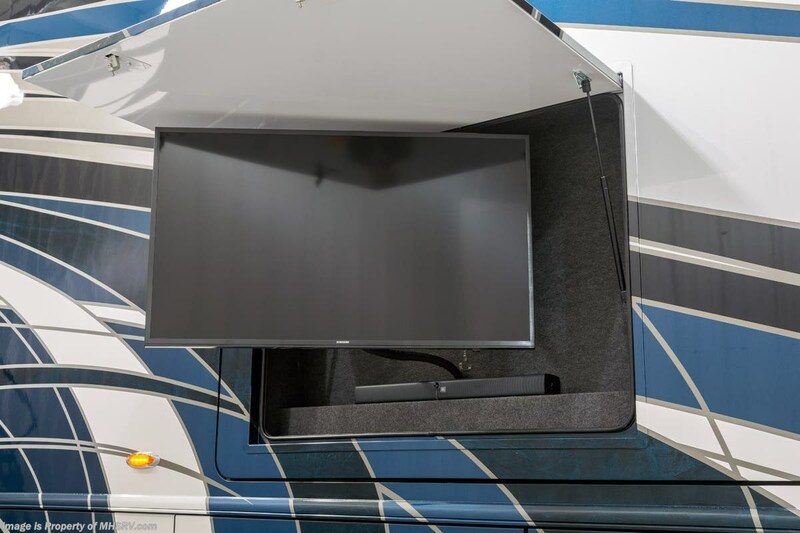 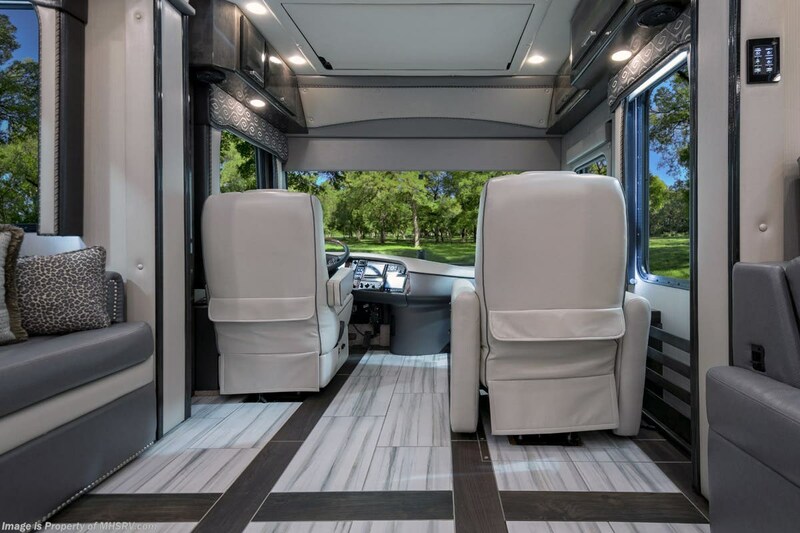 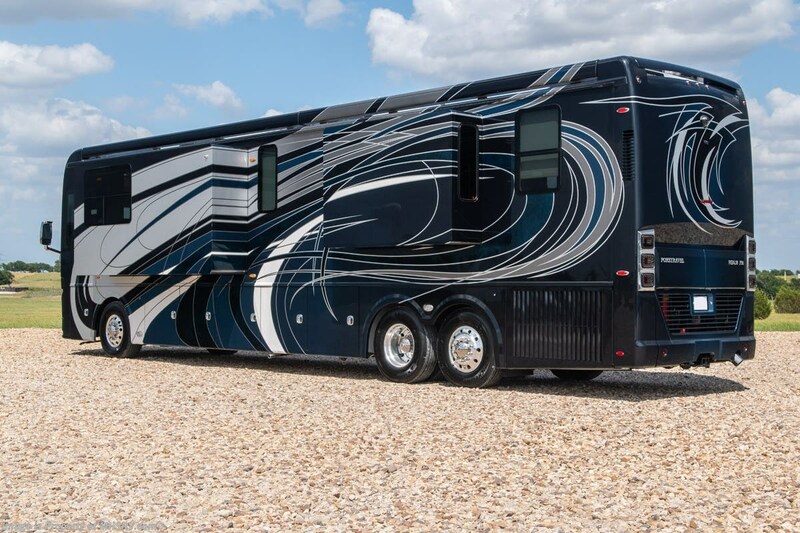 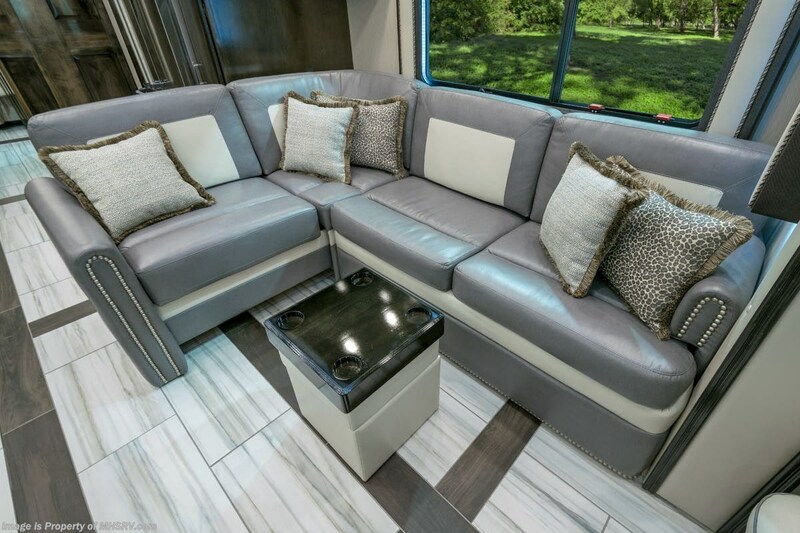 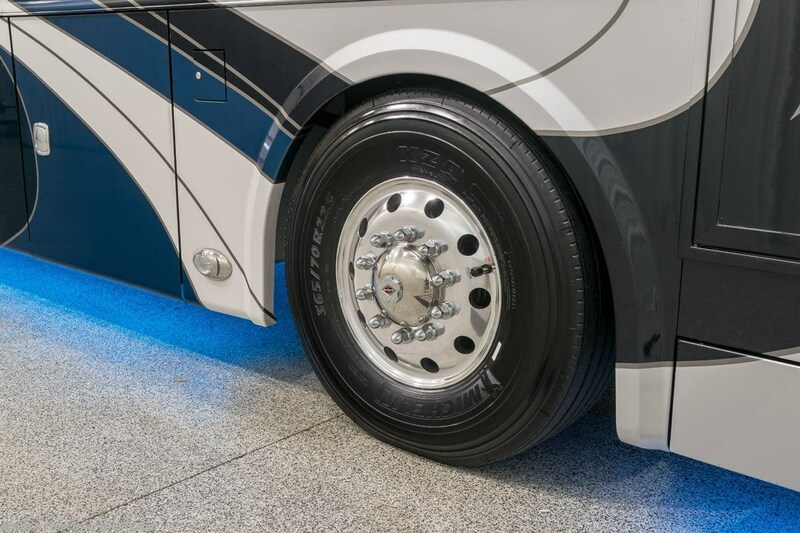 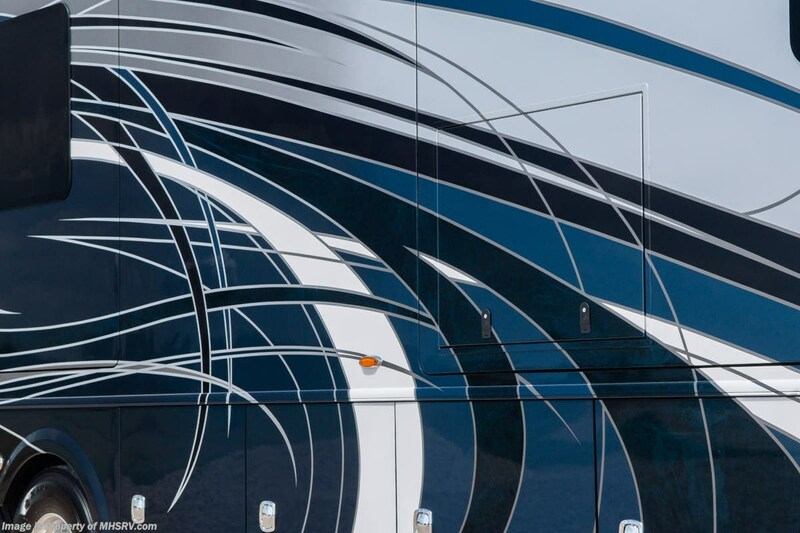 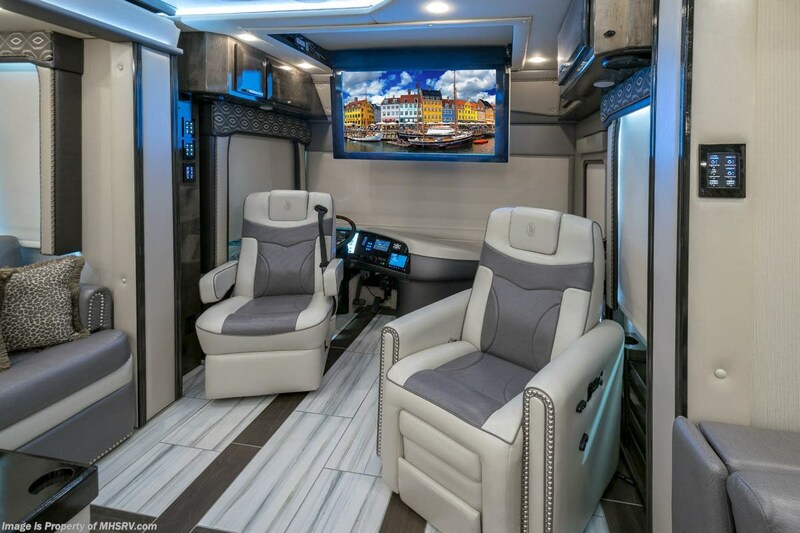 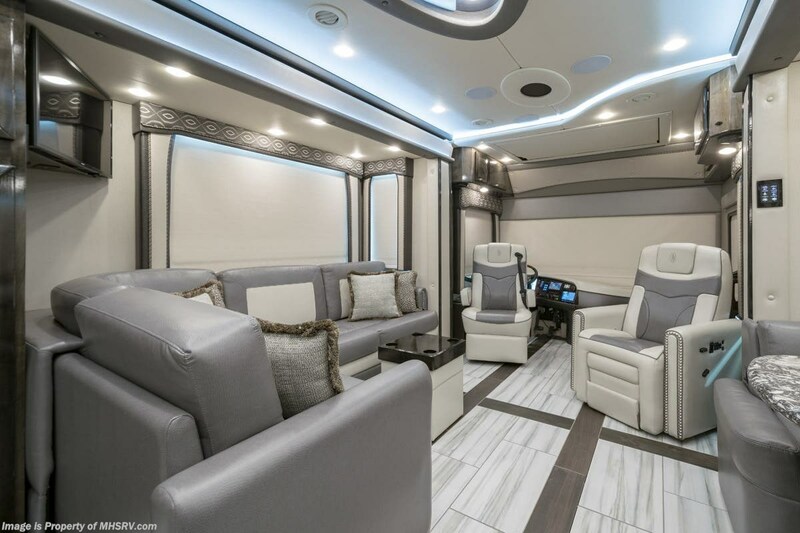 The 2019 Foretravel Realm FS6 is, not only, the premium luxury Motor-Coach on the market today, but the only coach in the industry built on Spartan's Premier K4 chassis offering incomparable ride, handling and safety. 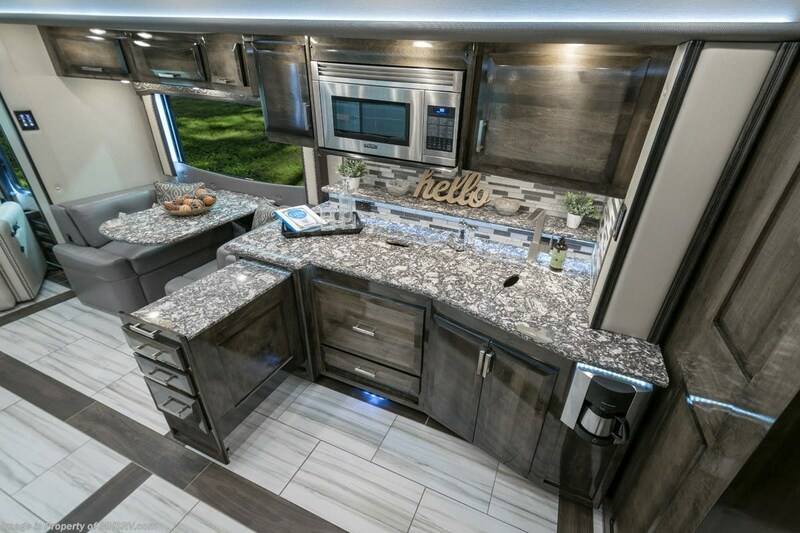 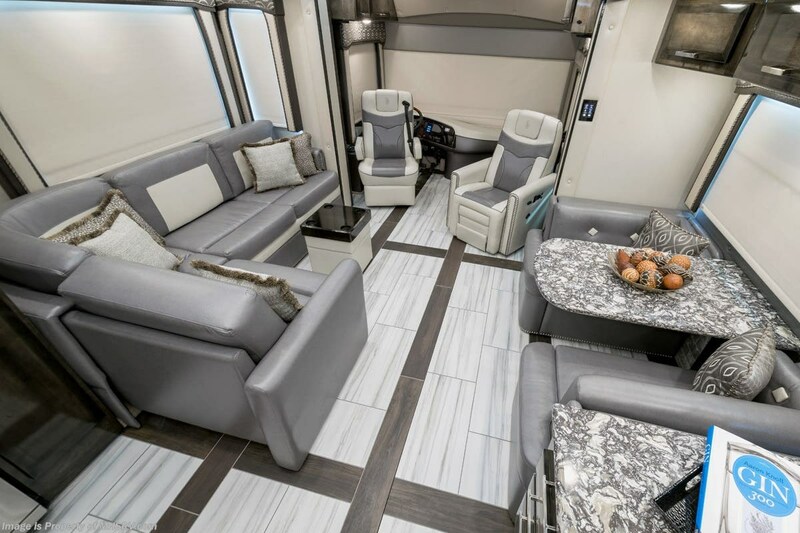 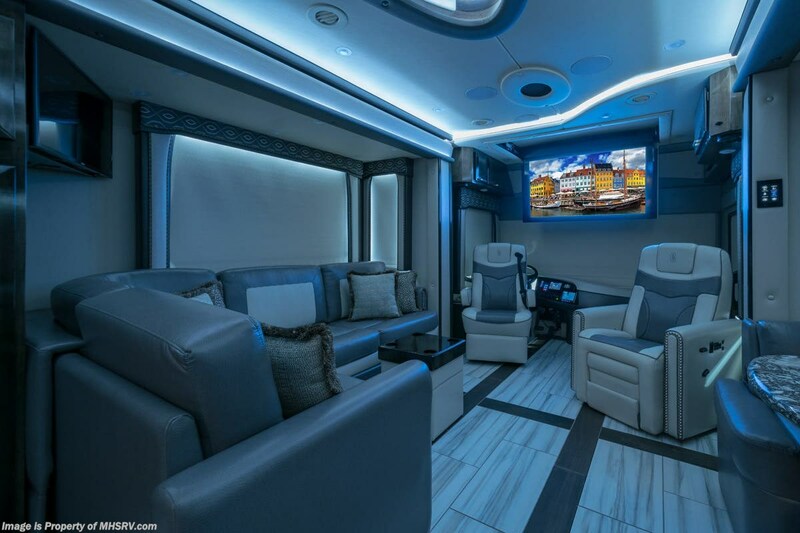 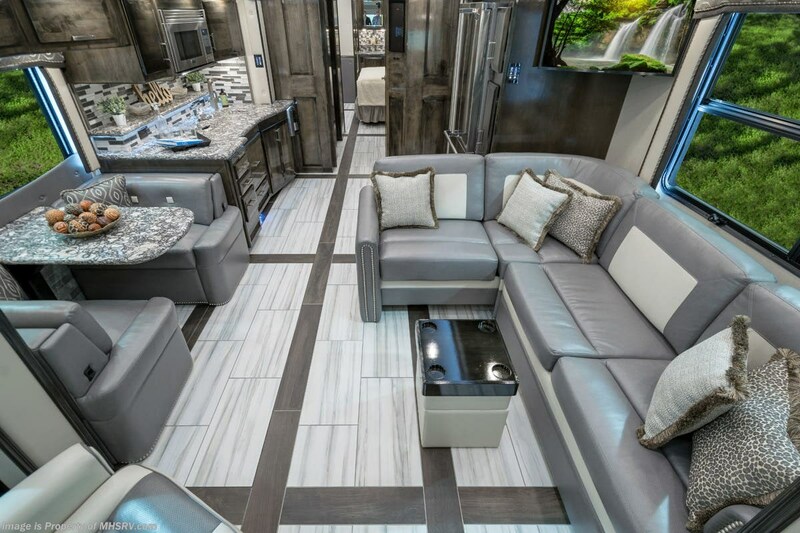 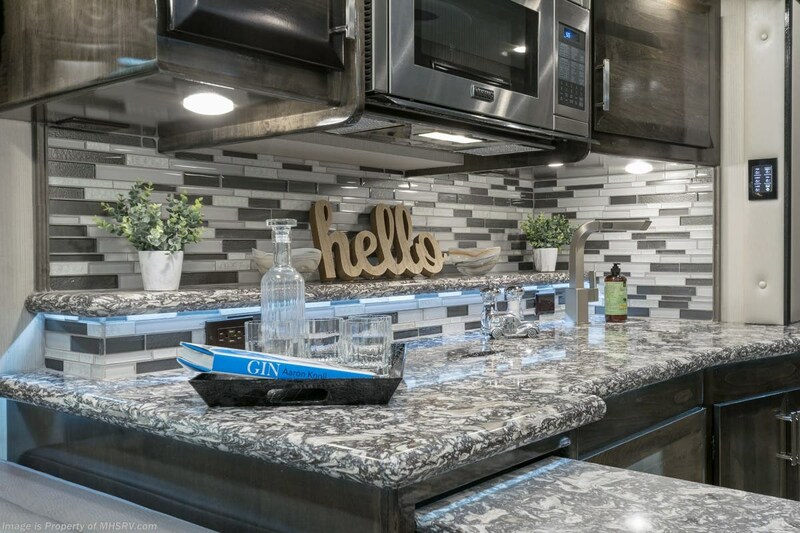 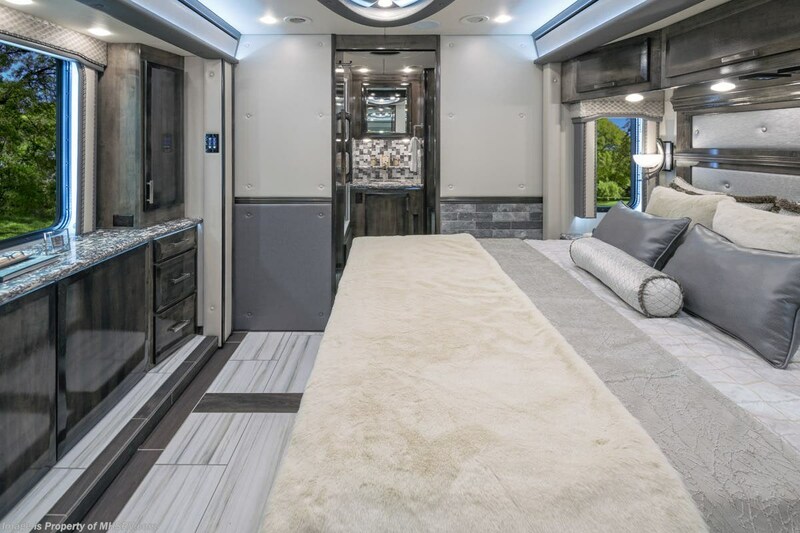 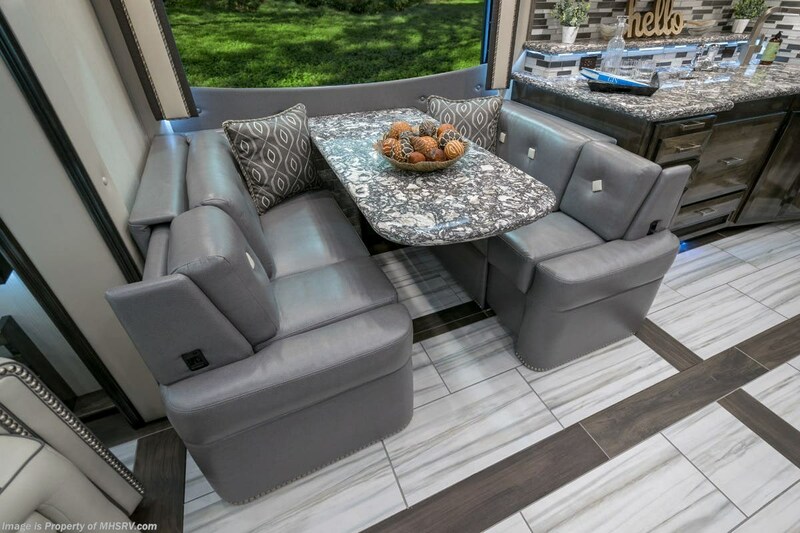 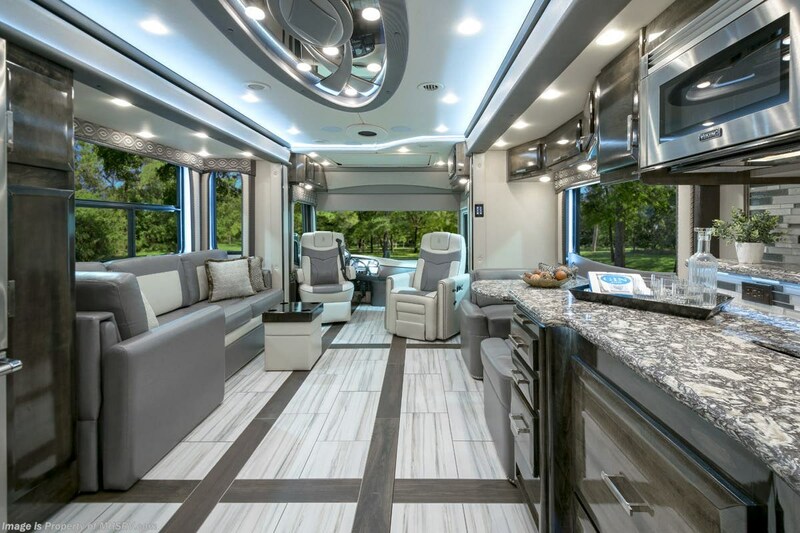 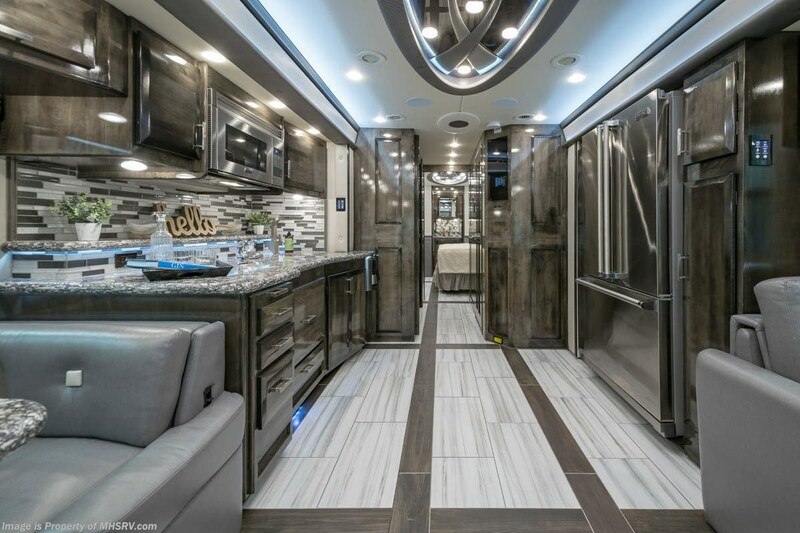 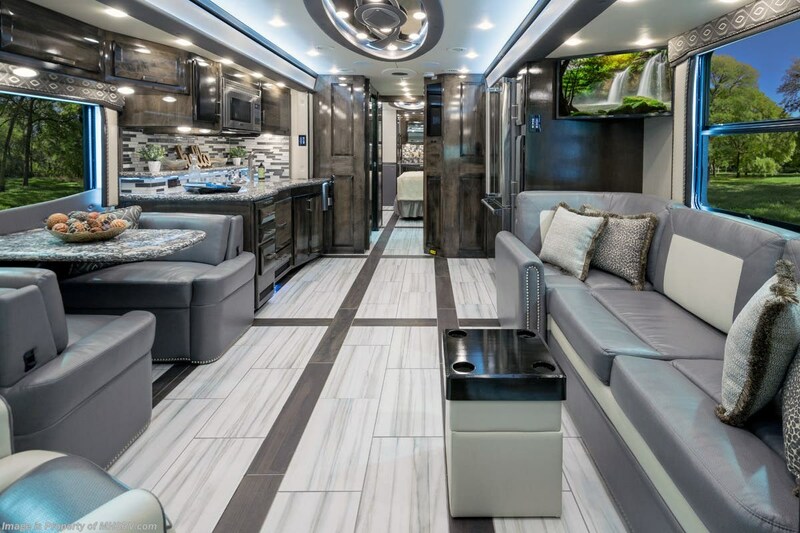 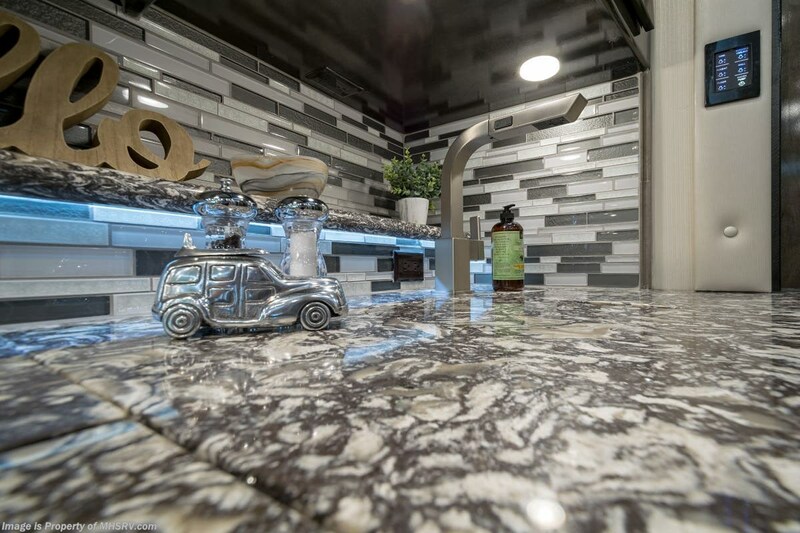 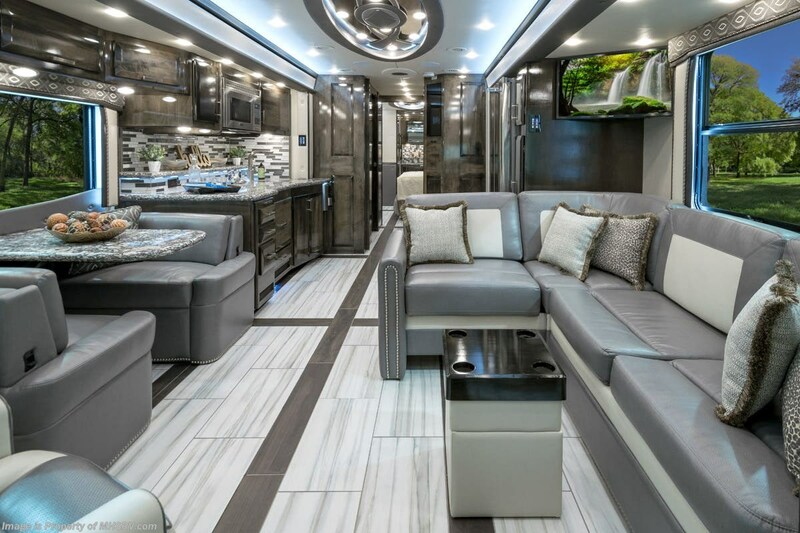 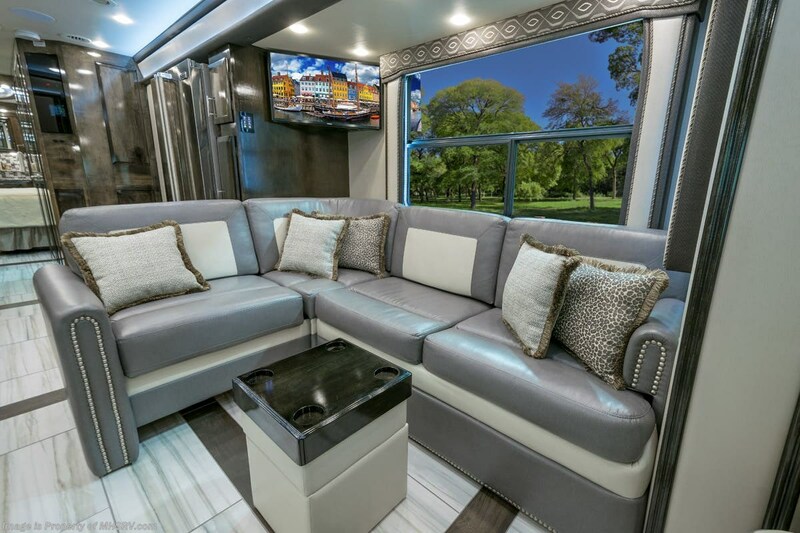 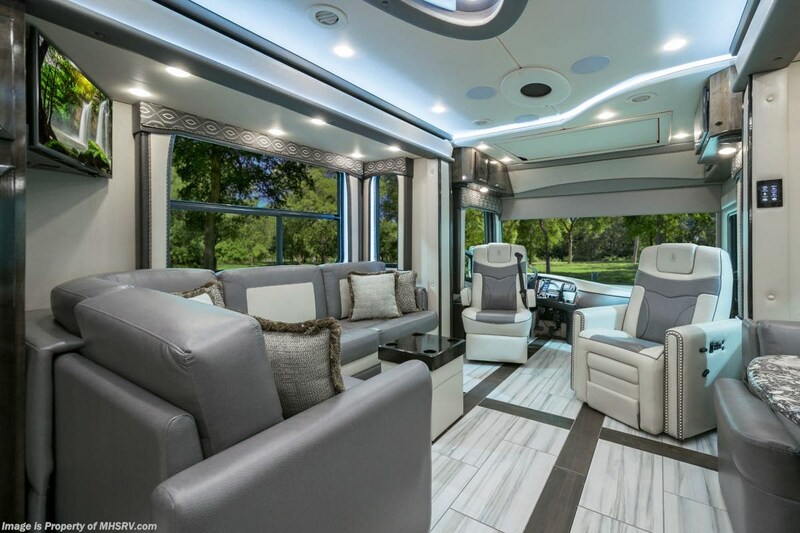 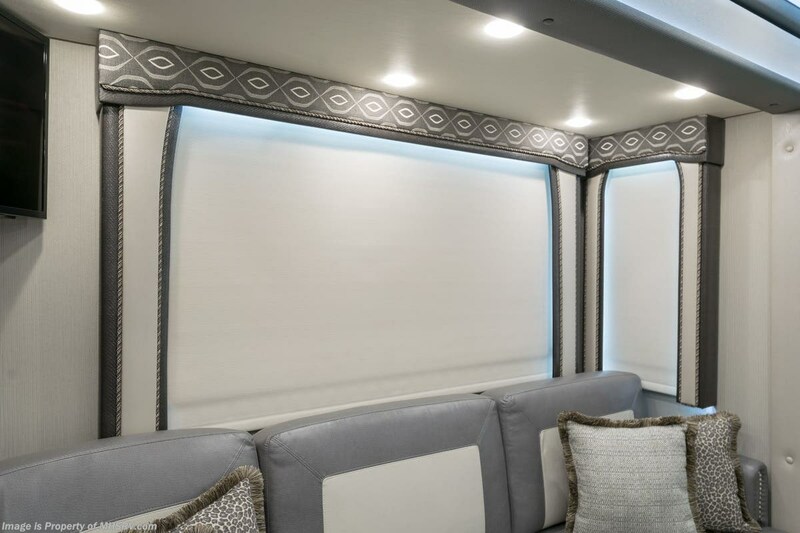 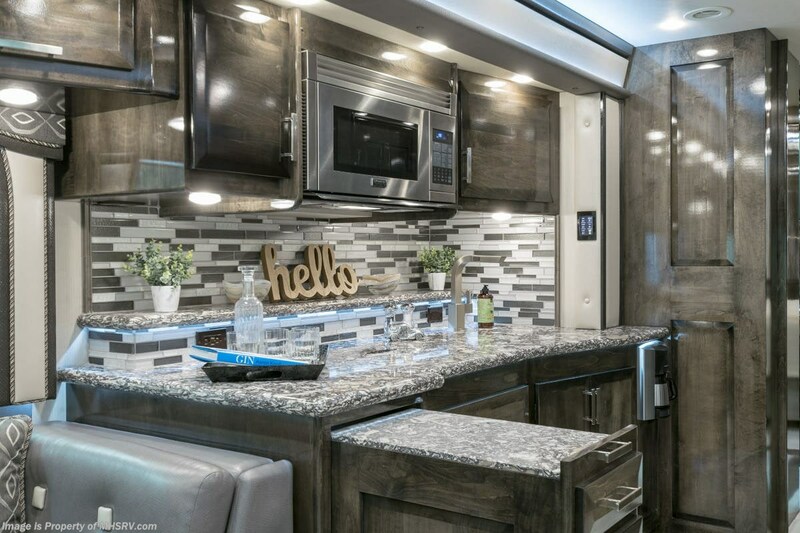 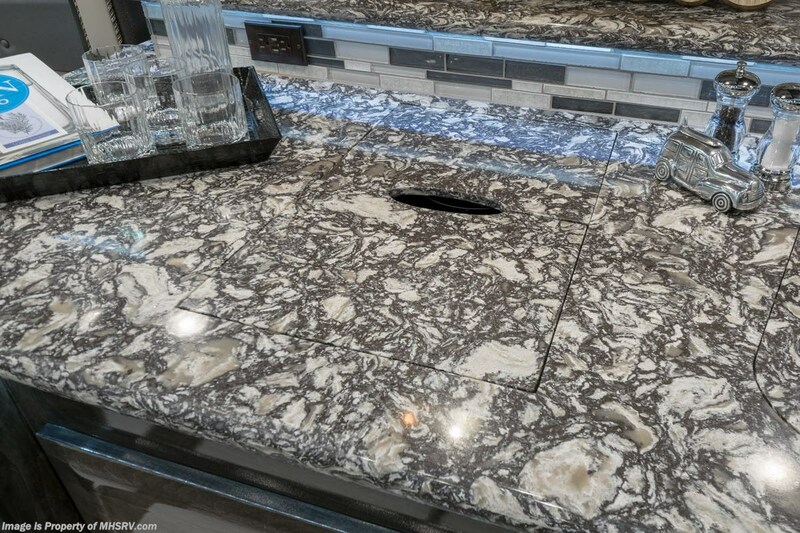 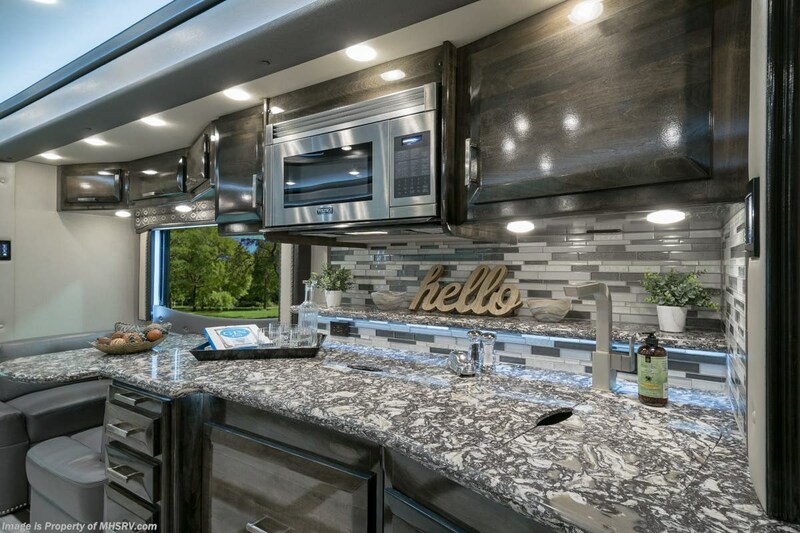 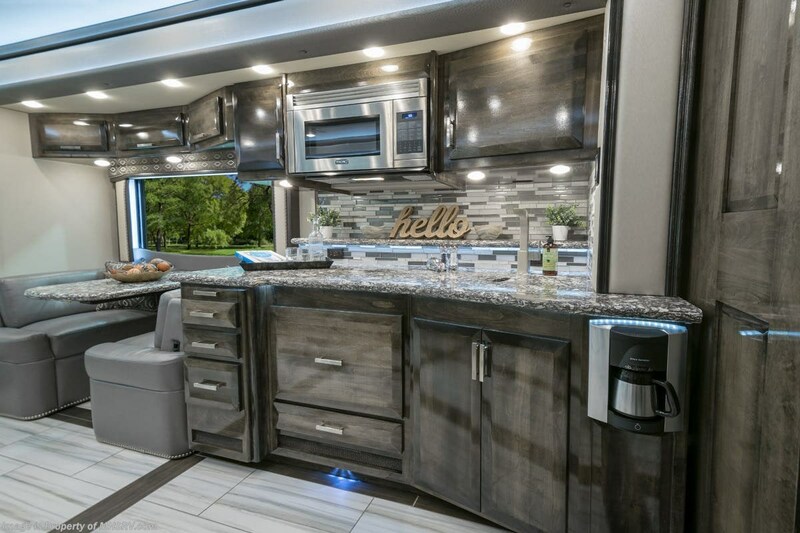 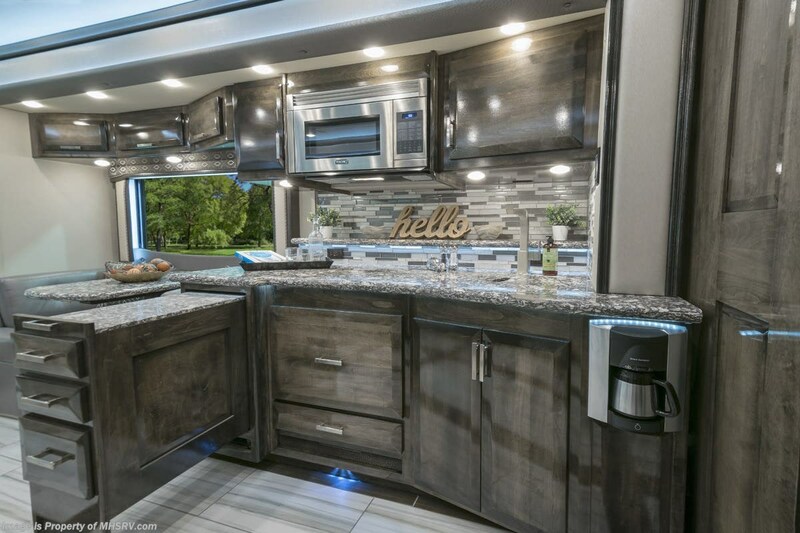 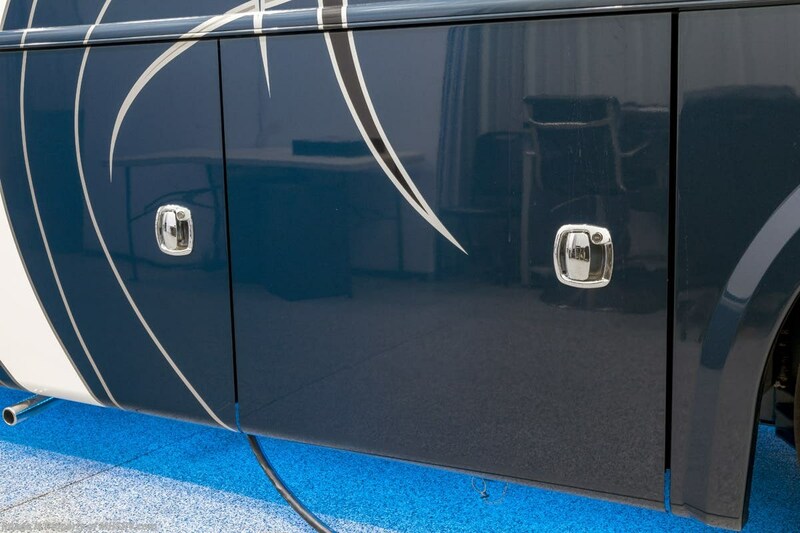 This extraordinary motor coach is the LVSpa (Luxury Villa Spa) floor plan with the all new Polished Stone beveled wood package, Excalibur interior décor and the upgraded Poseidon exterior paint scheme. 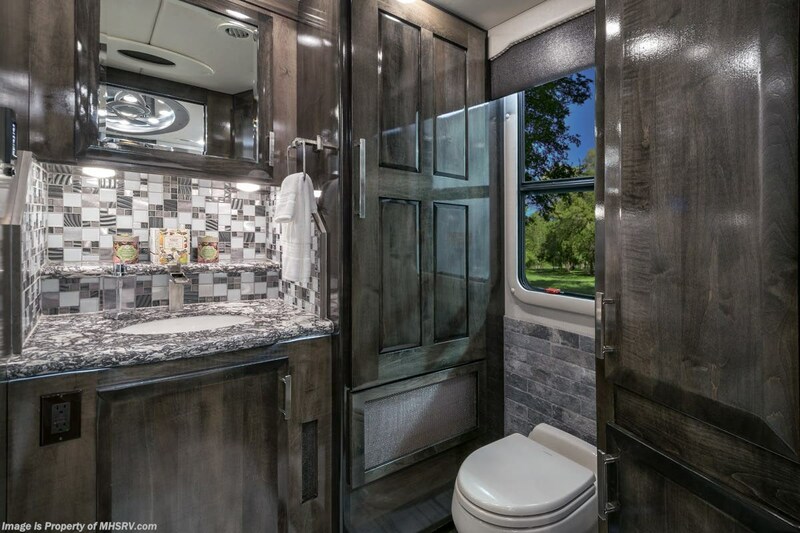 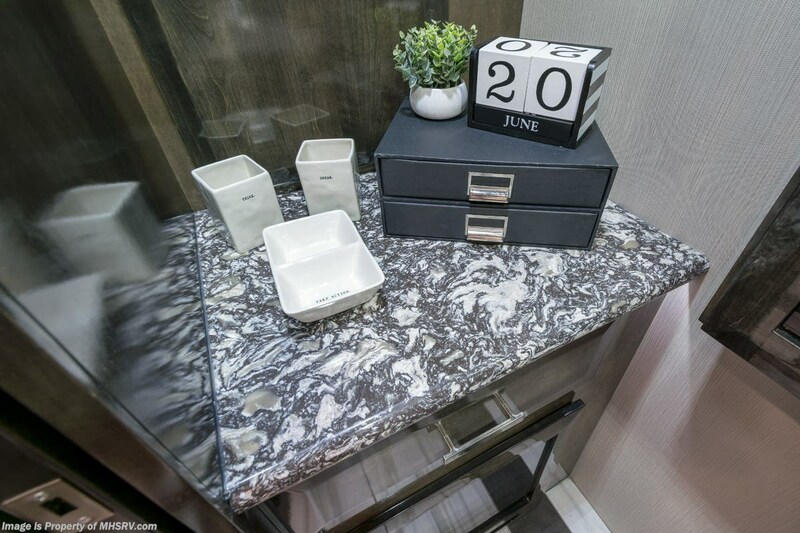 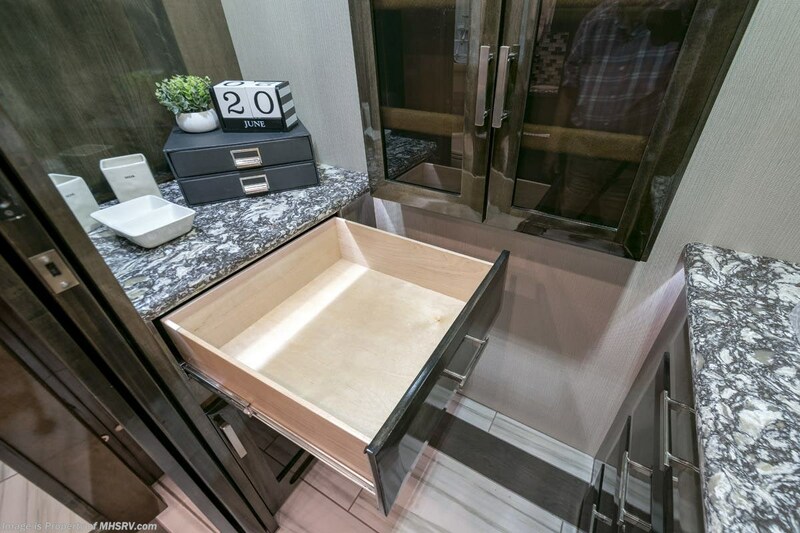 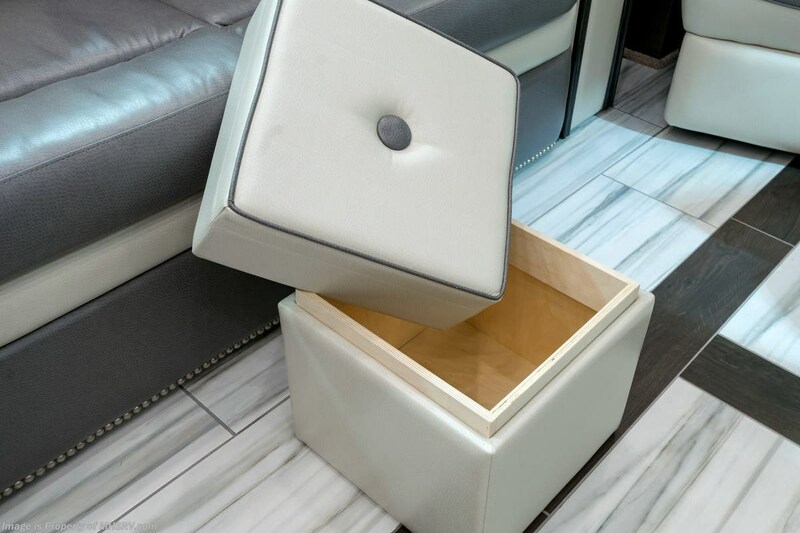 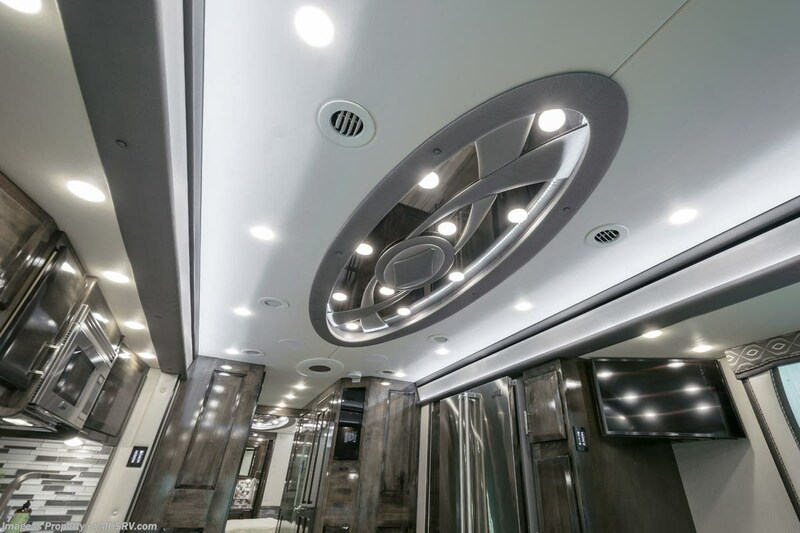 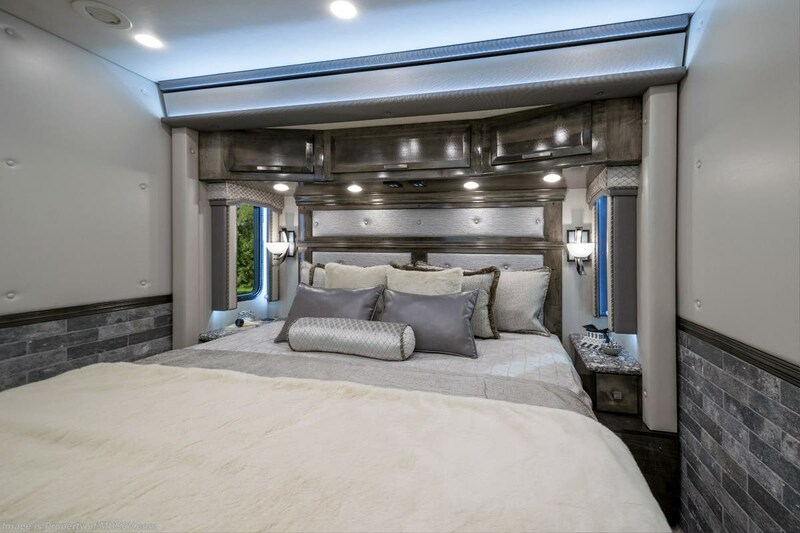 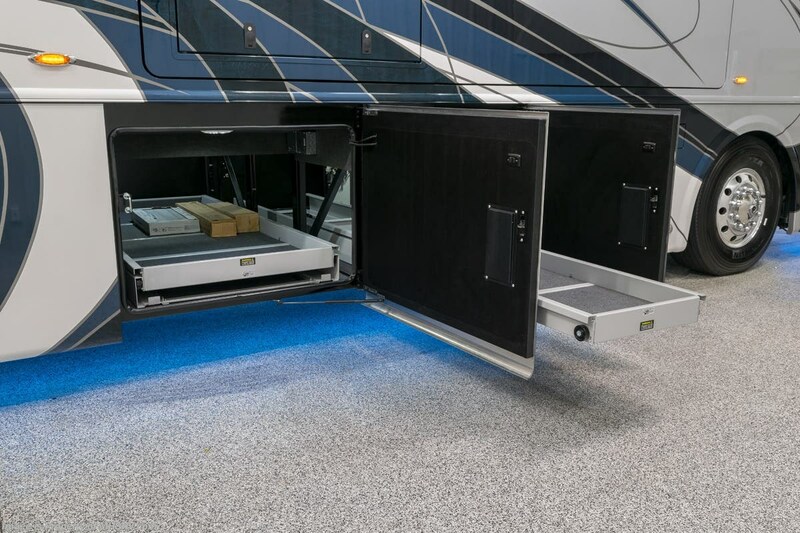 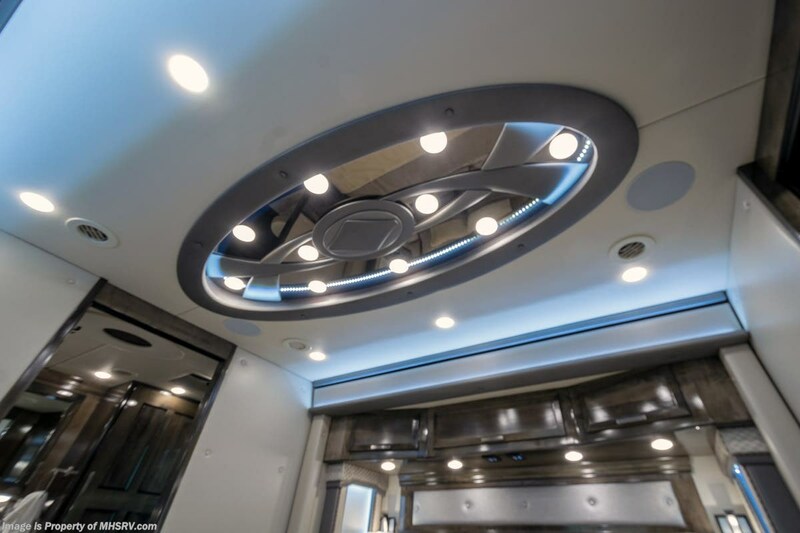 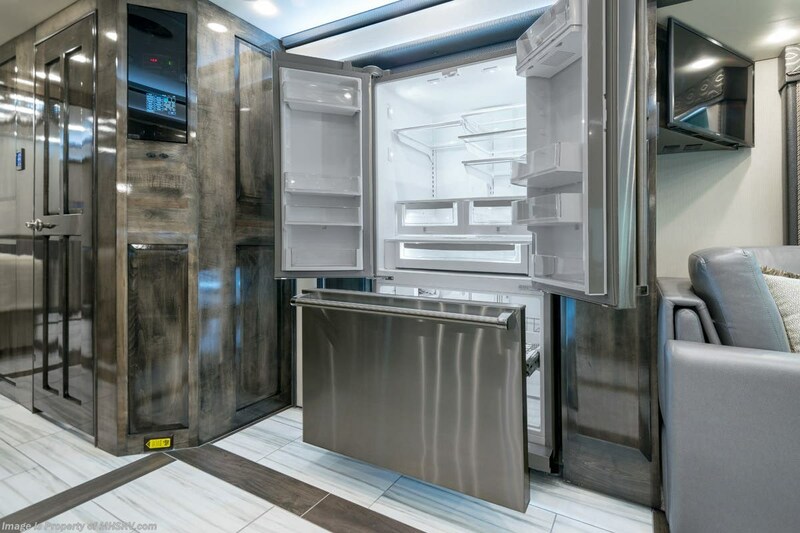 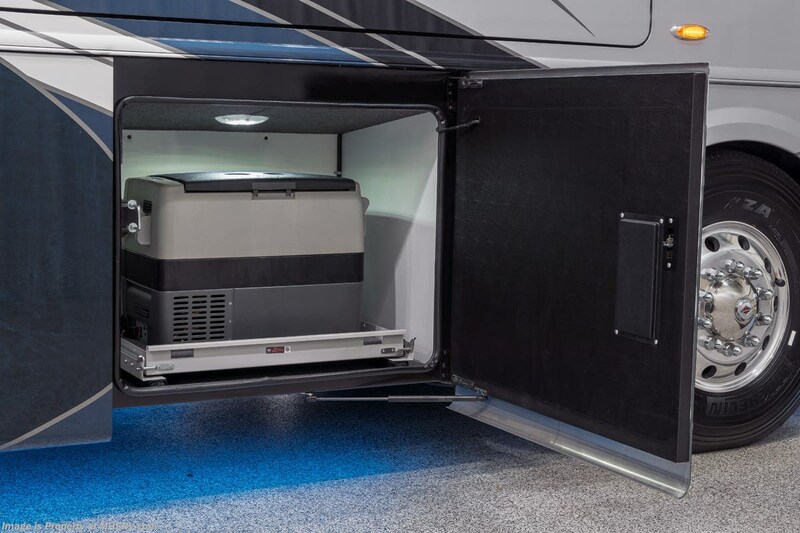 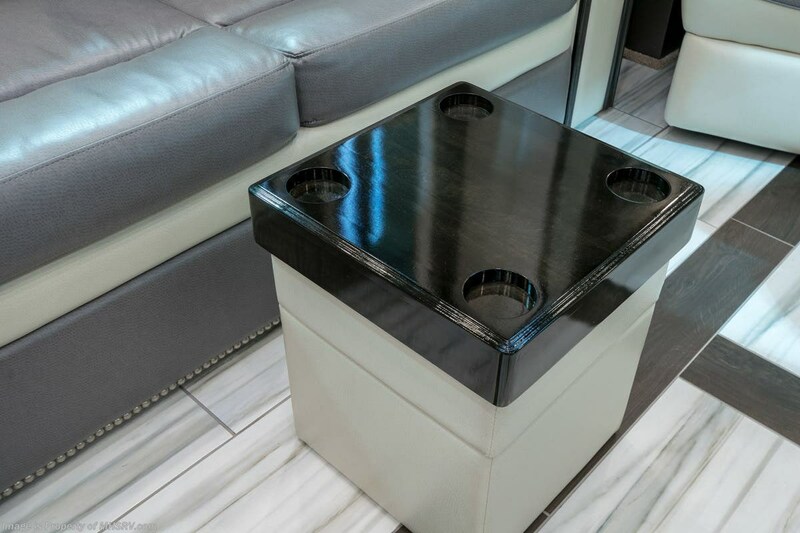 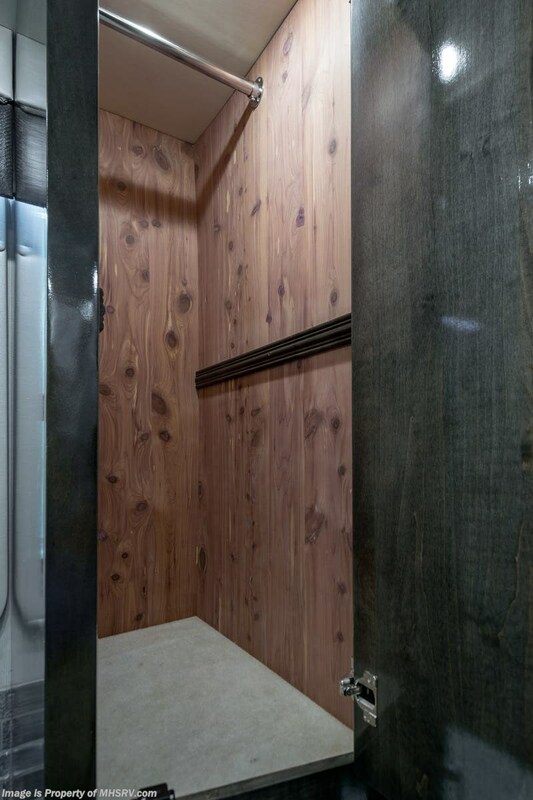 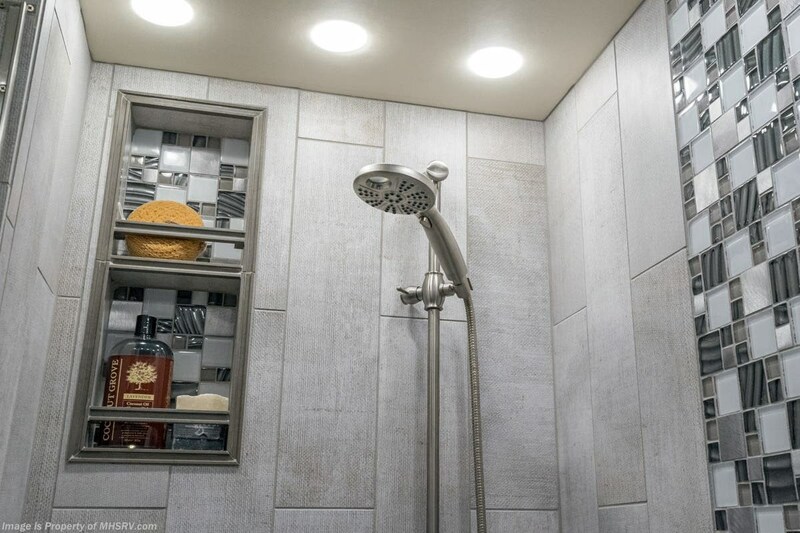 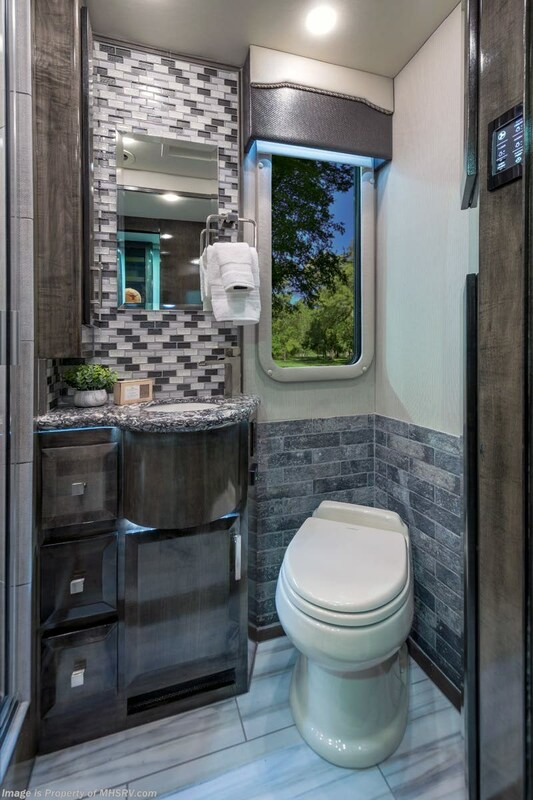 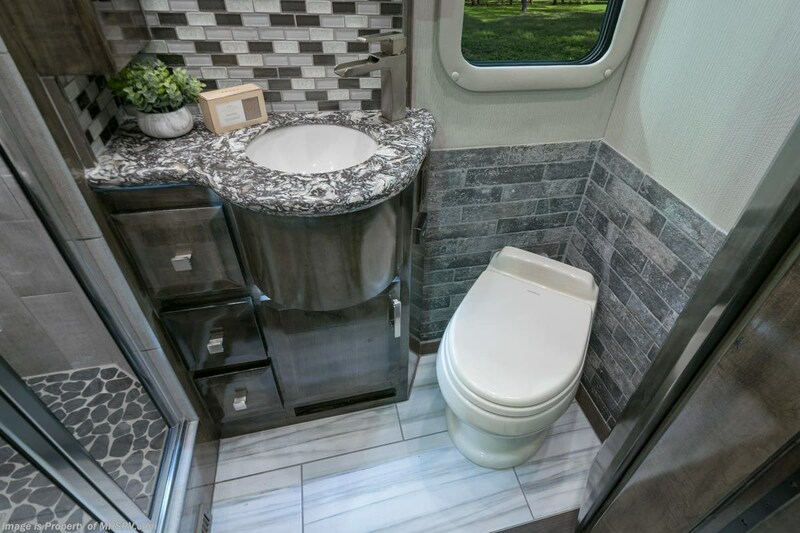 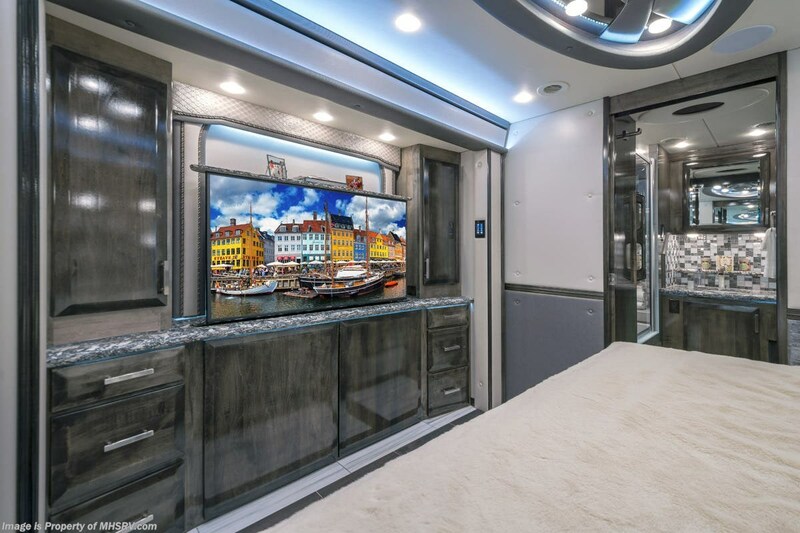 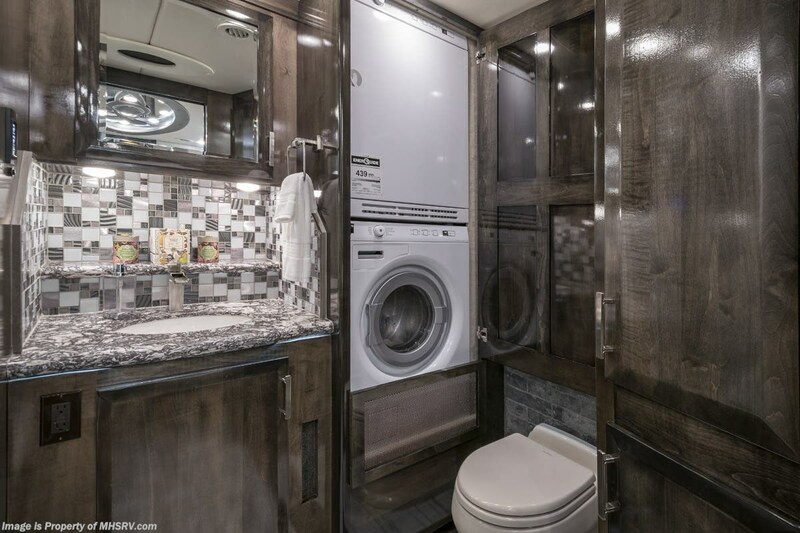 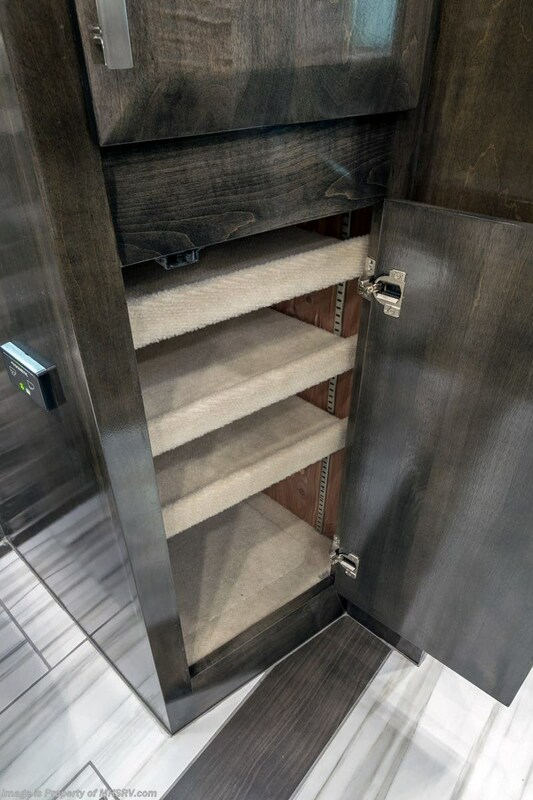 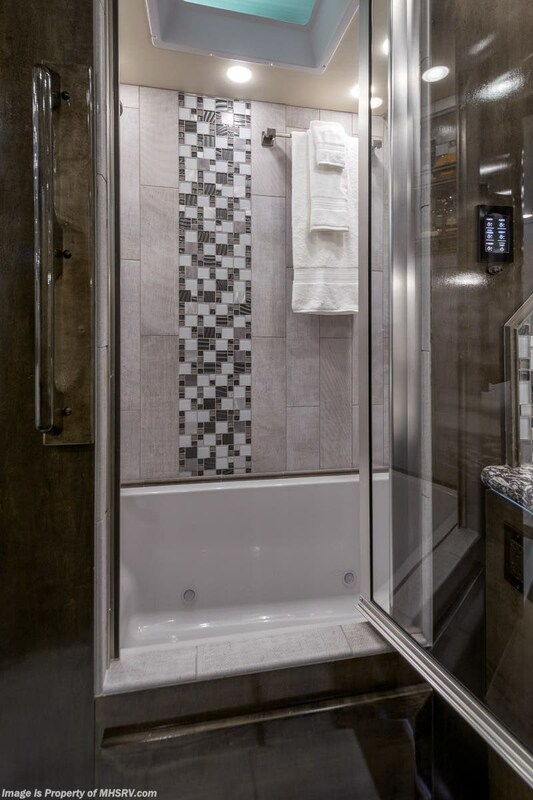 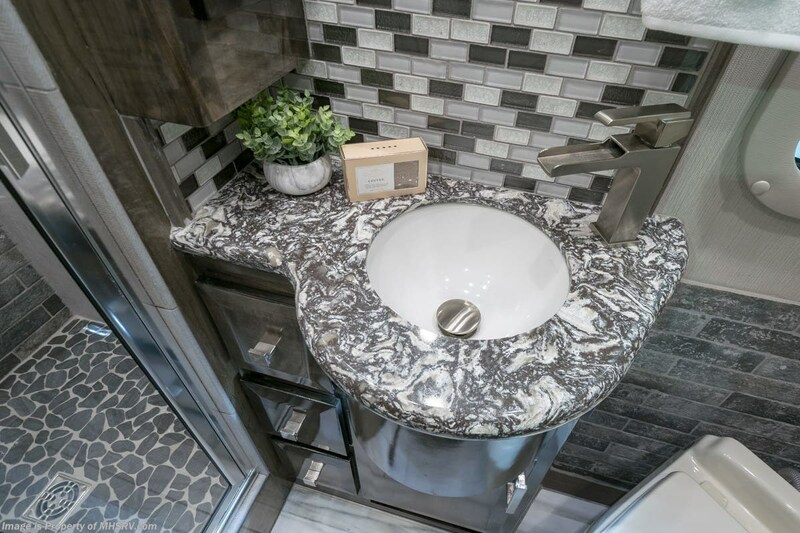 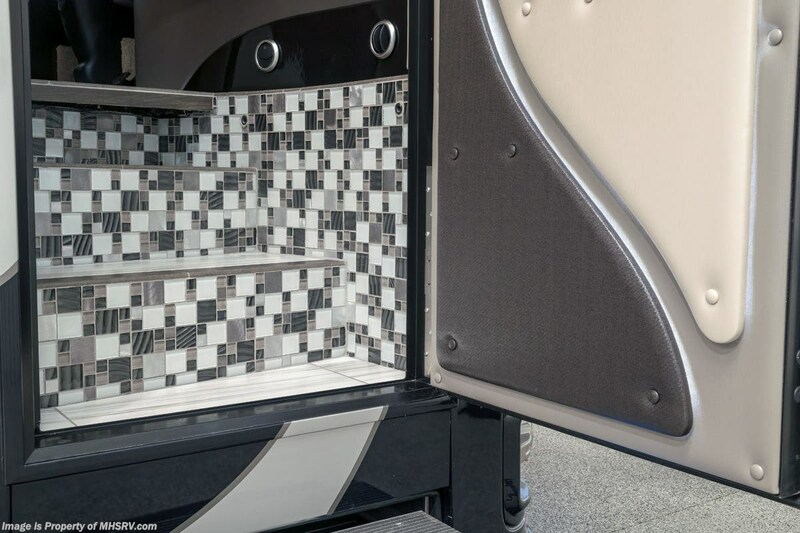 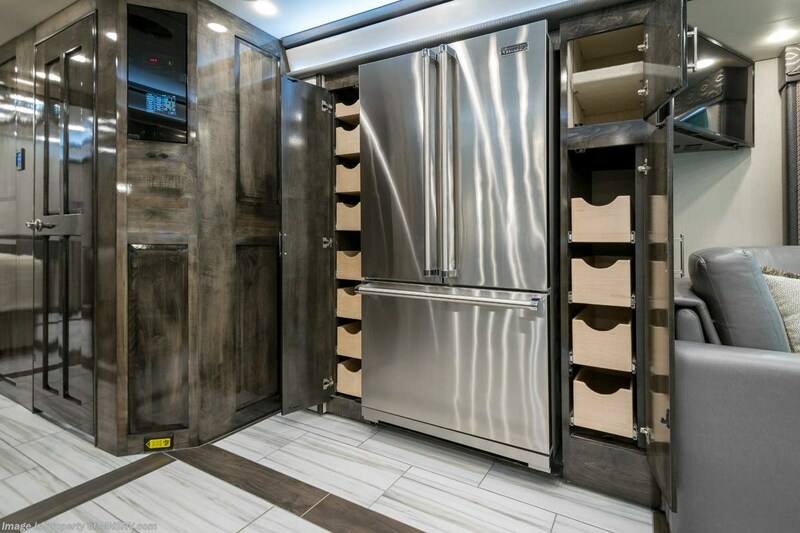 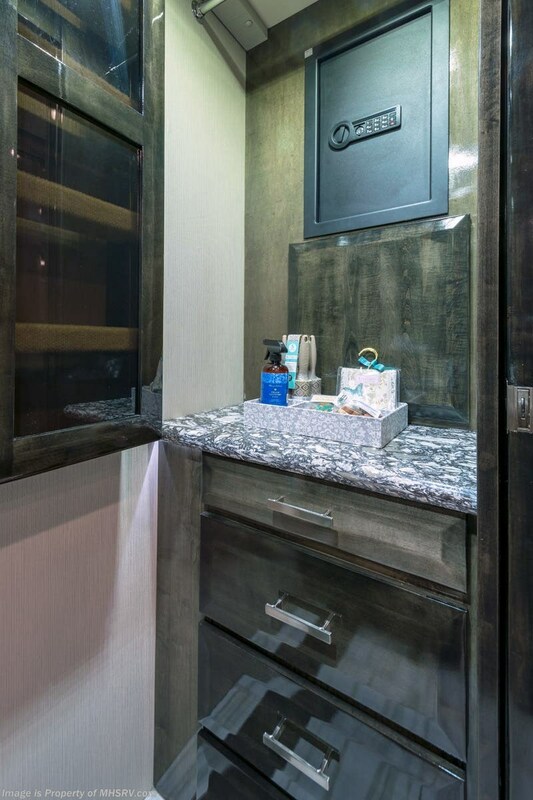 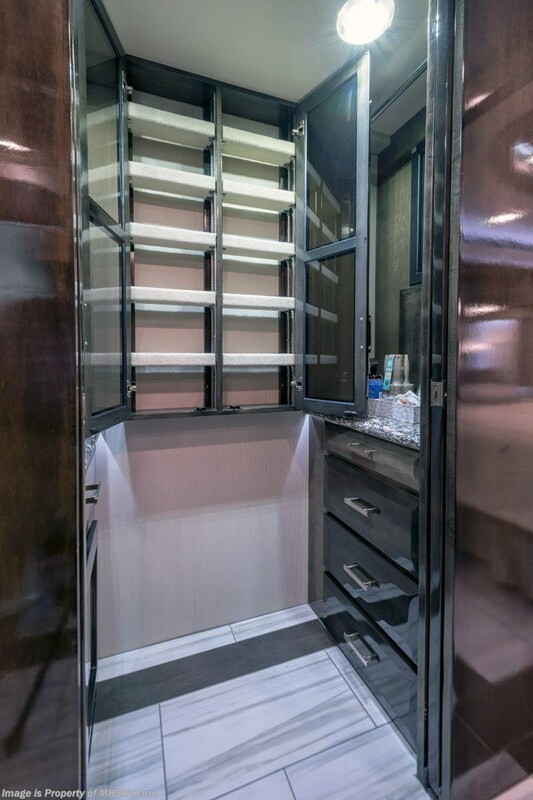 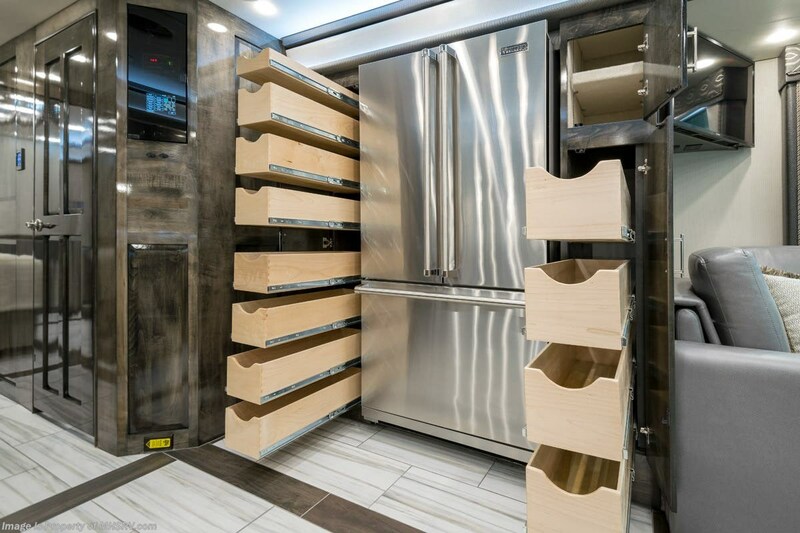 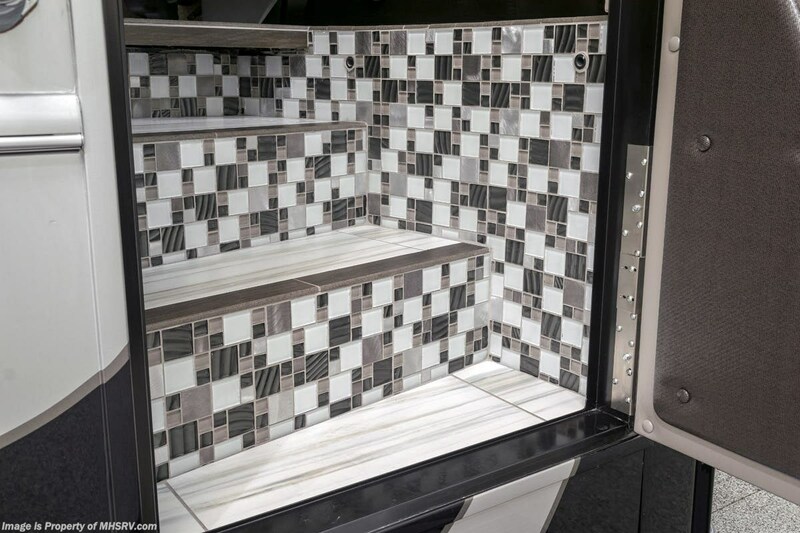 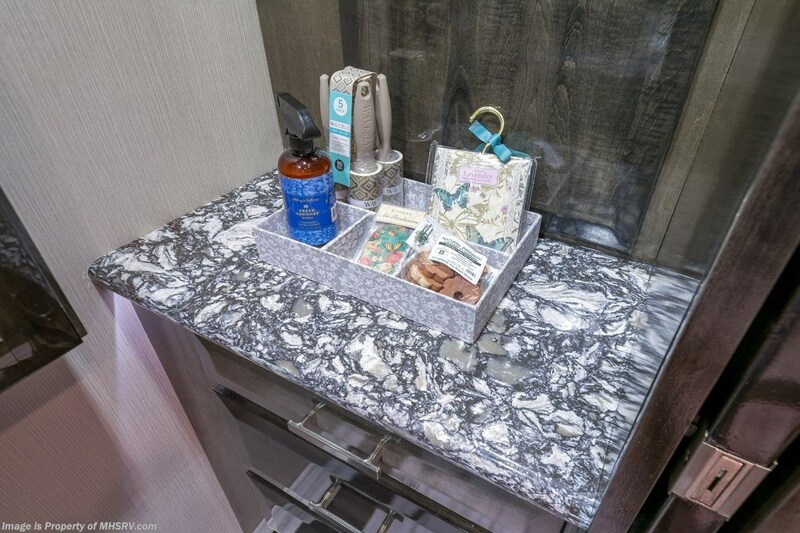 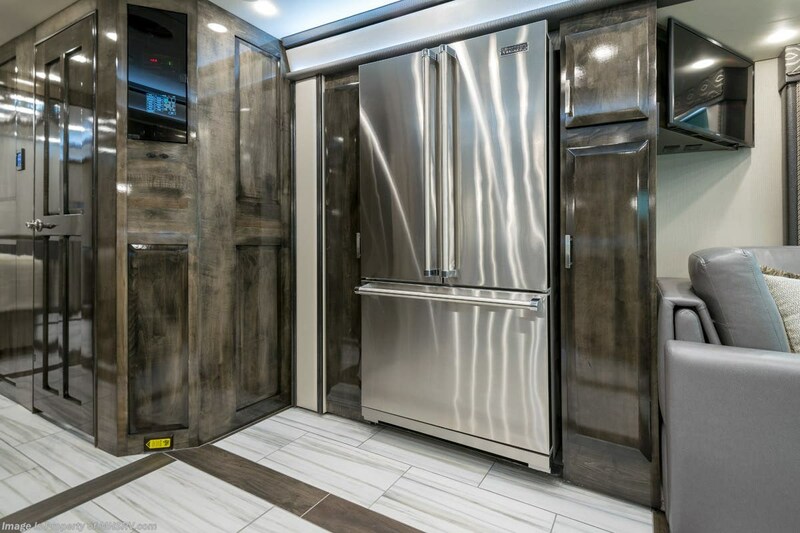 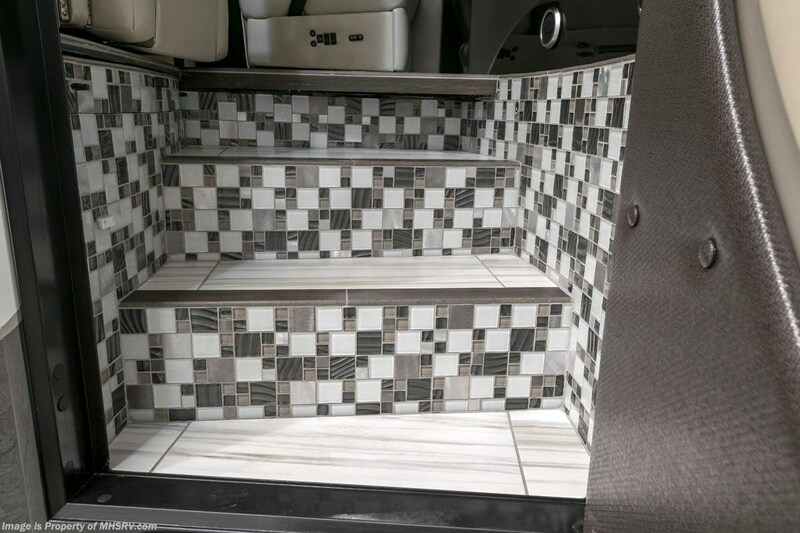 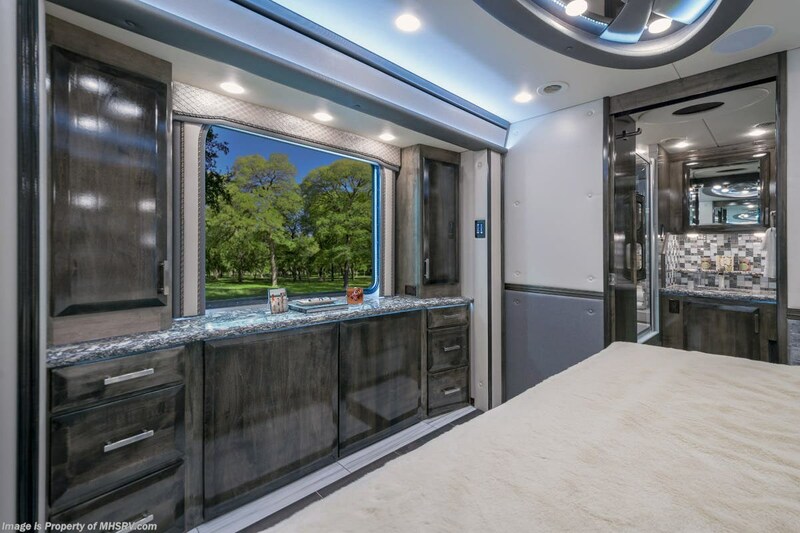 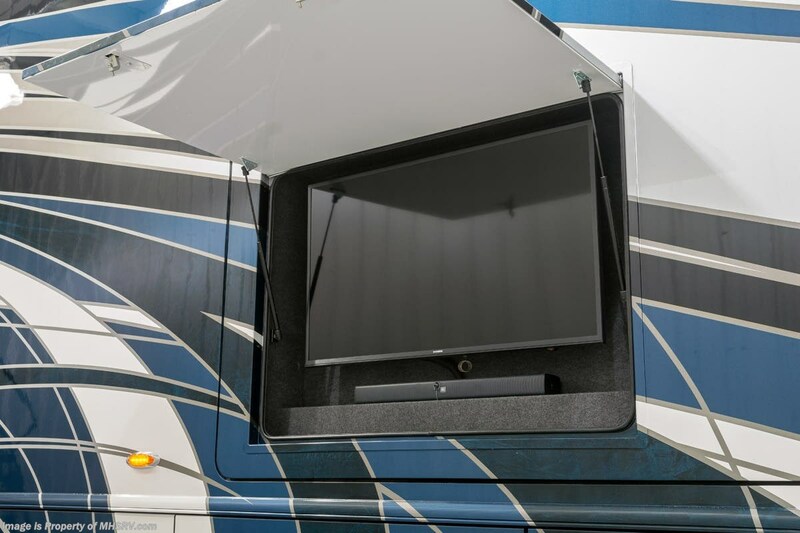 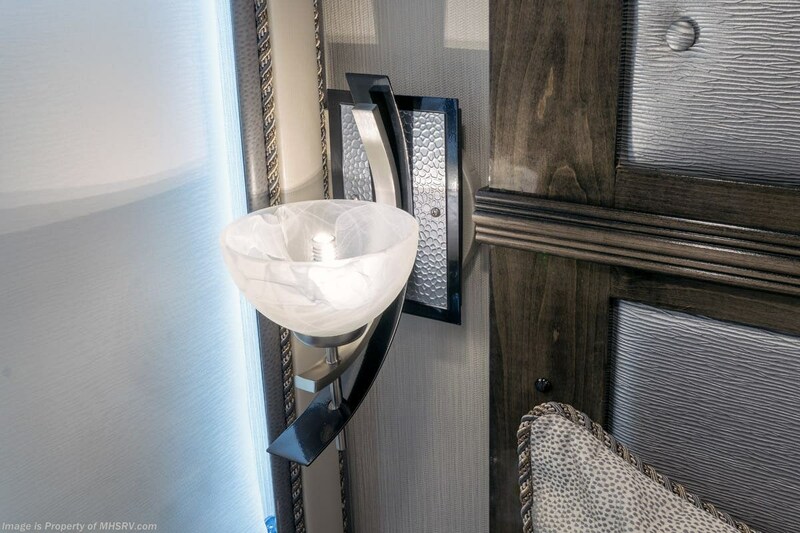 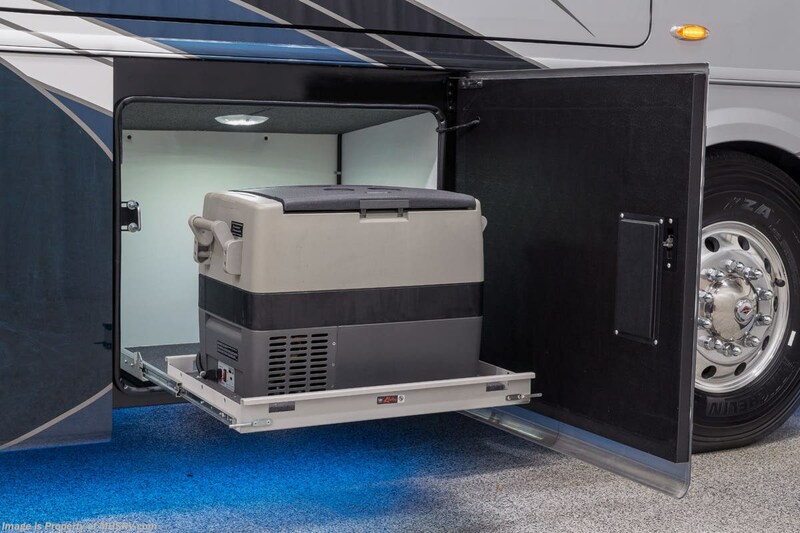 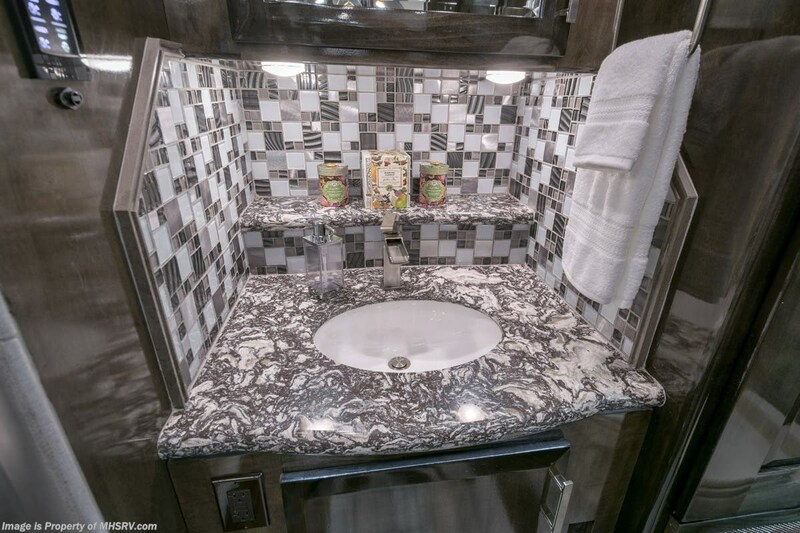 The LVSpa is unlike any luxury motor coach in the world; offering, not only a large walk-in closet with built in shoe rack, but an unheard of 2 full baths! 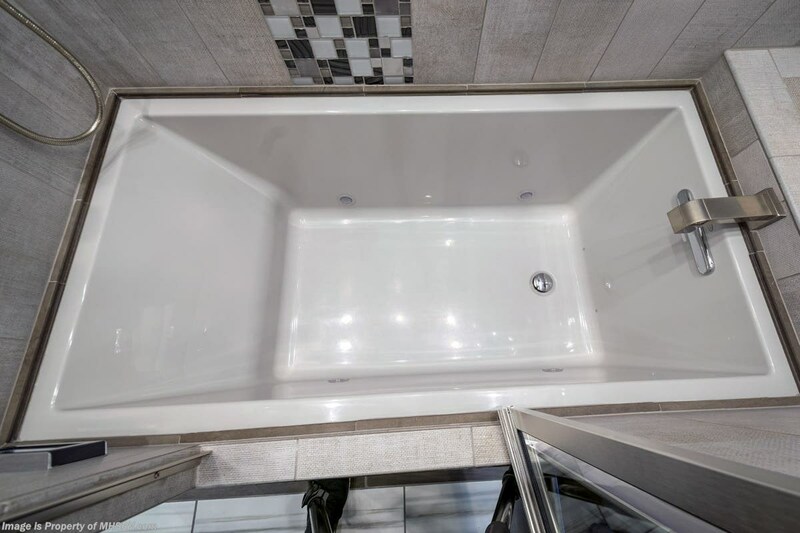 The feature that transforms this floor plan into a Spa like retreat is the ultra-high end massaging tub in the master bath. 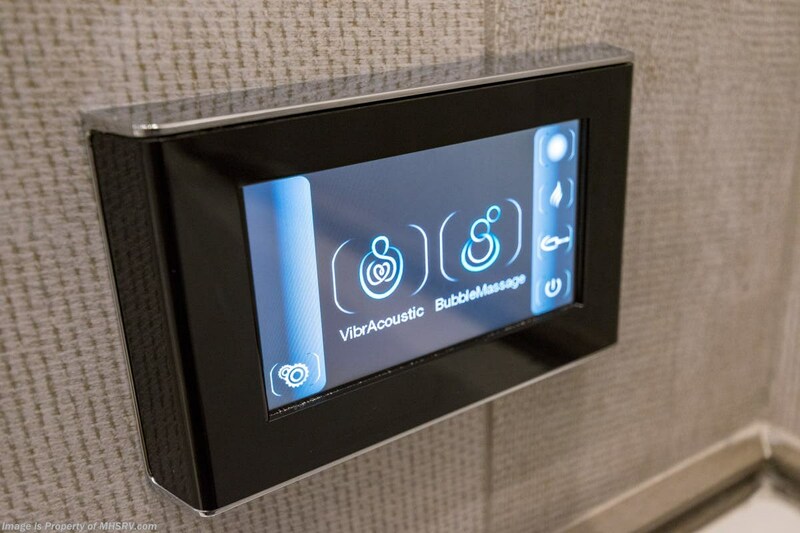 The Kohler Underscore® bath combines BubbleMassage™ hydrotherapy, VibrAcoustic® sound waves, Chromatherapy, and Bask™ heated surface for a complete mind-body sensory experience. 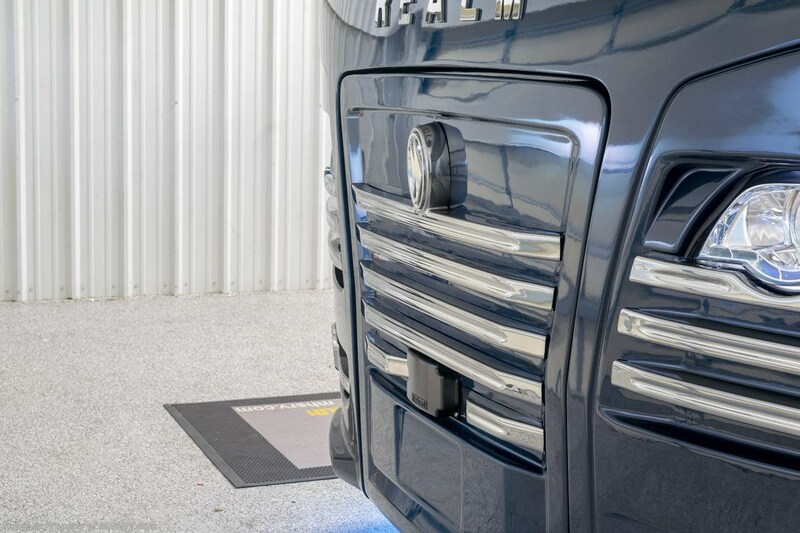 Six hidden speakers emit sound waves that envelop and gently resound within the body. 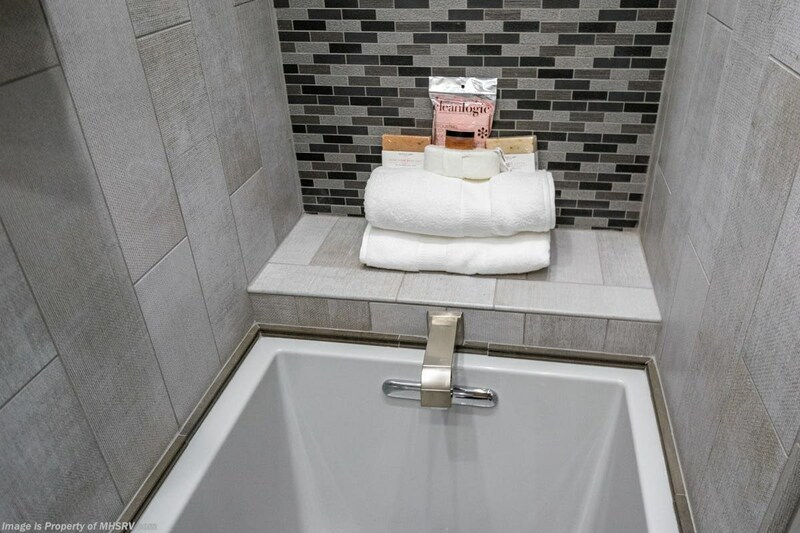 Choose a soothing spa session with built-in compositions, unwind to your own music playlists, or catch up on news and podcasts. 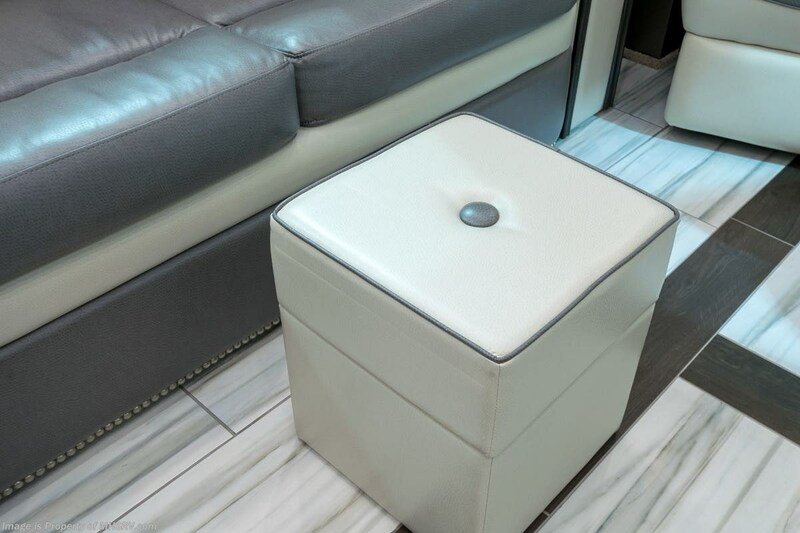 Meanwhile, the 122 air-jets release thousands of air bath bubbles to cushion and massage your body, and Zones of Control™ lets you target the massage to your back, midsection, or feet as well as control the intensity with 18 different levels. 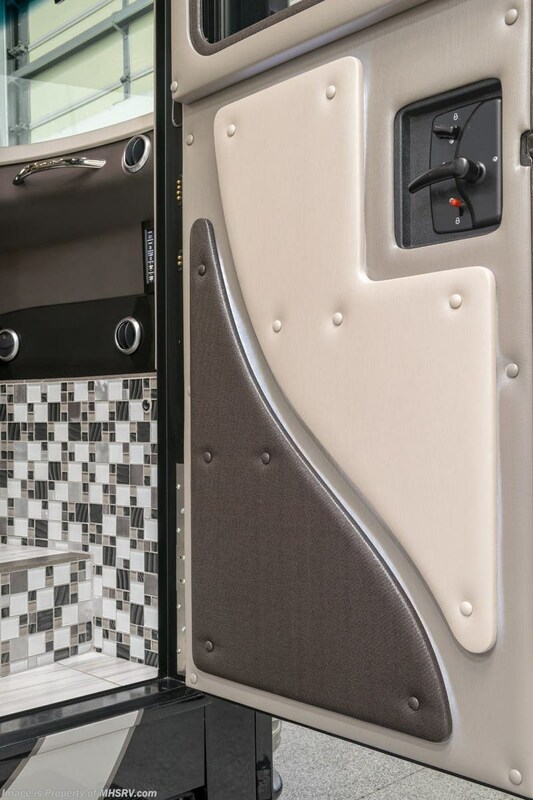 Chromatherapy washes the area in a soothing spectrum of lights, and a heated surface warms your back and neck with adjustable temperature settings. 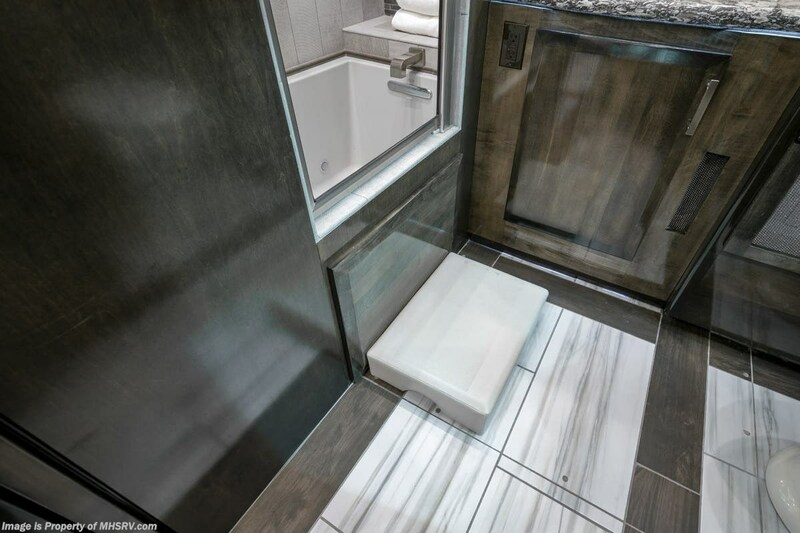 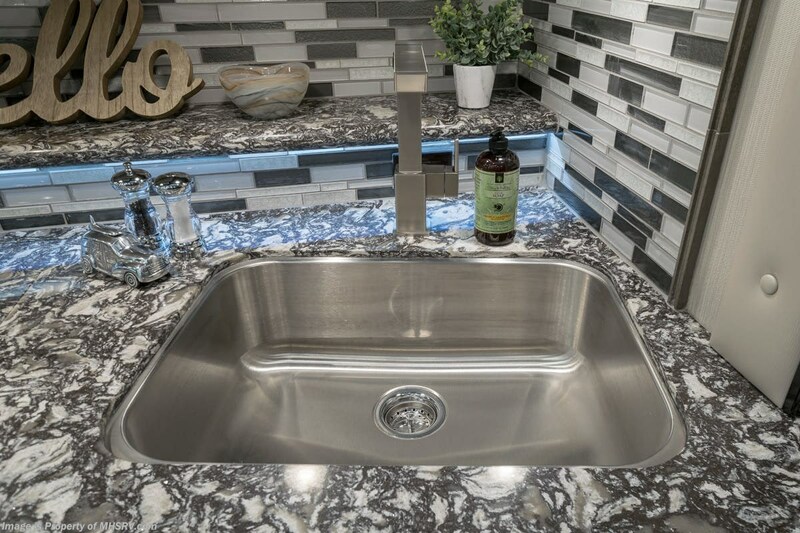 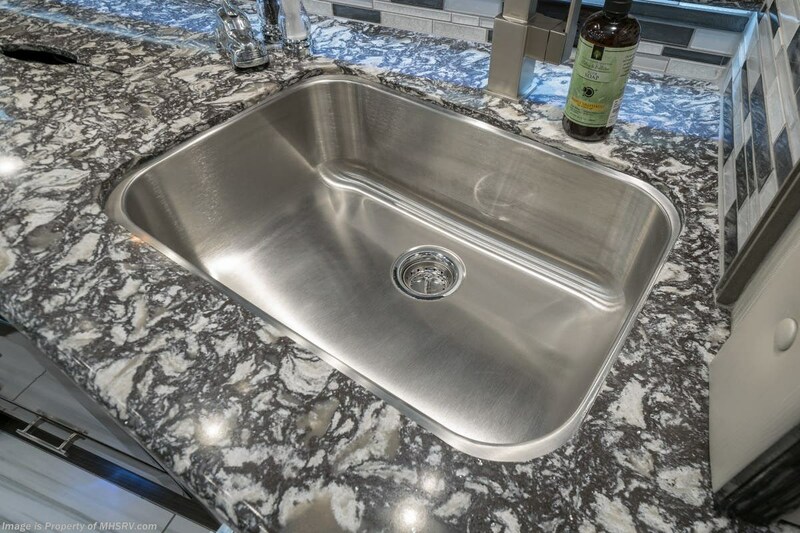 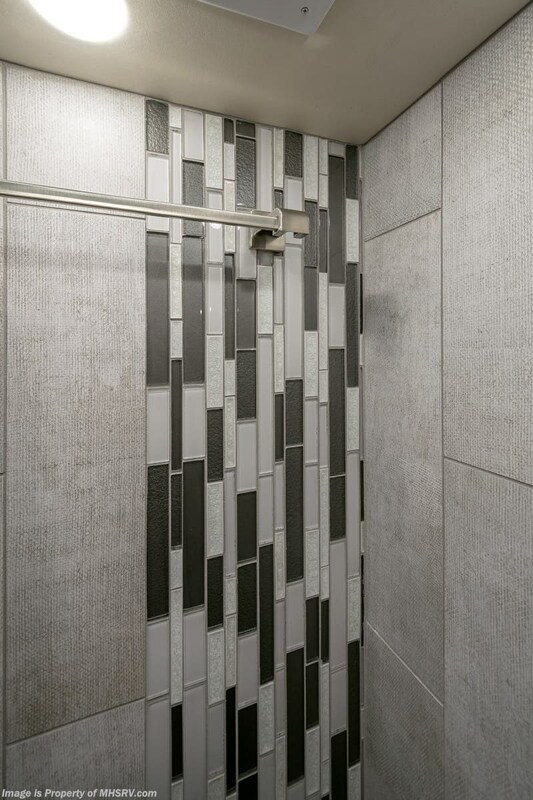 The tub is masterfully tiled and includes a large ledge and a flat panel TV that is beautifully encased and angled downward for great visibility while using the tub or shower. 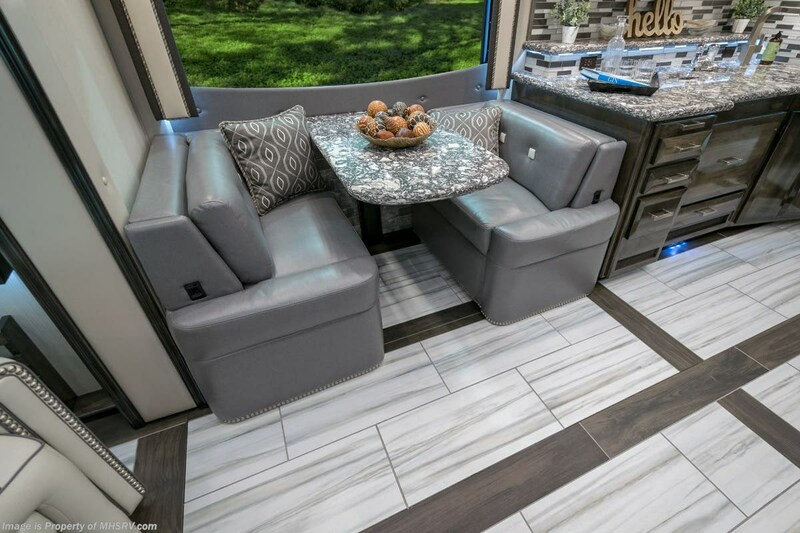 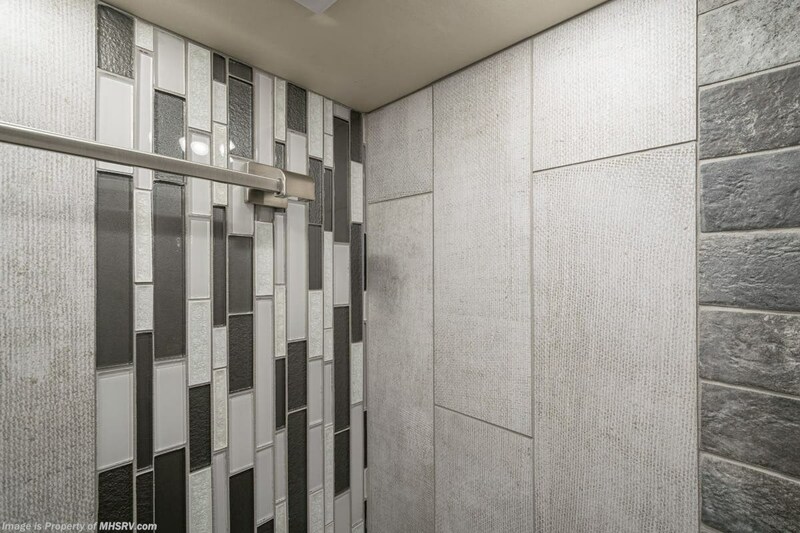 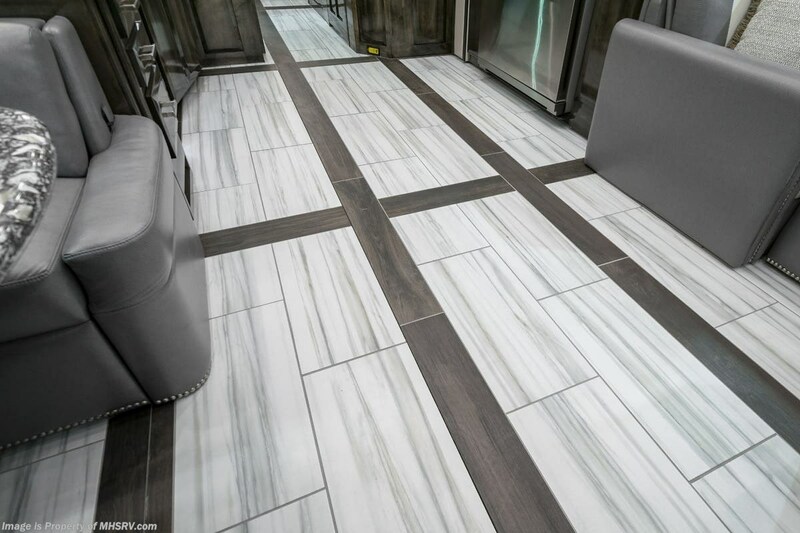 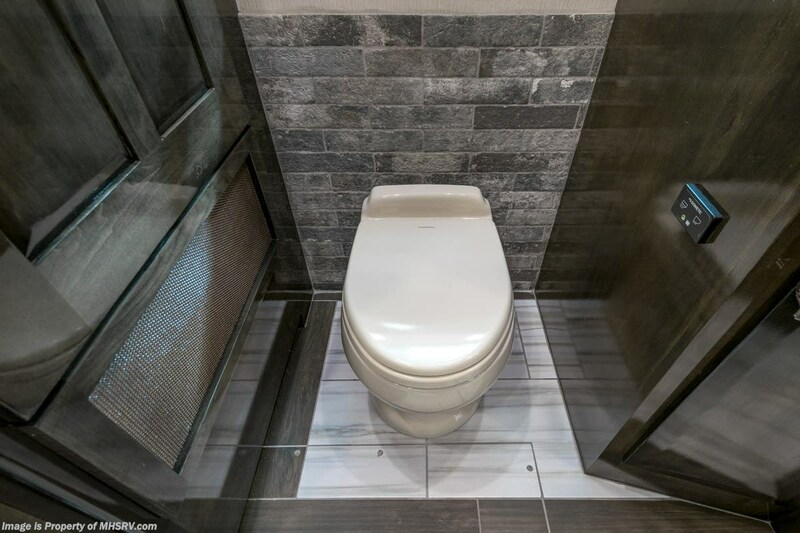 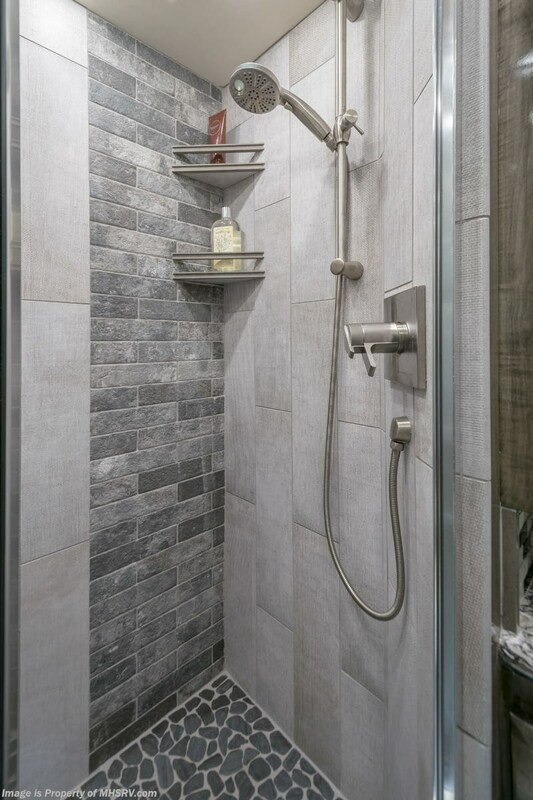 You will also find a true flat floor design throughout the Realm including, not only Foretravel's premium flat floor slide-out rooms, but also the bedroom to master bath transition. 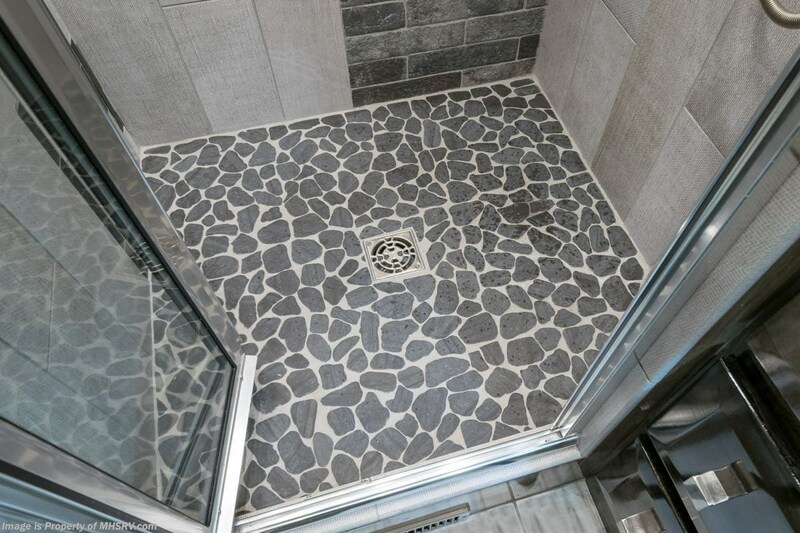 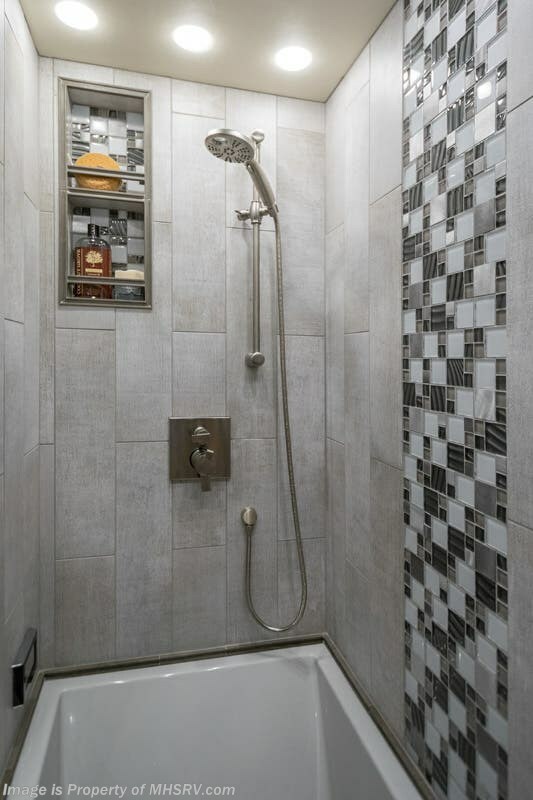 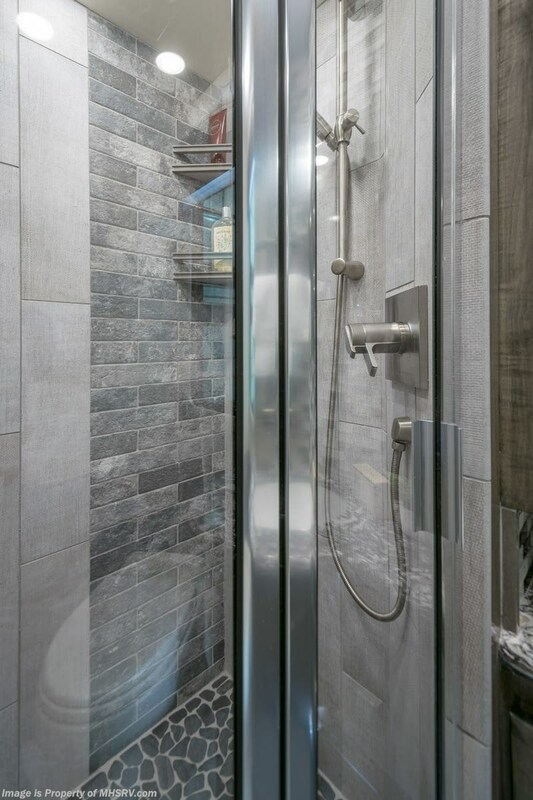 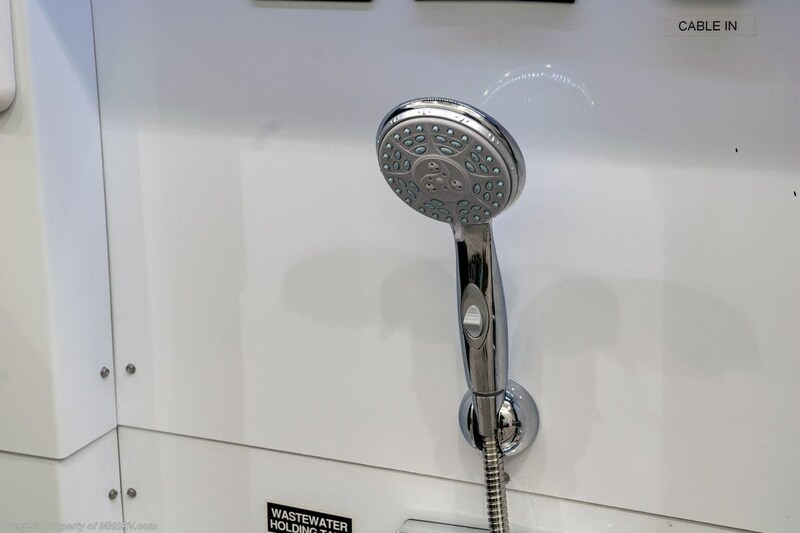 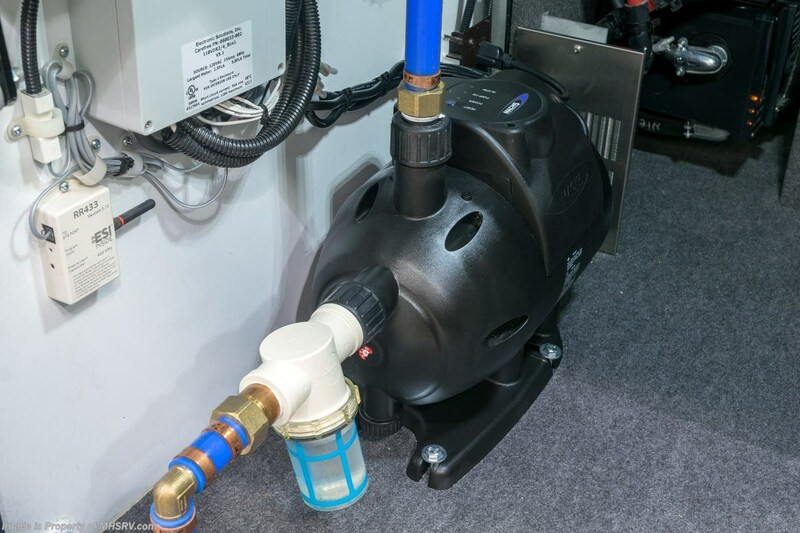 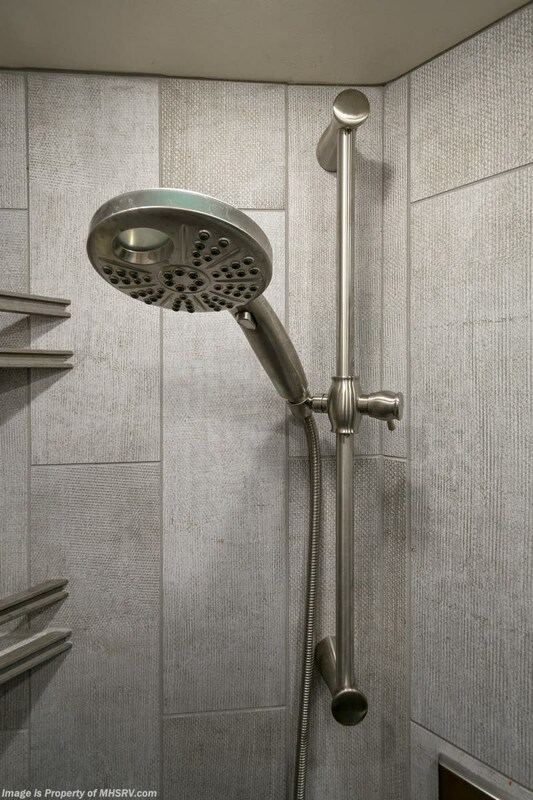 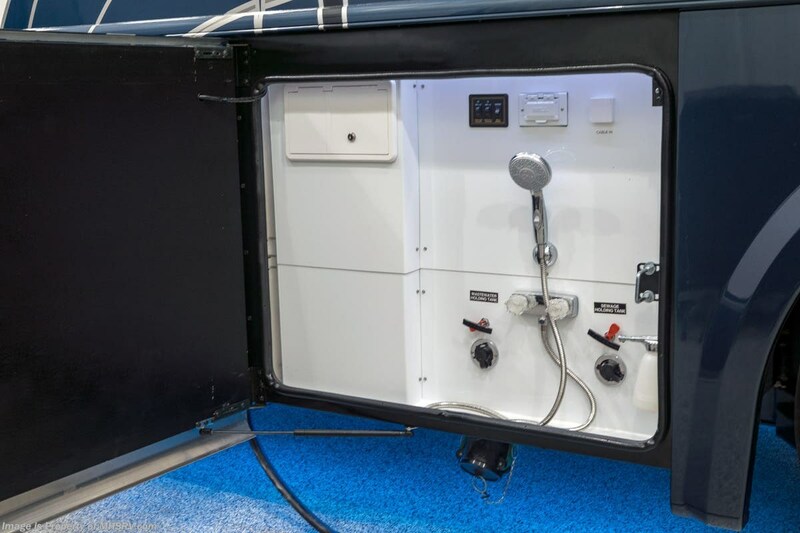 The LVSpa also boast an Upgraded 600D Hydronic Heating system and Head-Hunter water pump for ample hot water supply and water pressure for both the tub/shower and second shower to be used simultaneously. 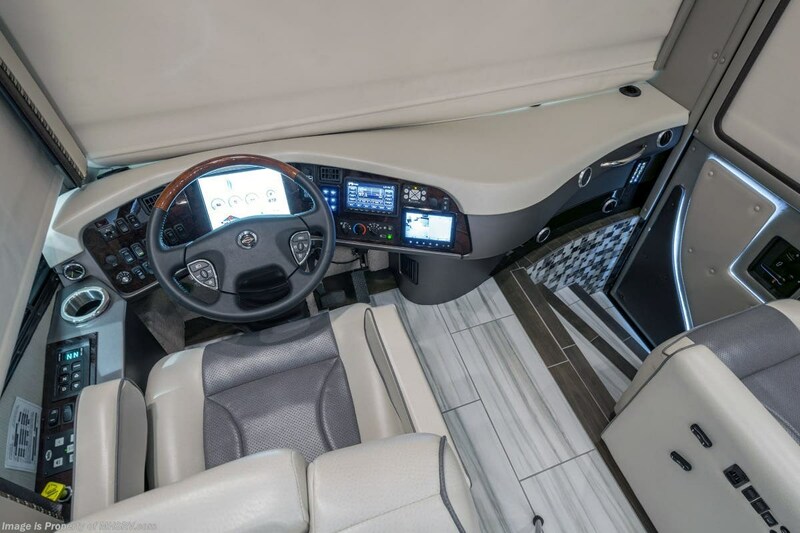 You will also find a multi-function digital dash and instrumentation display system, the Premier Steer adjustable driver's assist system, a Rand McNally Navigation with in-dash and additional passenger side monitors, Silverleaf Total Coach Monitoring System, tire pressure sensors, beautiful tile floors and back-splashes, quartz counter tops throughout, Viking brand refrigerator and convection microwave, LED accent lighting throughout, a beautiful curved step entry way, Braun extra heavy duty power entrance step, a designer entry door with LED accent lighting, iPad launch system, 4K TVs where applicable, upgraded cab stereo and sub woofer, heated and cooled pilot and co-pilot seats, full multi-color LED under coach light kit, recessed and upgraded ceiling features in the galley and bedroom as well as a built in beverage maker, recessed cook top, Mobile Eye Collision Avoidance System, a "Bird's Eye View" camera system for the ultimate in coach visibility along with an additional 3-camera coach monitoring system with power rear camera, dual integrated power awnings, power entry door awning, exterior entertainment center, (2) electric sliding cargo trays, exterior freezer, full coach and multi-color LED ground effect lighting package, unmistakable full body paint exterior with Armor-Coat sprayed protection below windshield, chrome grill and accent package, (2) 2800 watt inverters, electric floor heat, (2) solar panels, air mattress in sofa, dishwasher drawer, HD satellite and WiFi Ranger. 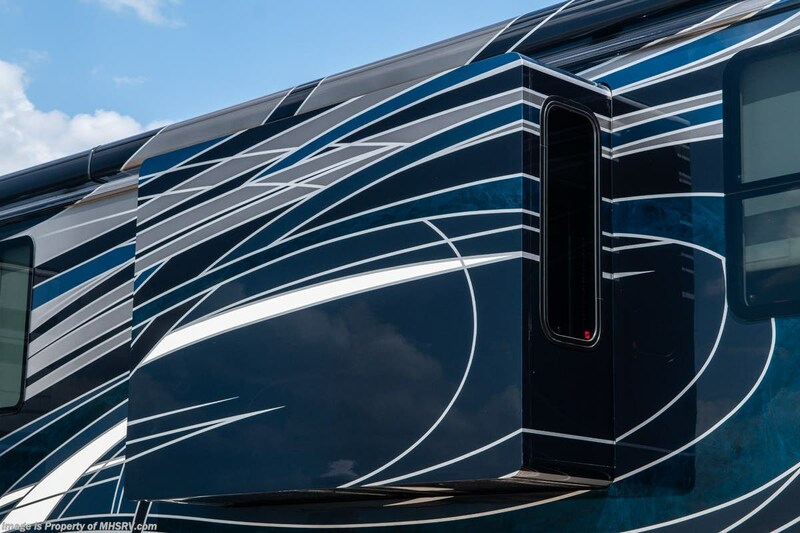 It rides on the all new Spartan K4 chassis. 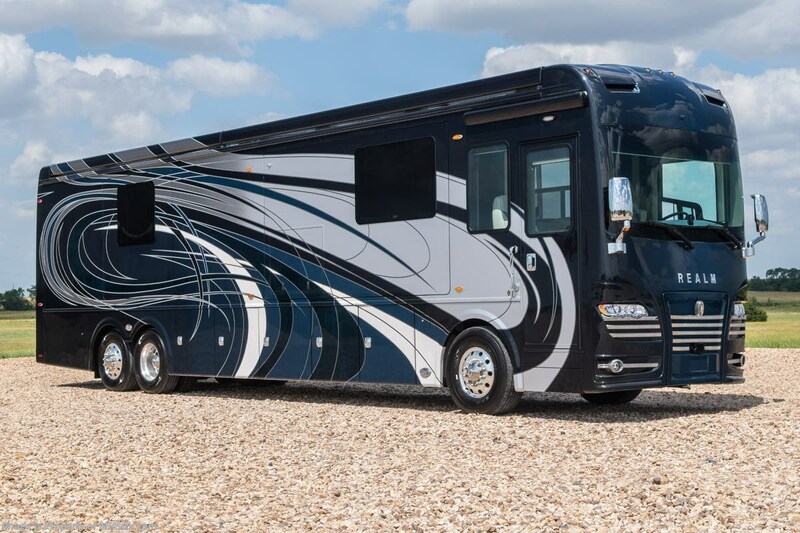 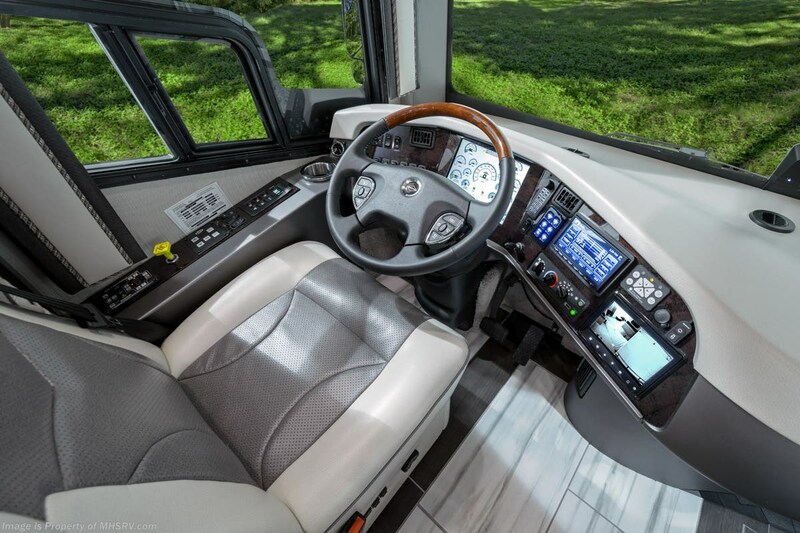 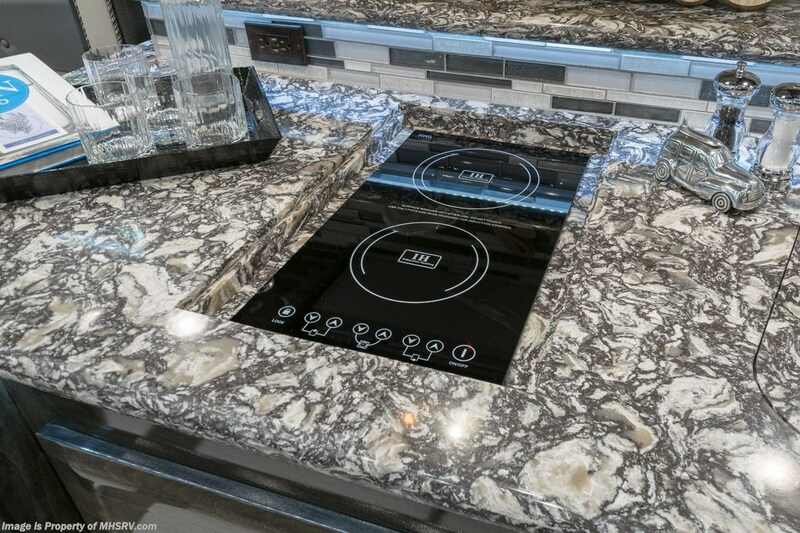 The K4 is not only massive in stature, but boasts a best-in-class 20,000 lb. 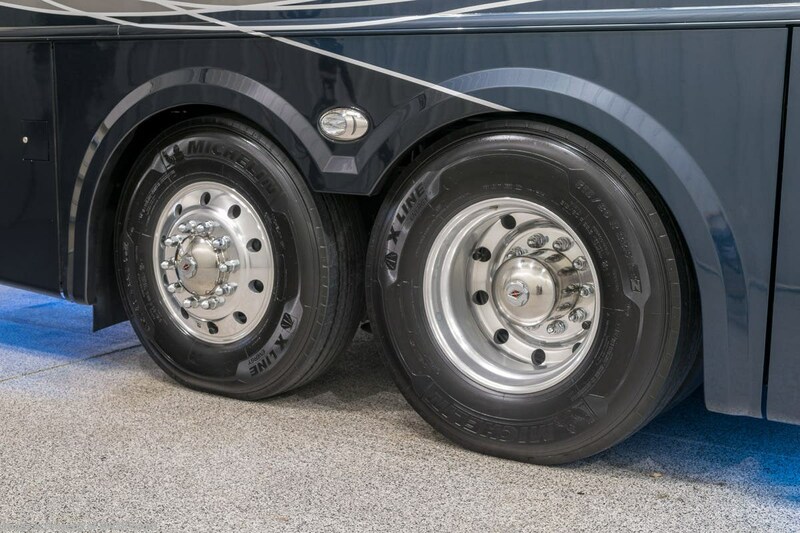 Independent Front Suspension, Premier Steer (adjustable steering control system), Torqued-Box Frame, a passive steering rear tag axle for incomparable handling and maneuverability as well as the Spartan Advanced Protection System which includes OnGuard™ Active a collision mitigation system with adaptive cruise control, electronic stability control and automatic traction control. 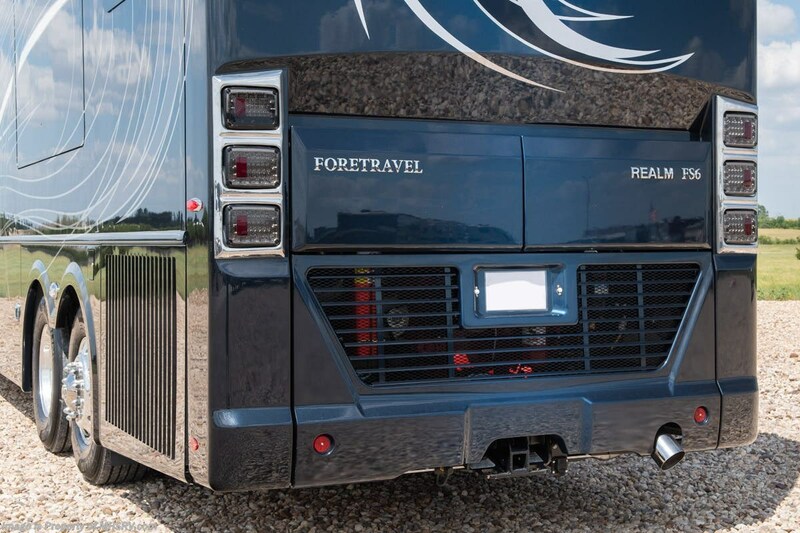 You will know instantly, once behind the wheel of a Realm FS6, that this chassis is truly a cut above all other luxury motor coach chassis. 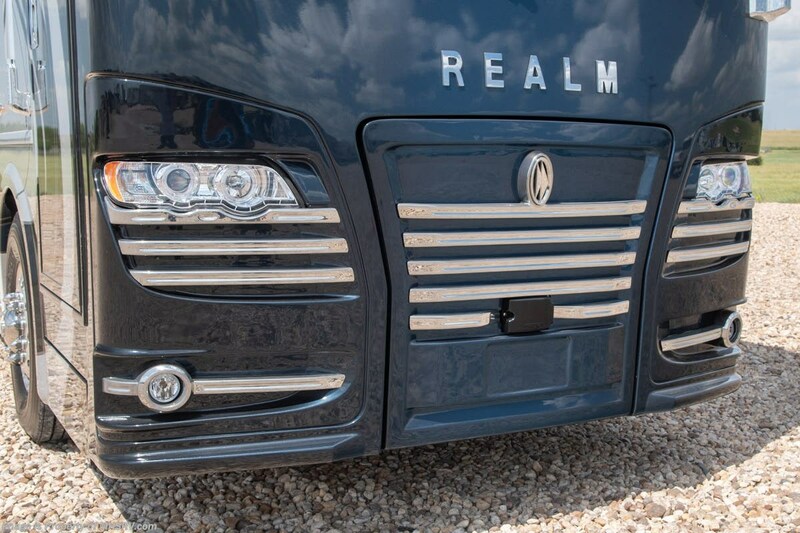 It is powered by a Cummins 605HP diesel. 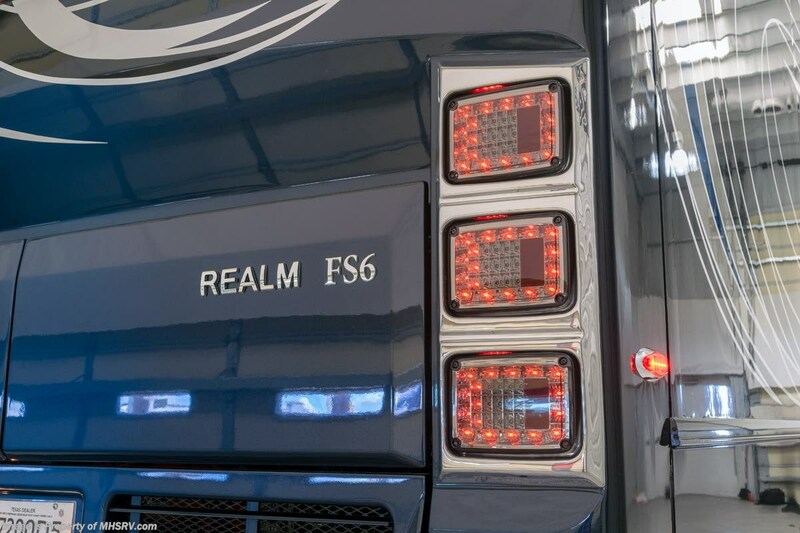 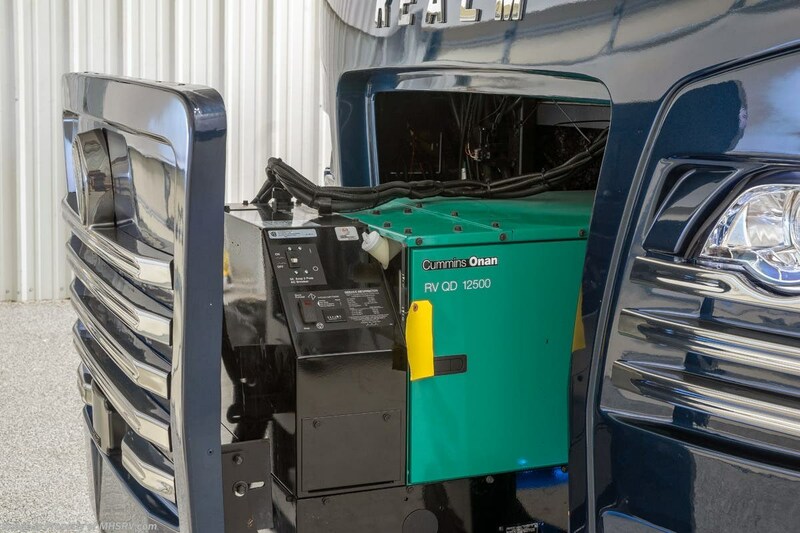 You will also find additional advanced safety features on a Realm FS6 like a fire suppression system for the engine, Tyron Bead-Lock wheel safety bands and steel construction rather than aluminum found in the competition. 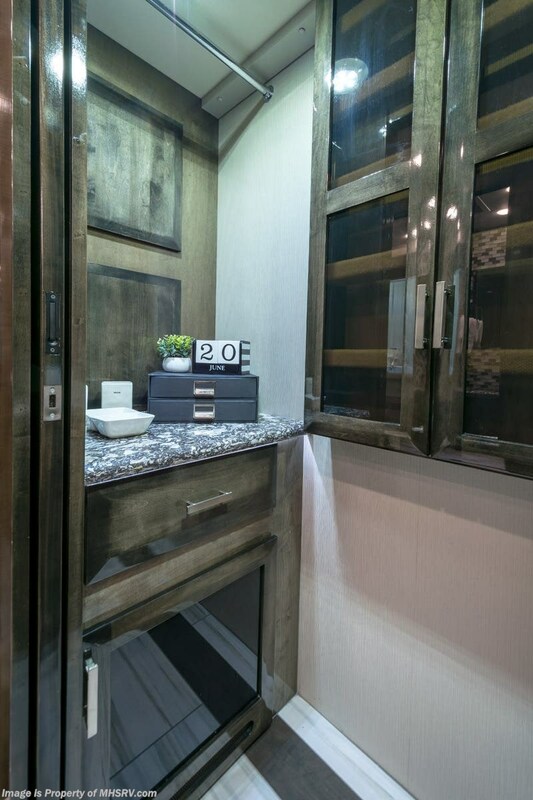 You will also enjoy the ultimate in slide-out room fit and finish. 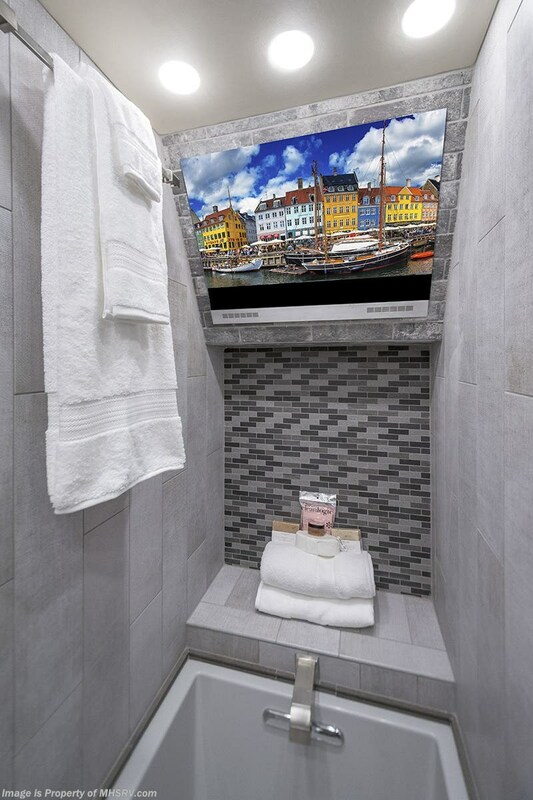 These slides are undoubtedly head and shoulders above the competition. 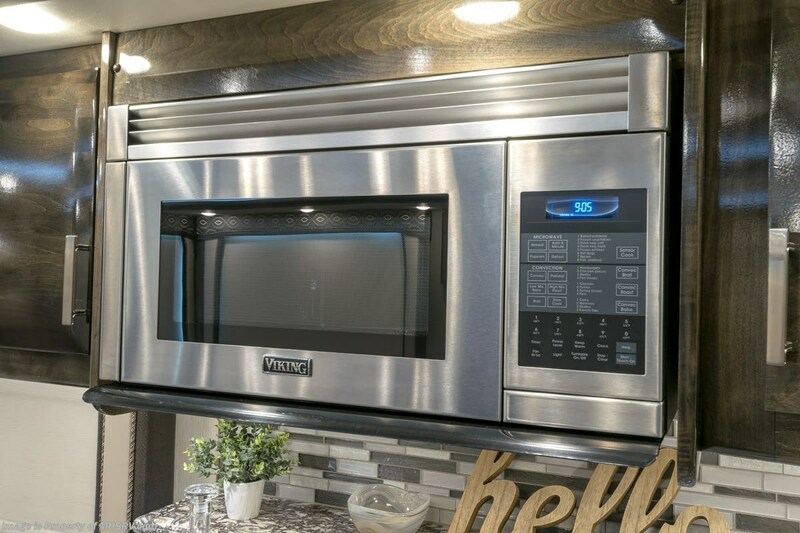 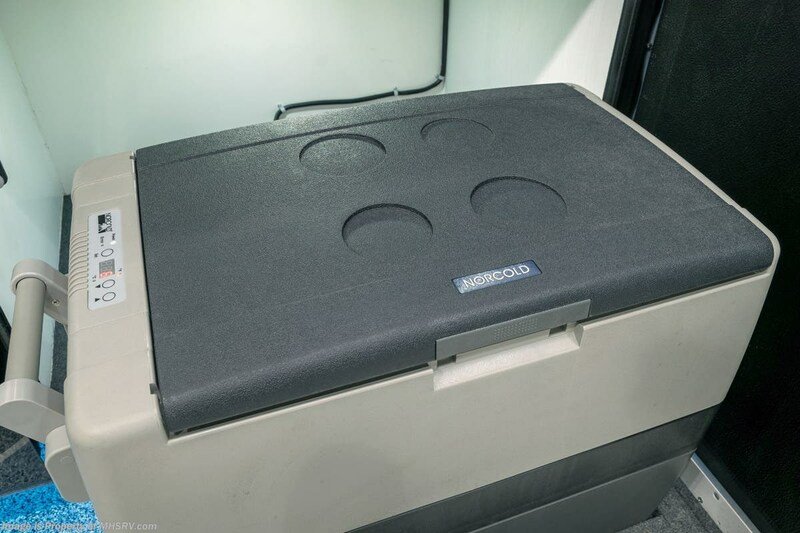 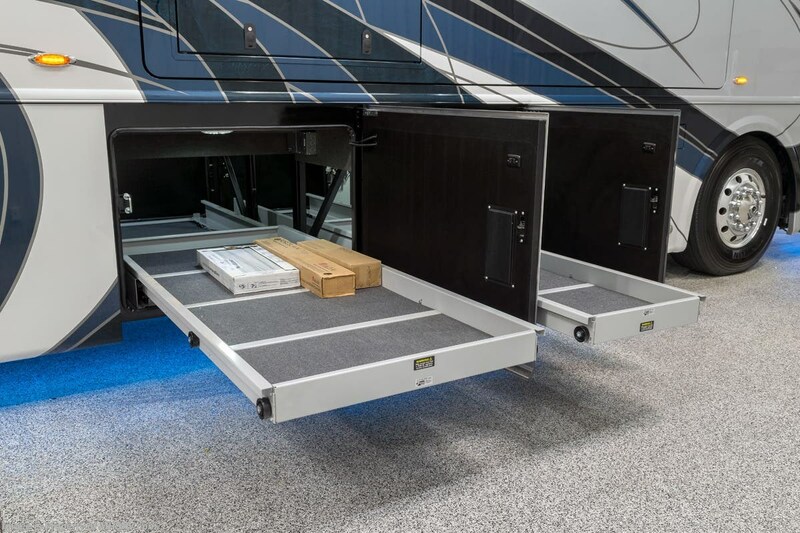 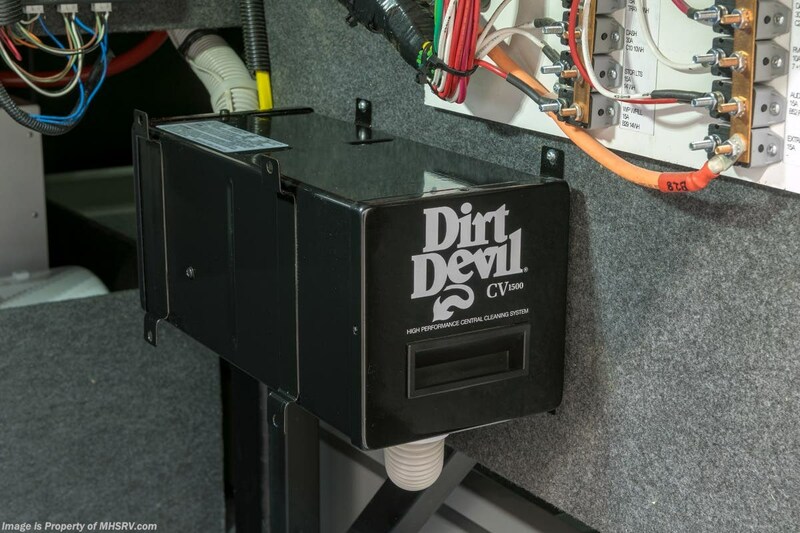 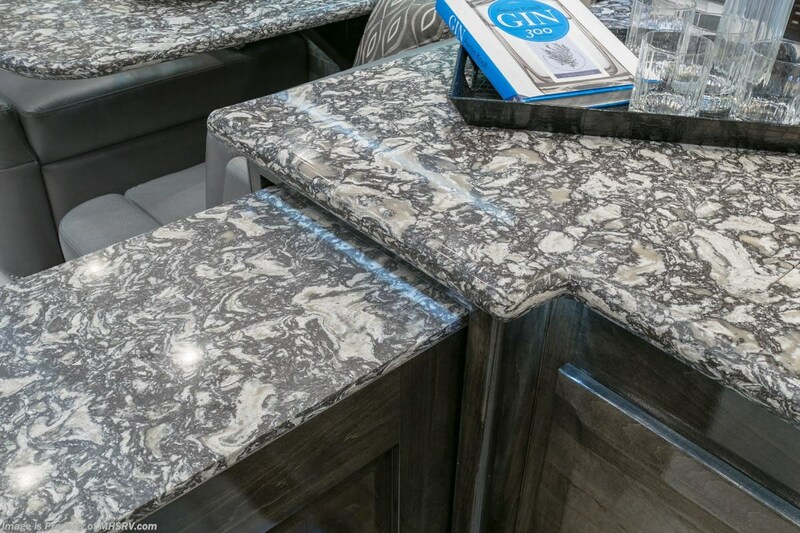 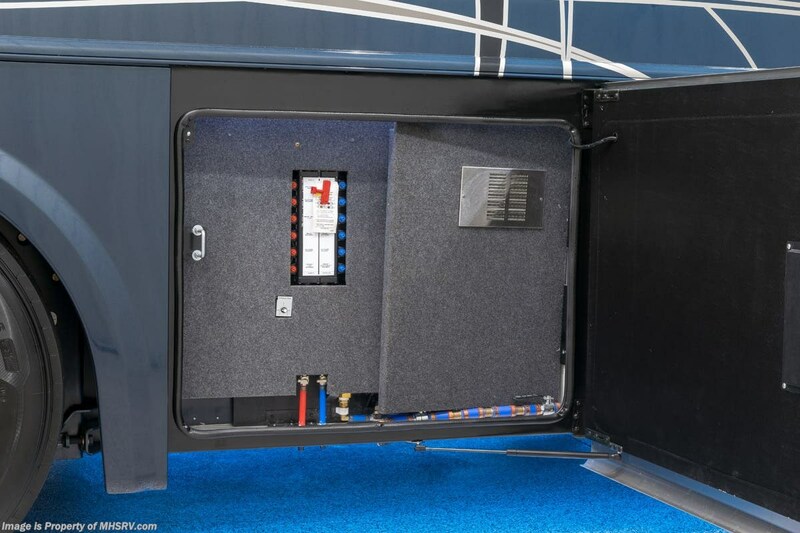 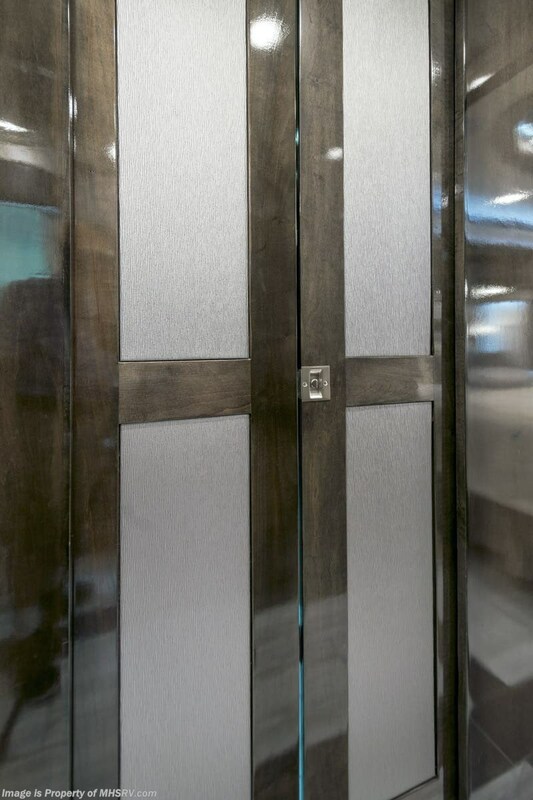 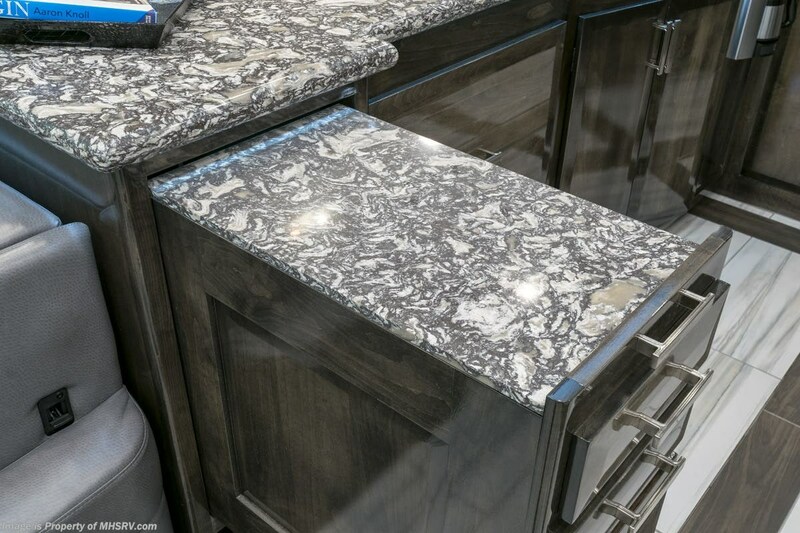 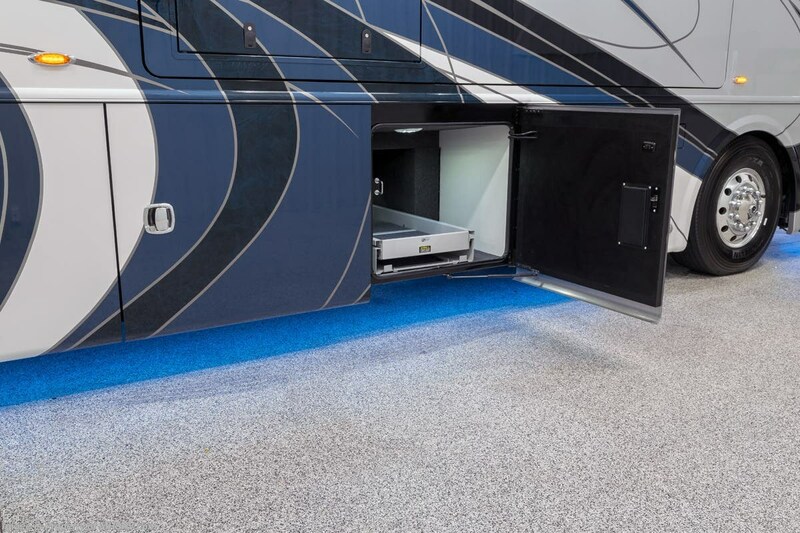 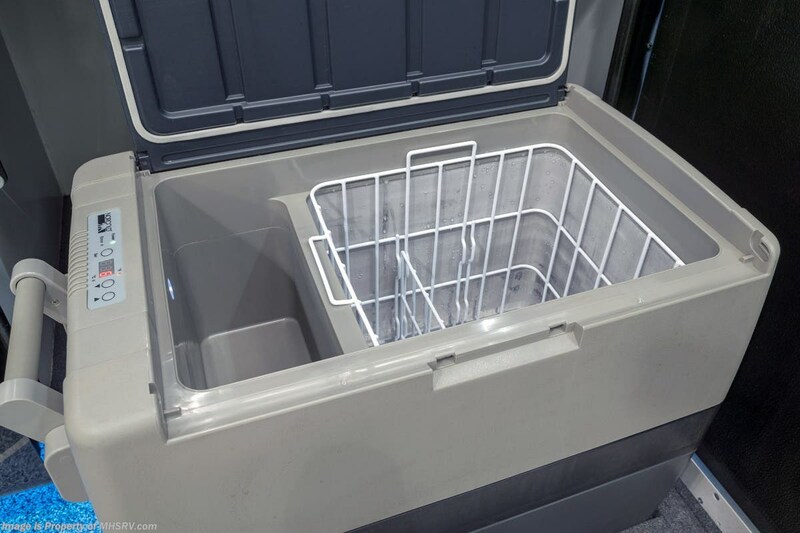 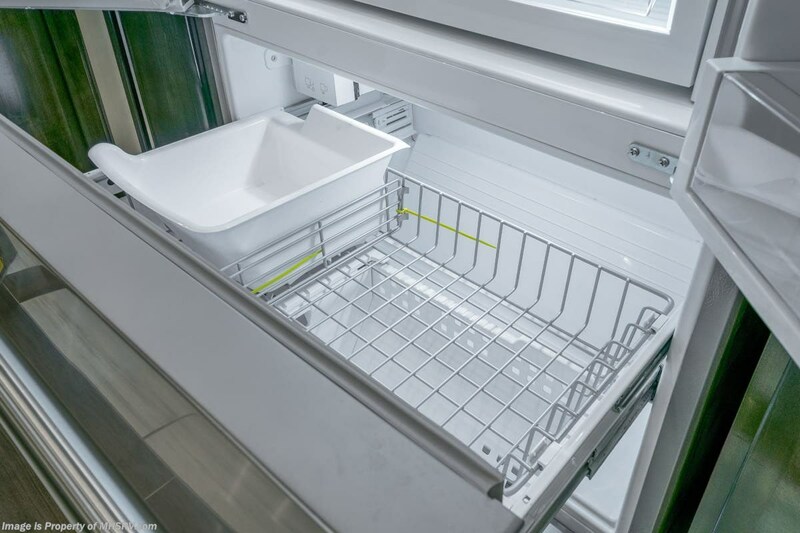 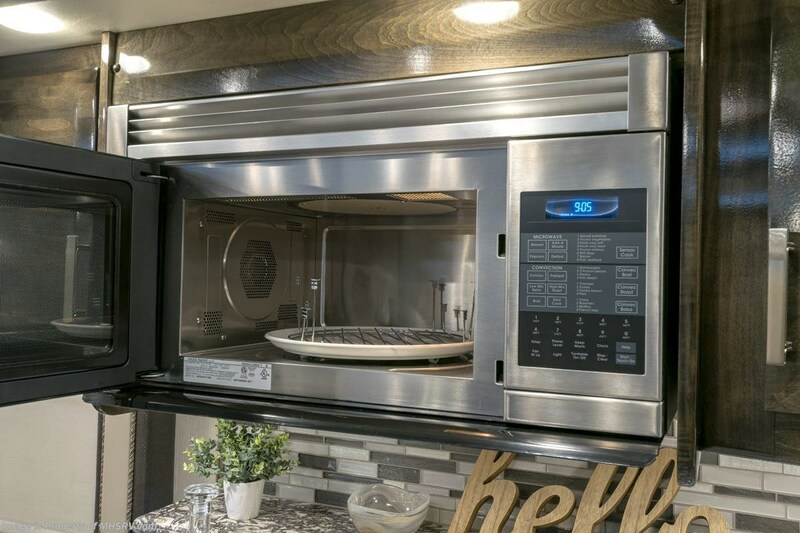 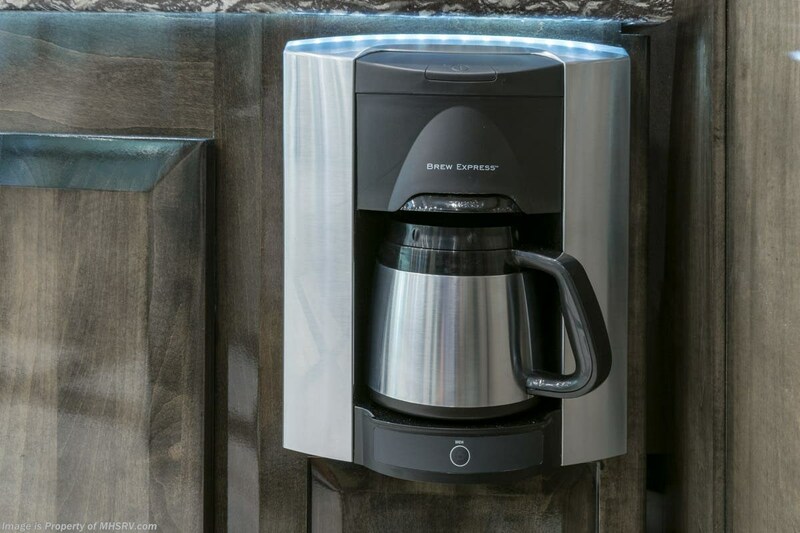 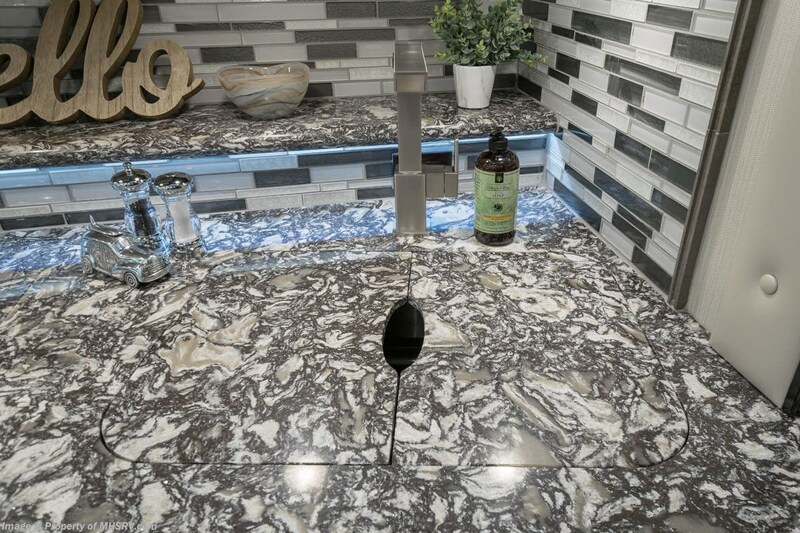 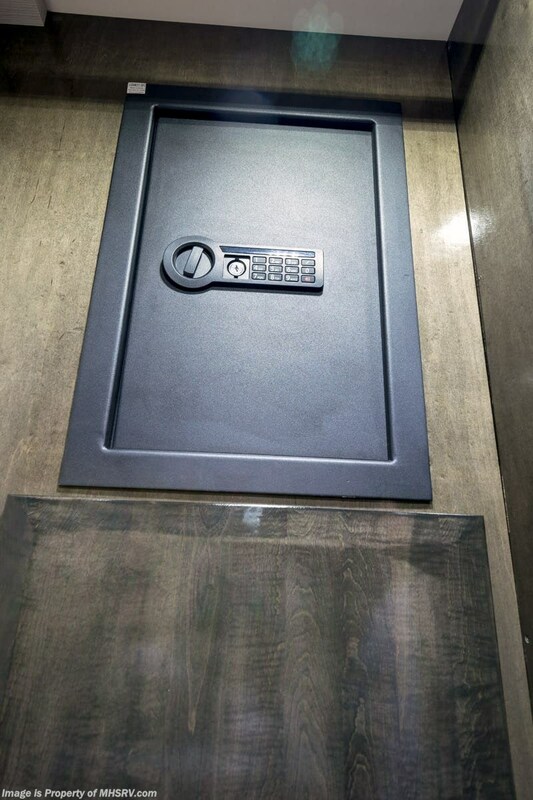 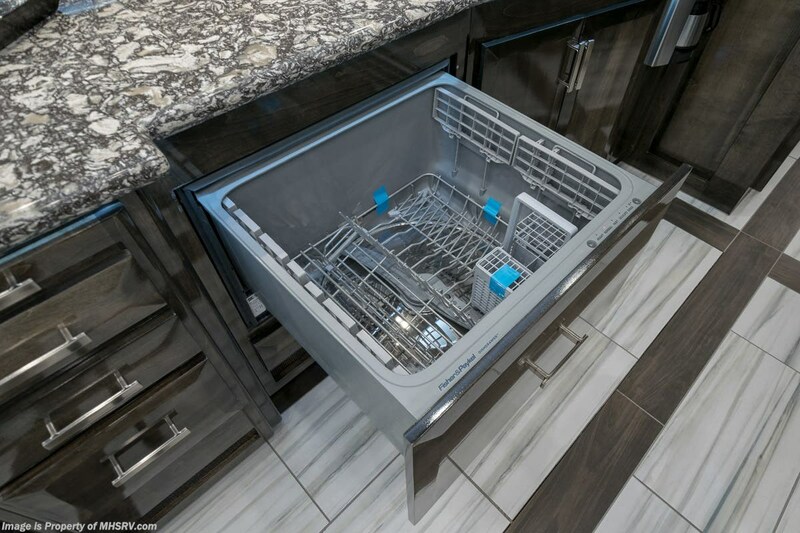 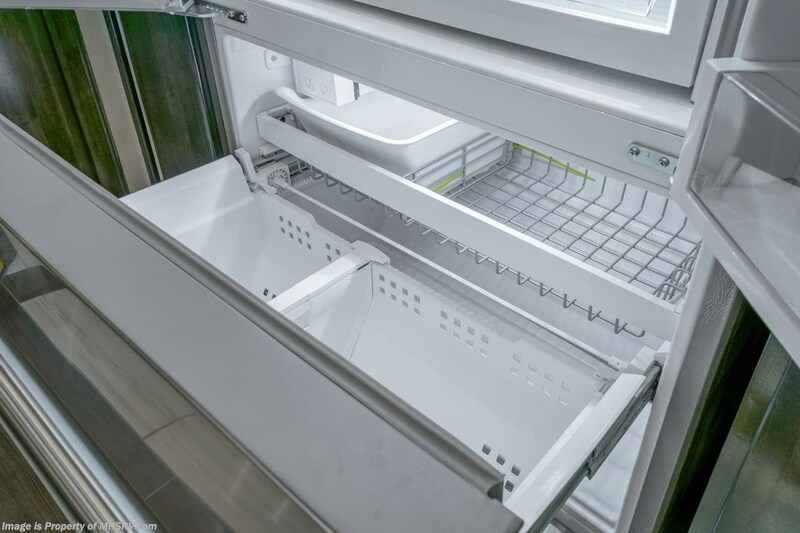 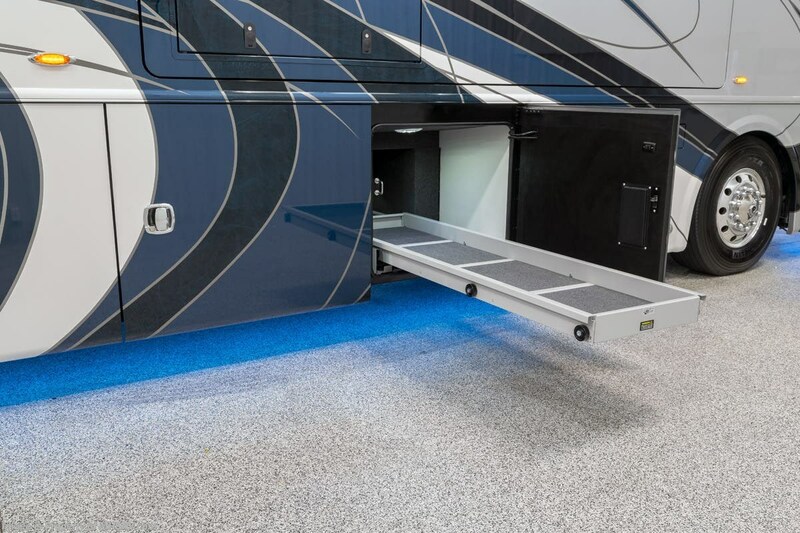 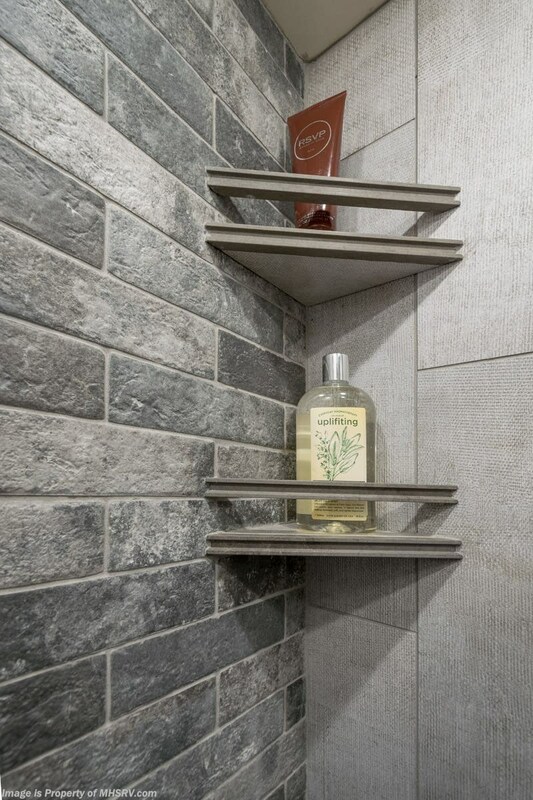 They feature pneumatic seals that provide a literal airtight seal completely around the entire slide-out room regardless of slide position for the premium in fit, finish and function. 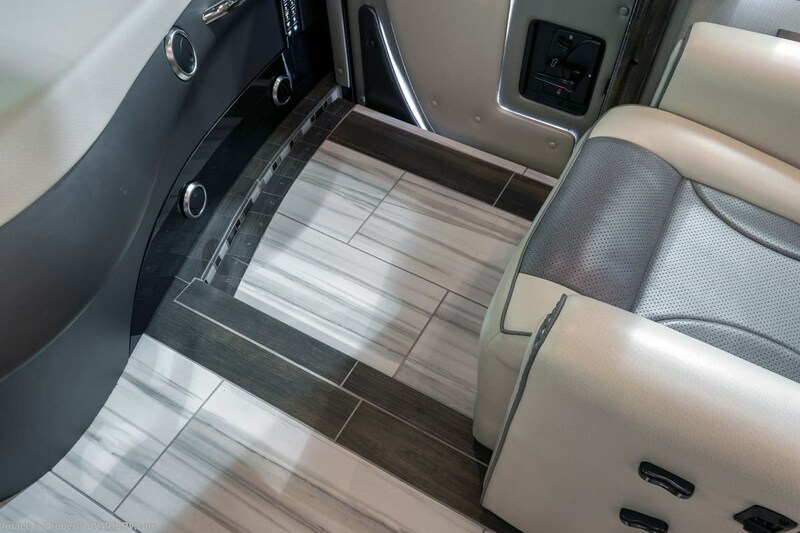 They also feature a power drop down flooring system that gives the Realm not only a flat-floor when extended, but a true flat-floor when retracted as well. 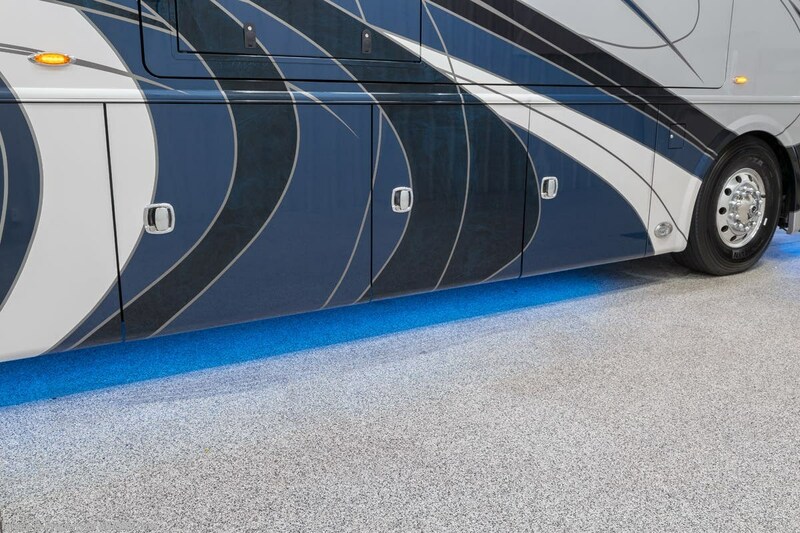 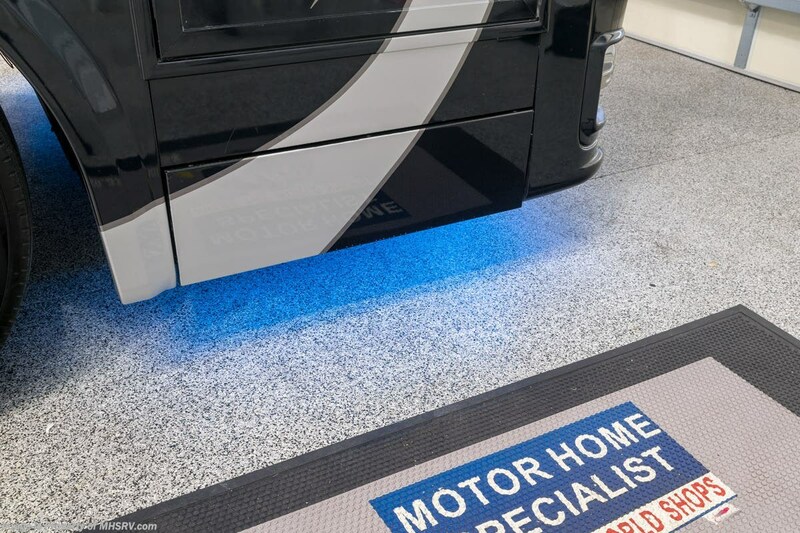 (No carpet lips, uneven floor surfaces, damaging rollers, poorly sealed rubber gaskets, etc.) 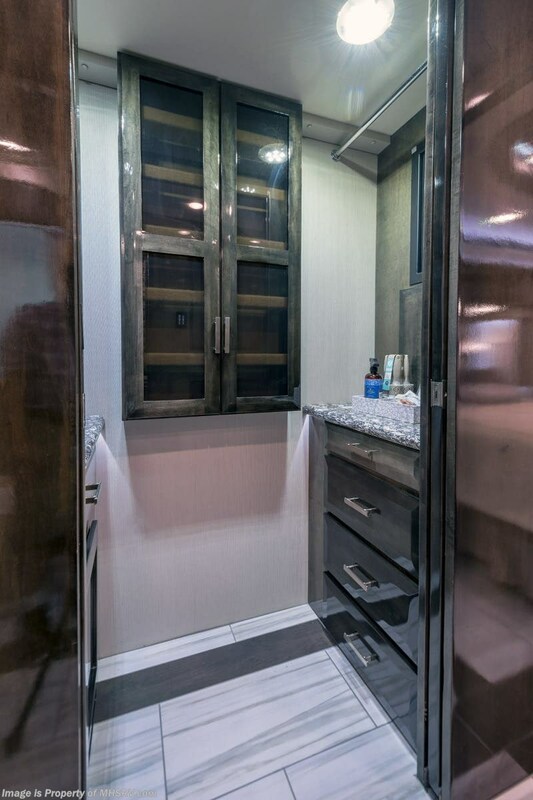 The Realm also features a flat floor bedroom to master bath transition. 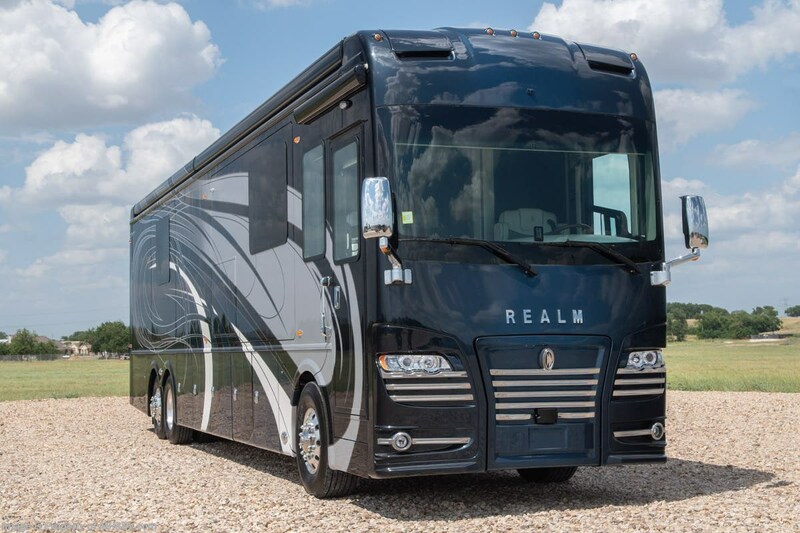 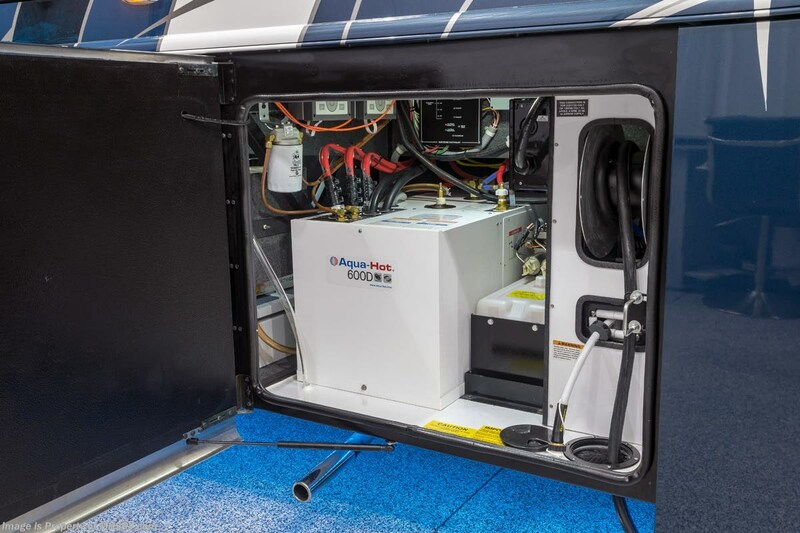 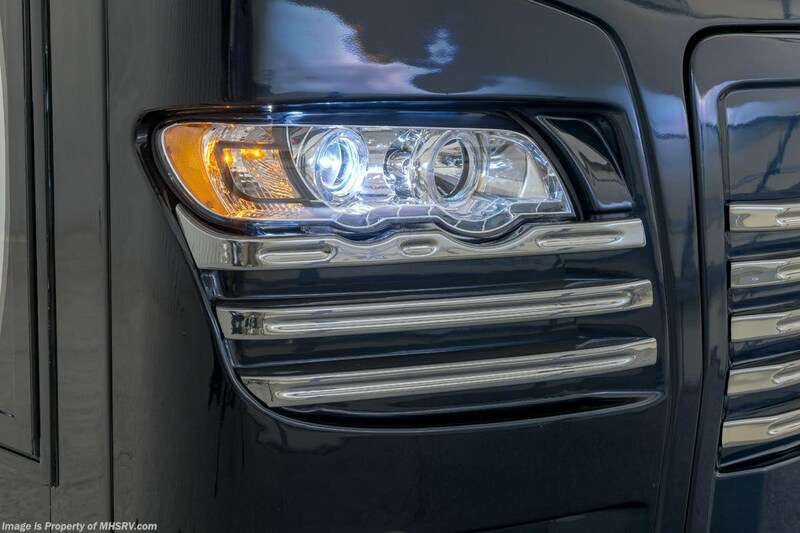 You won't find that in the competition; Nor will you find a *3-YEAR or 50K MILE SPARTAN NO-COST MAINTENANCE PLAN INCLUDED - (A REALM FS6 Exclusive) and a *2-YEAR or 24K MILE LIMITED WARRANTY. 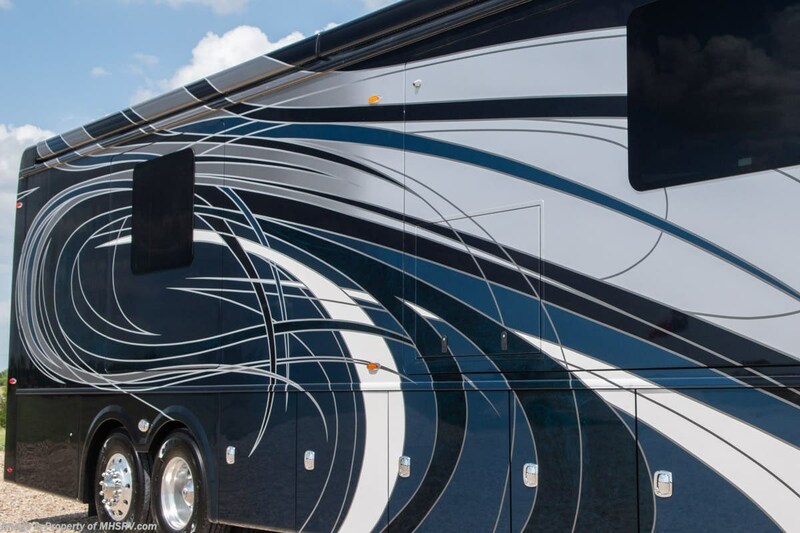 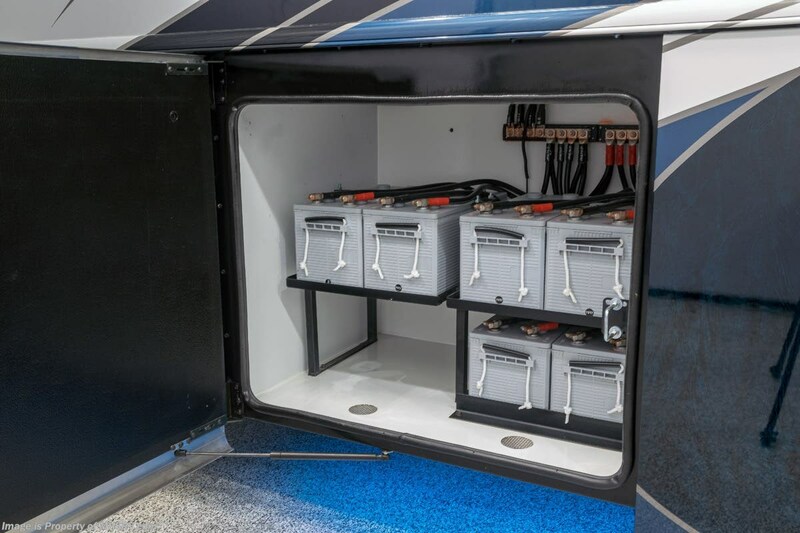 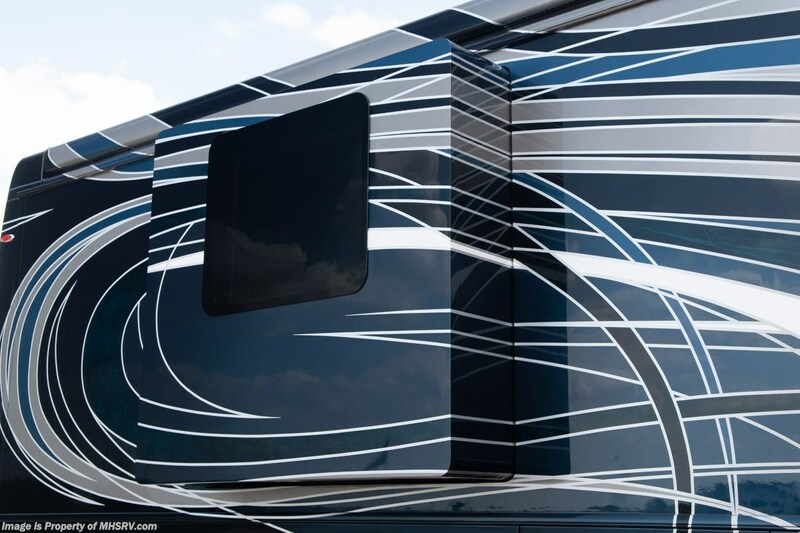 For more details contact Motor Home Specialist today. 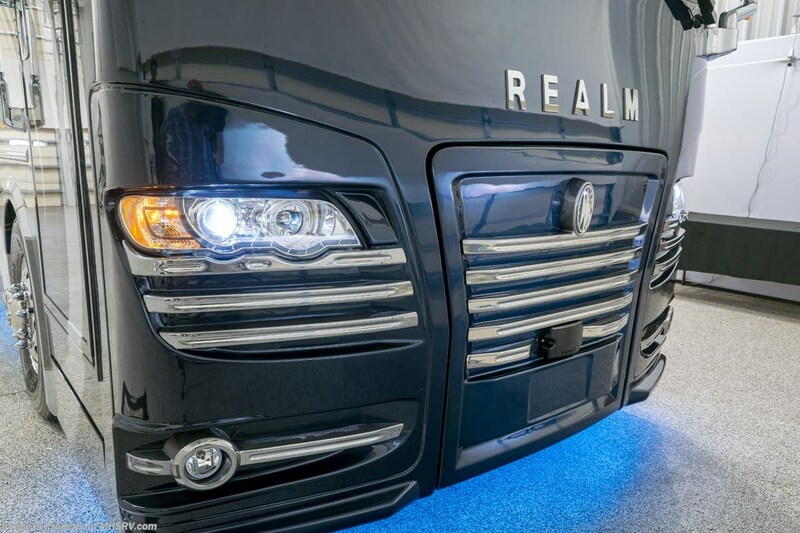 - Realm, by definition, is a royal kingdom; a domain within which anything may occur, prevail or dominate. 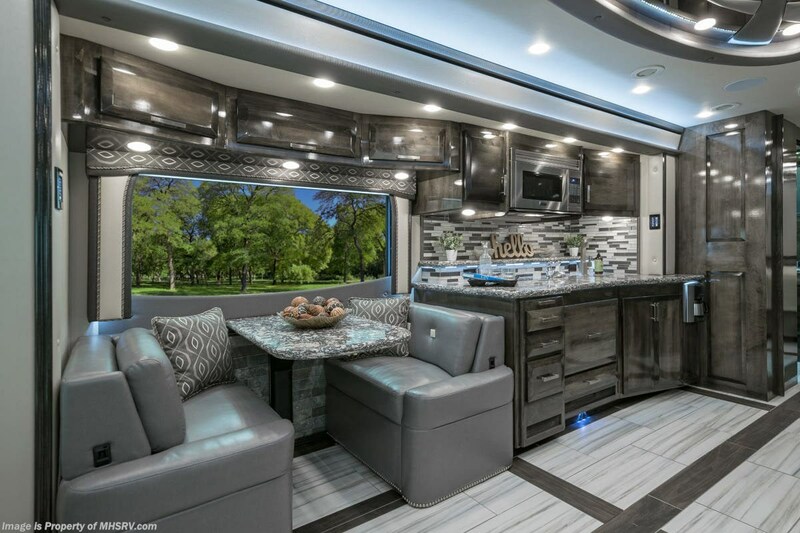 The Realm of Dreams is here and available exclusively at Motor Home Specialist, the #1 Volume Selling Motor Home Dealership in the World. 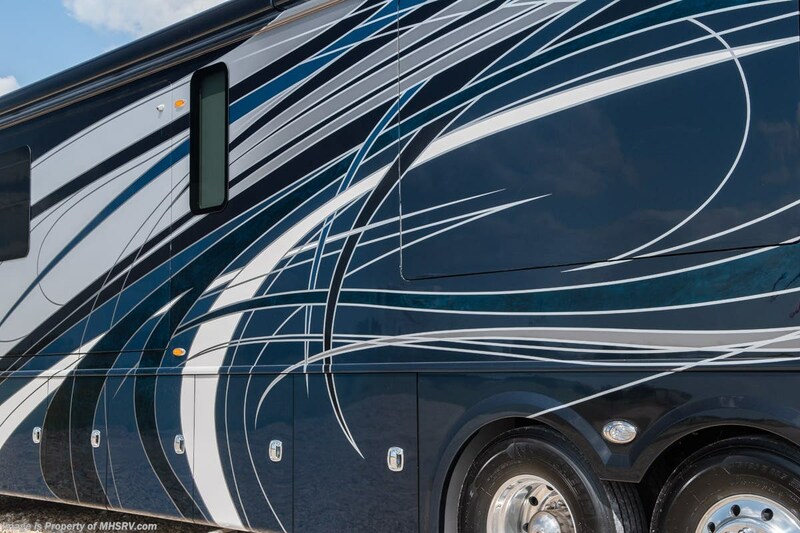 Visit or call 800-335-6054 for complete details, photos, videos, brochures and more. 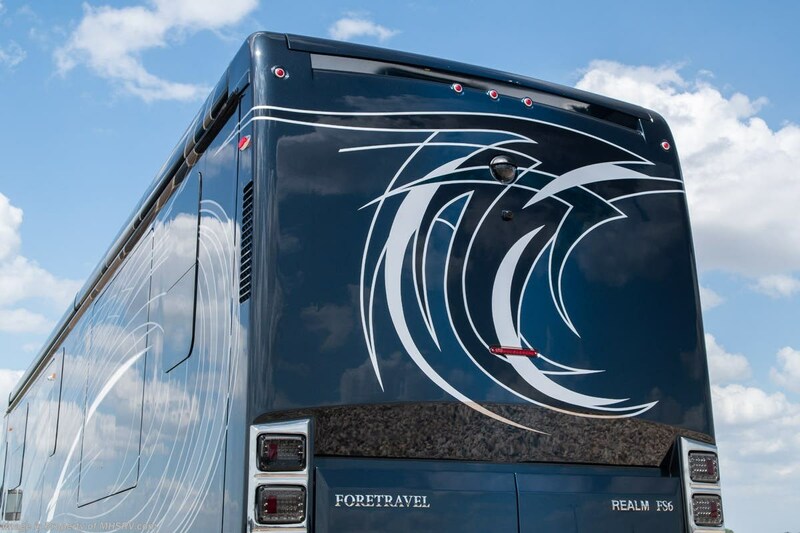 The Foretravel Realm FS6... 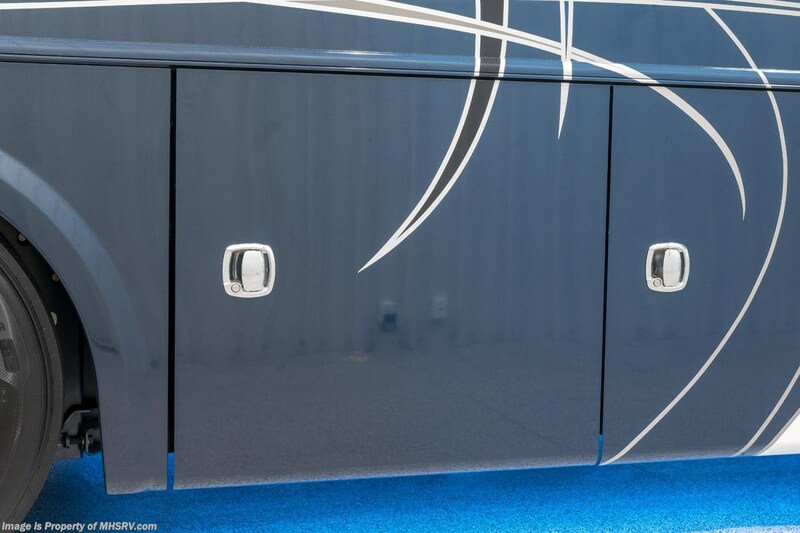 Your Kingdom Awaits. 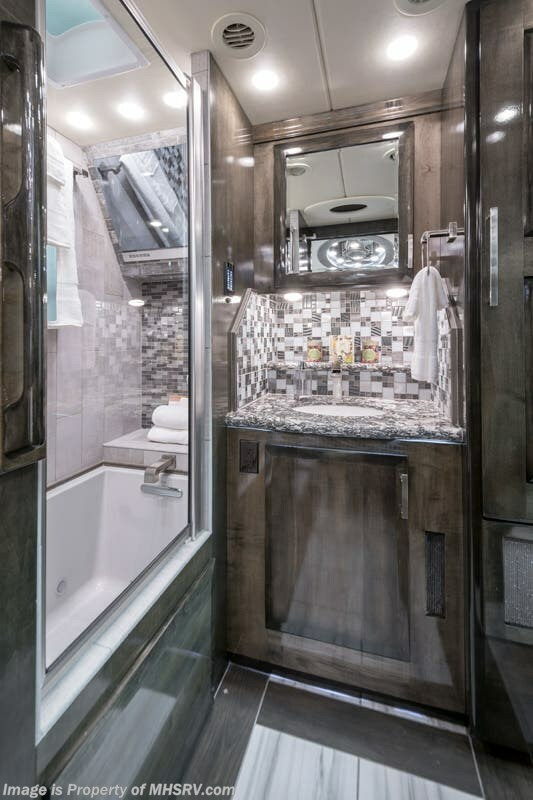 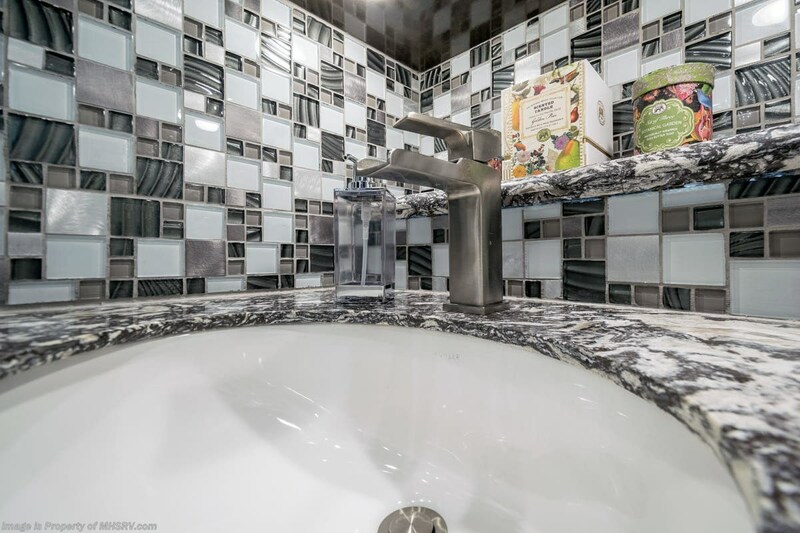 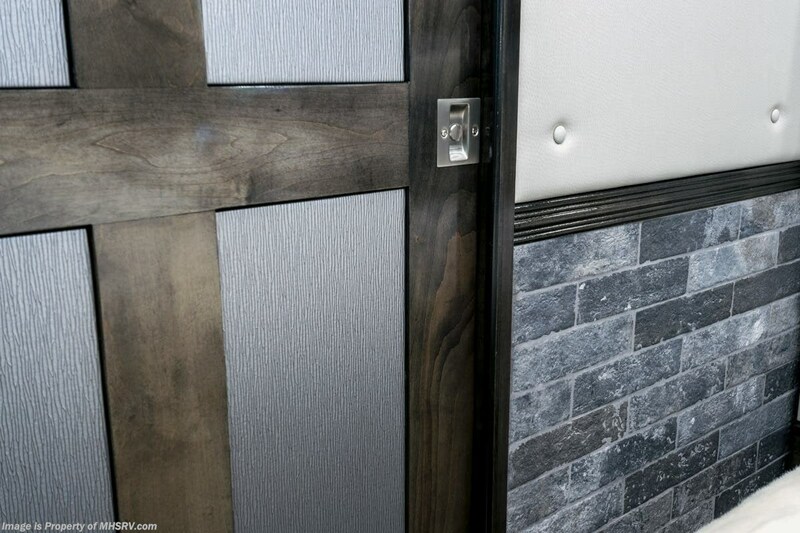 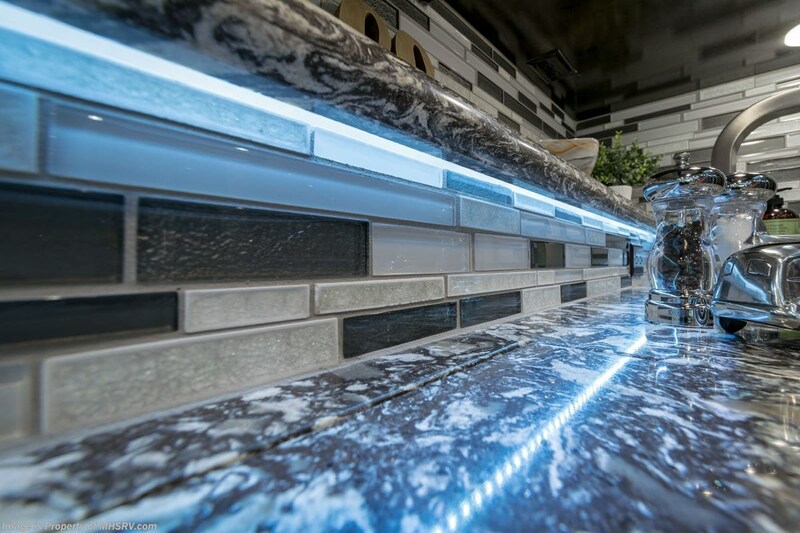 Check out Stock # JFT061781427 - 2019 Foretravel Realm FS6 Luxury Villa Spa - 2 Baths W/Massaging Tub on foretravelrvsource.com!